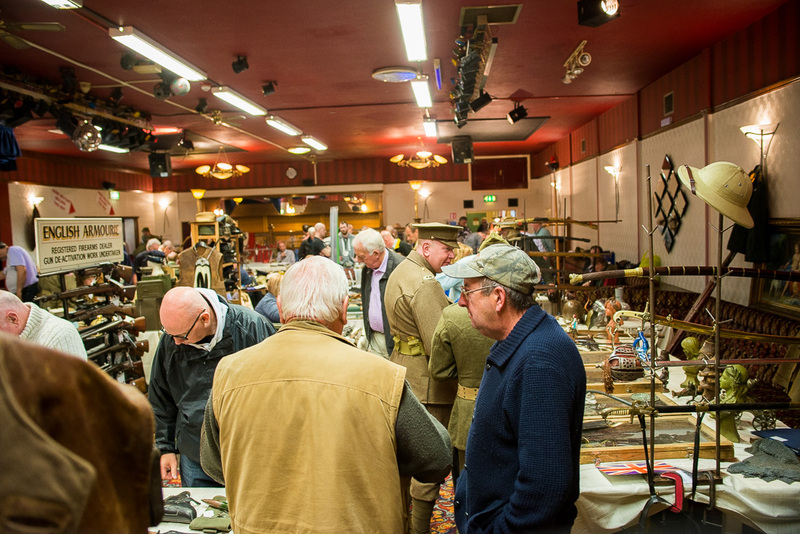 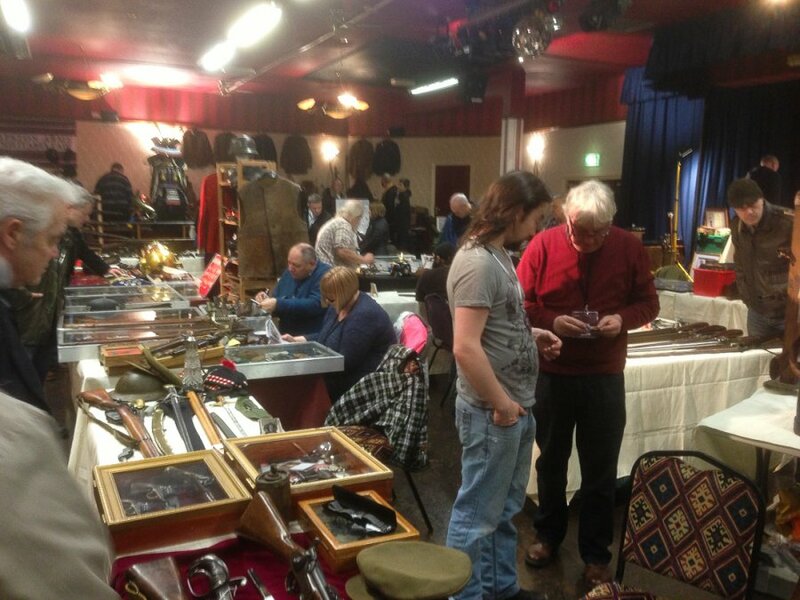 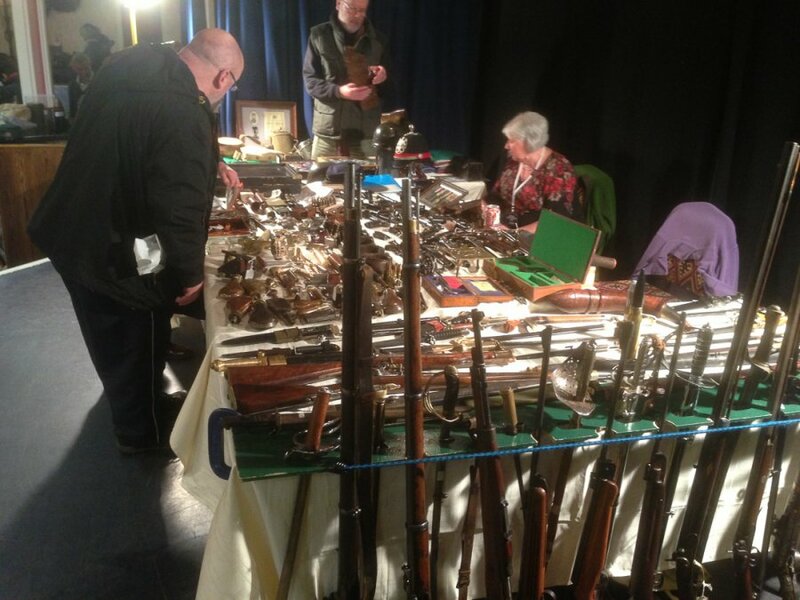 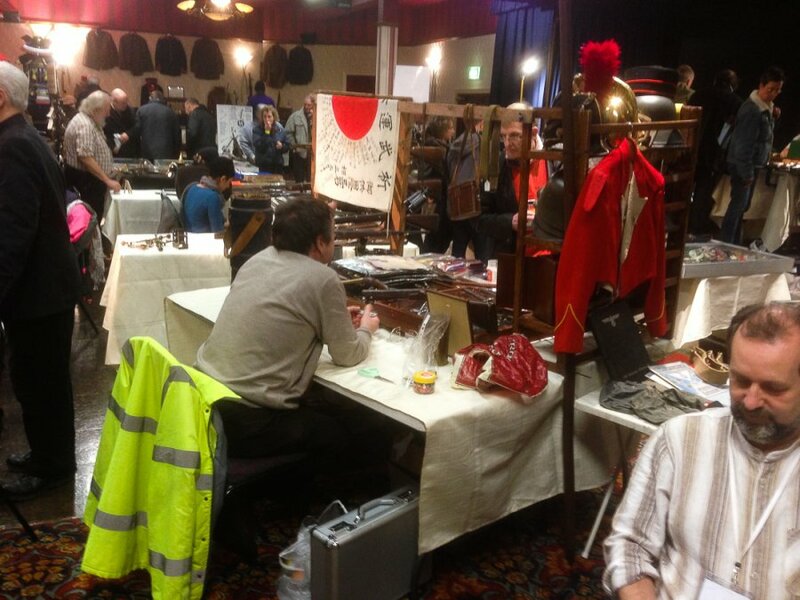 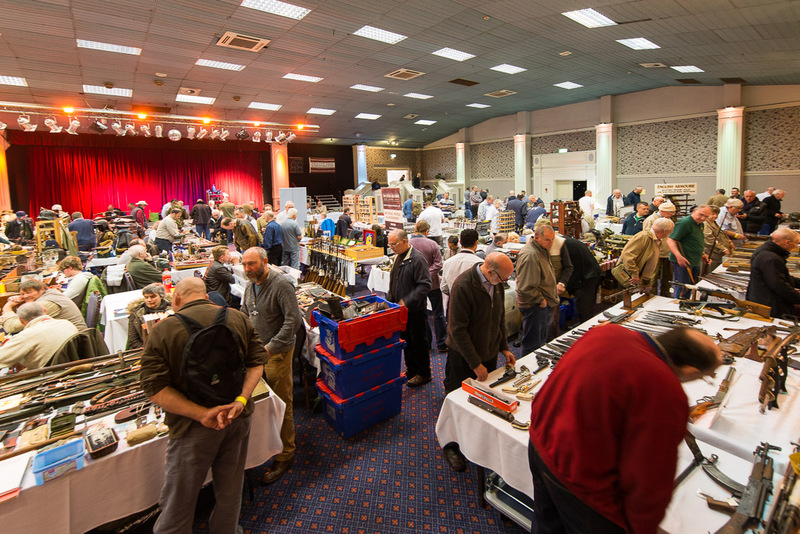 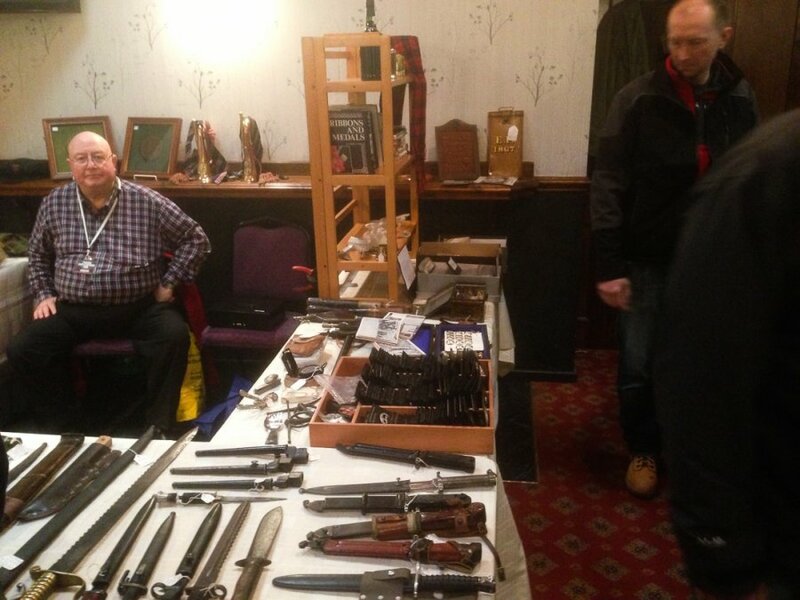 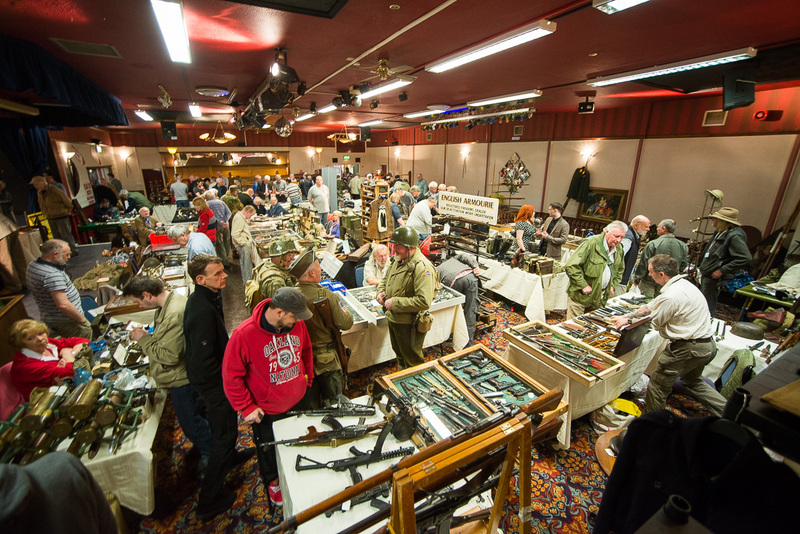 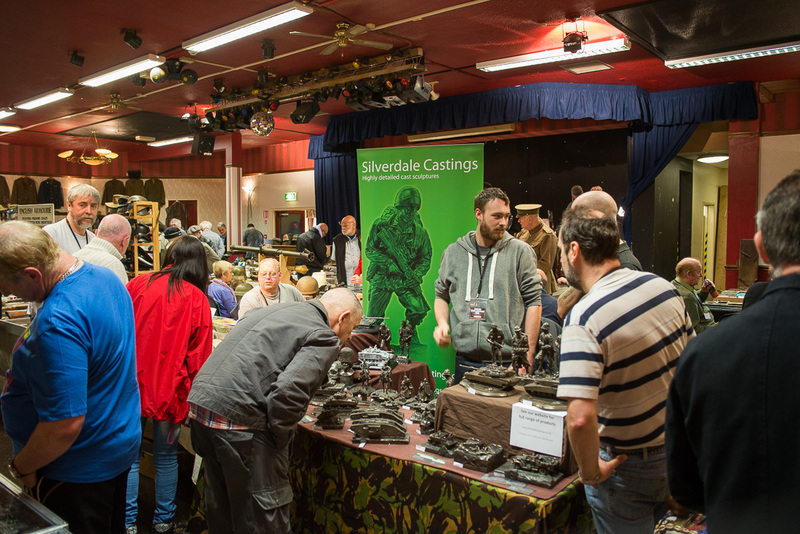 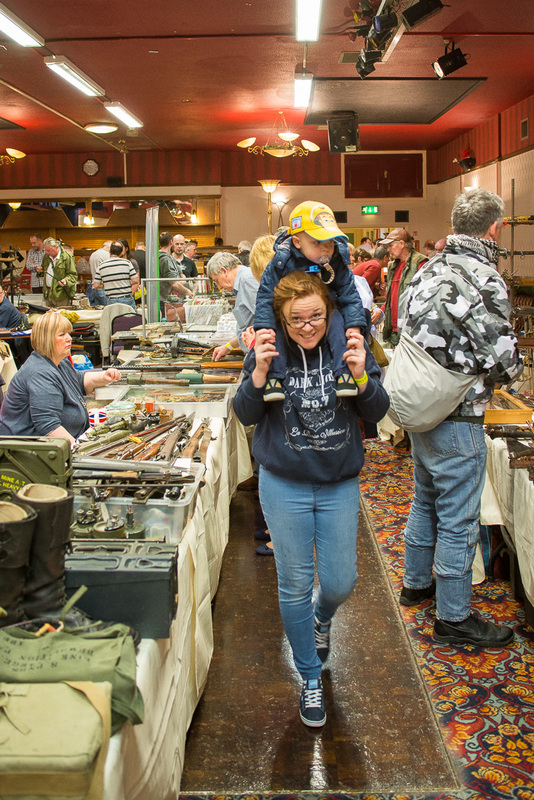 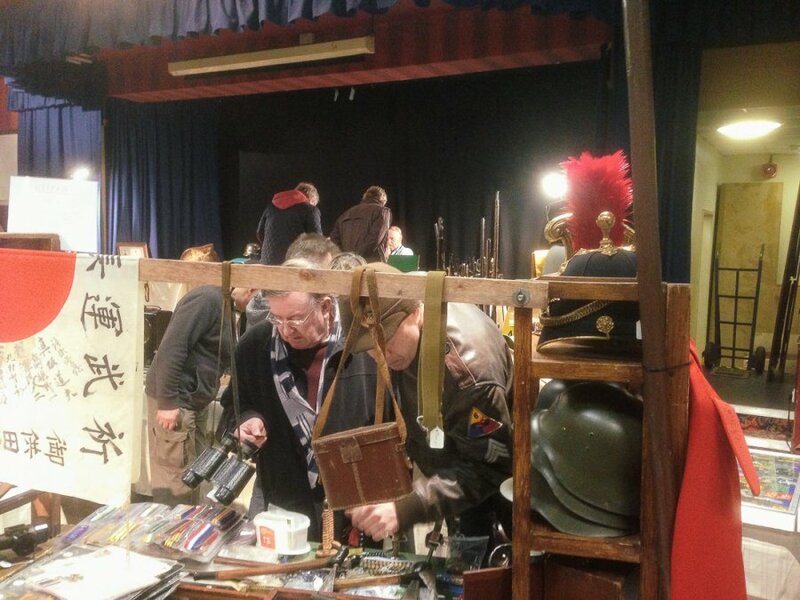 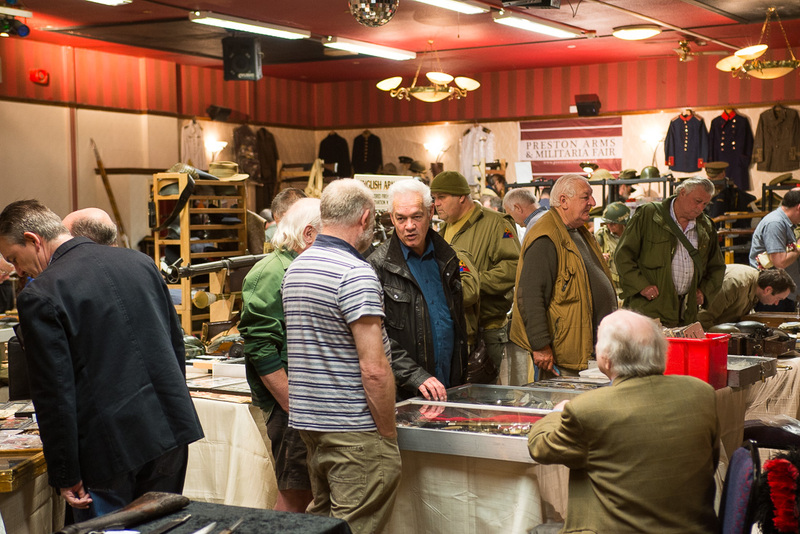 The first Preston Arms Fair of 2016 held on the 6th March was by far the best attended fair we have yet enjoyed. 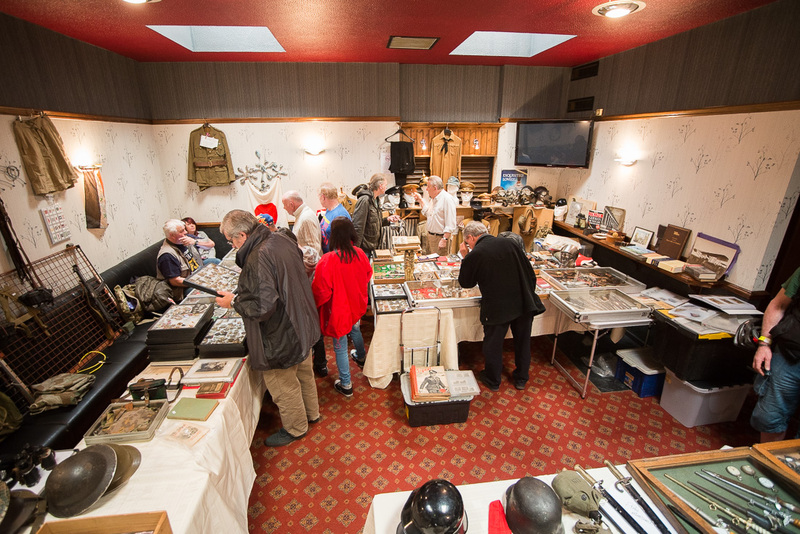 We now have a regular attendance of circa fifty plus dealers with a waiting list so we can always deliver to the our visitors and collectors a full house of dealers to choose from, with a wide and varied scope of artifacts from many eras of history. 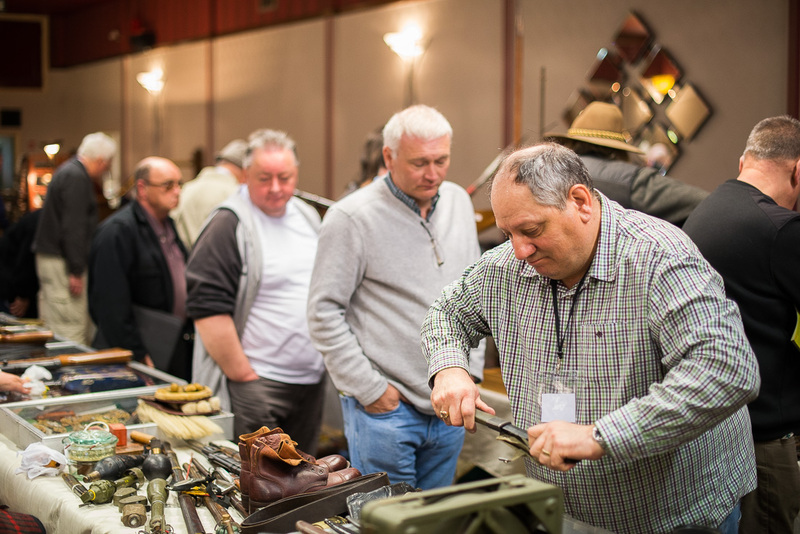 To keep our fair to the forefront of the military collectors world we are now advertising in the following excellent Magazines for each of our Arms and Militaria fairs. 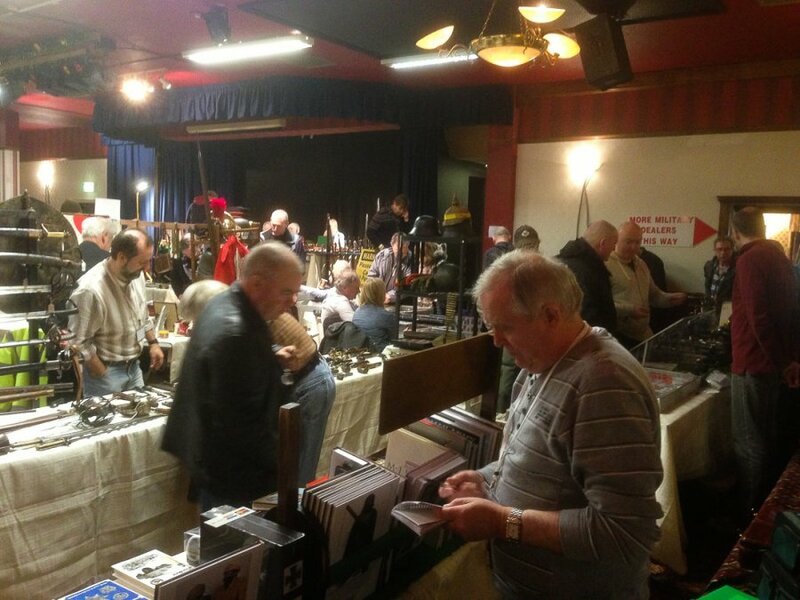 Of course the A5 leaflets , our Website and the best of all, Word of Mouth, are altogether making our fair far more noticeable to UK collectors. 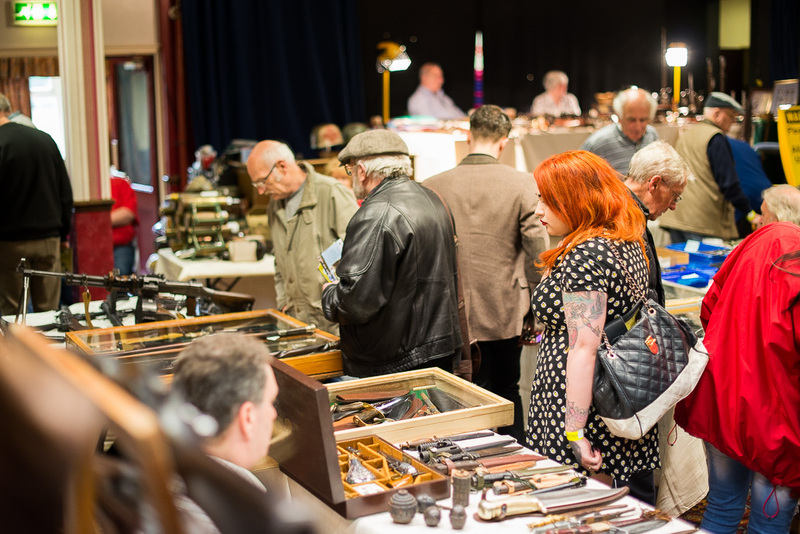 Many of our visitors have travelled some distance to attend, and indeed many of our superb dealers are not just local people but are from hundreds of miles away in many cases. 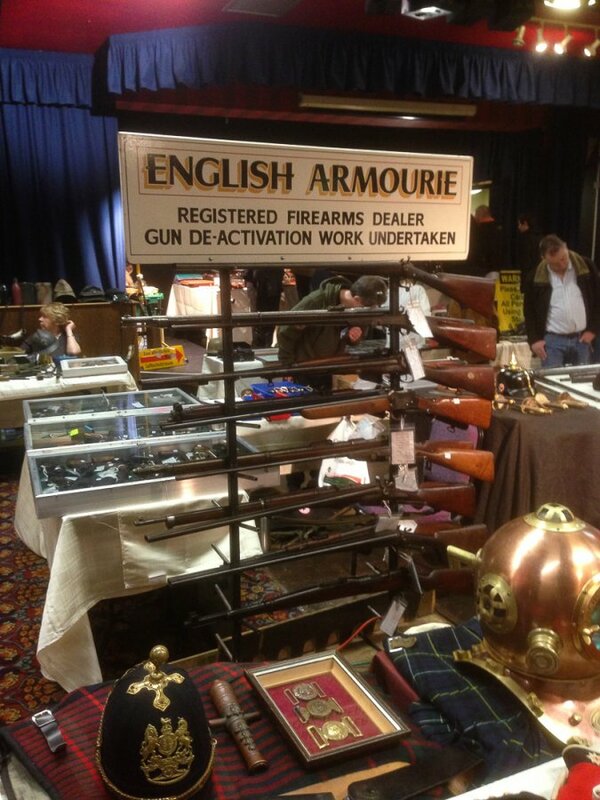 Many of us are awaiting the new regulations for de-activated weapons in the UK ! 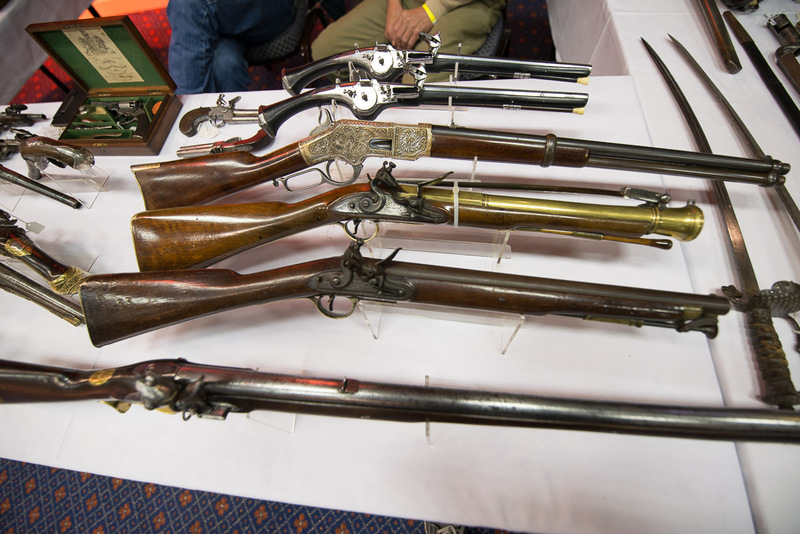 Many rumors are circulating of course, and the wrong Kneejerk reaction to the recent discovery that the weapons used in the recent French massacre were re-constituted and not normal live firing weapons, could have devastating impacts on our hobby. 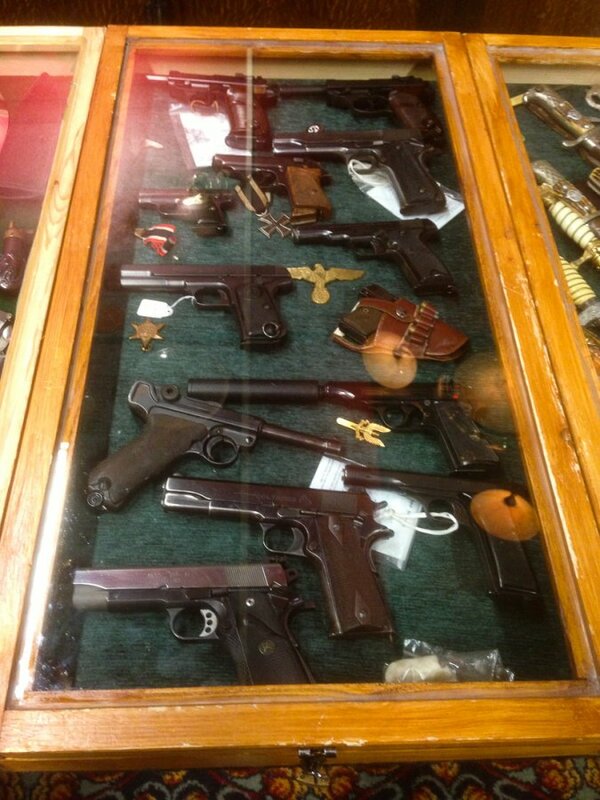 The inference is obvious honest collectors will suffer for this and If all previously legally held de-activated weapons with UK certificates, of both “early” and second variant are “Recalled ” to be welded up , the values of these items would be reduced by at least 50% leaving many honest collectors both out of pocket and very disappointed that their treasured historical artifacts have been virtually destroyed as far as collecting goes. 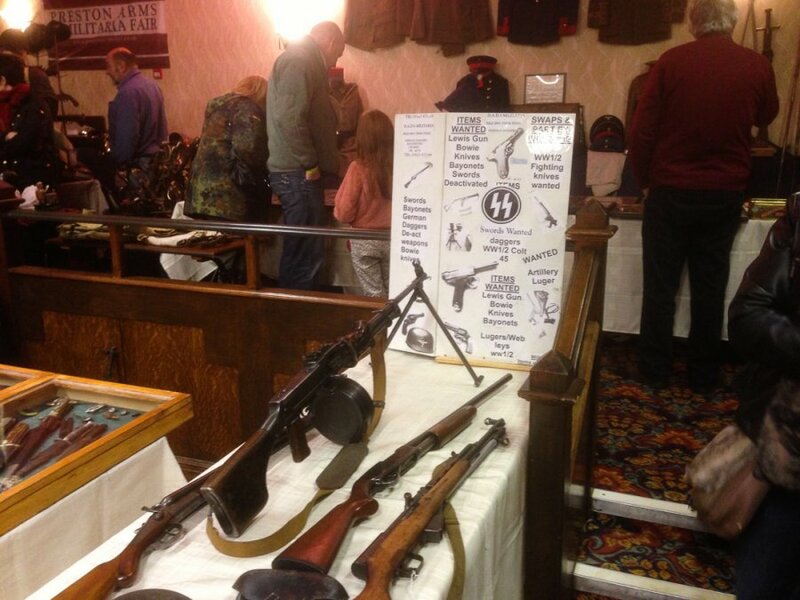 Would Blank Firing Guns and items such as the Shoei FG42 replica be exempt? 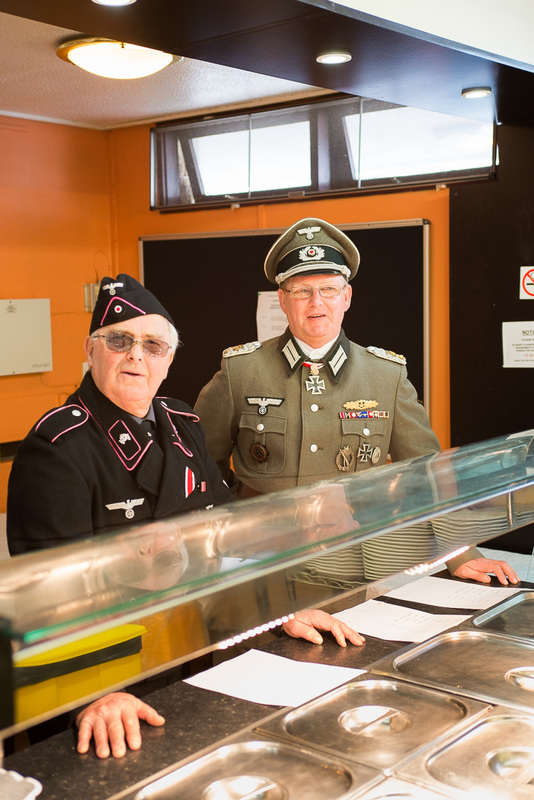 I imagine no thought by those making decisions ( Who the hell are these people ? ) 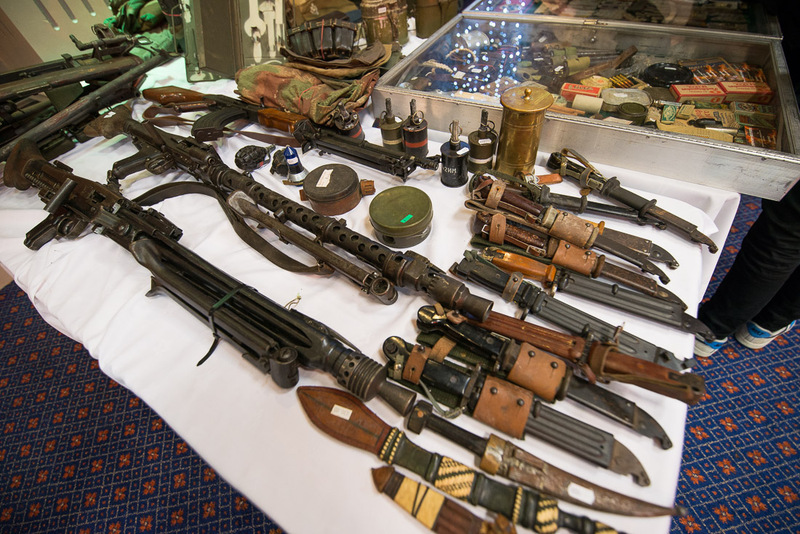 has gone into the logistics of how and who would be welding up these vast amounts of de-activated weapons ?? 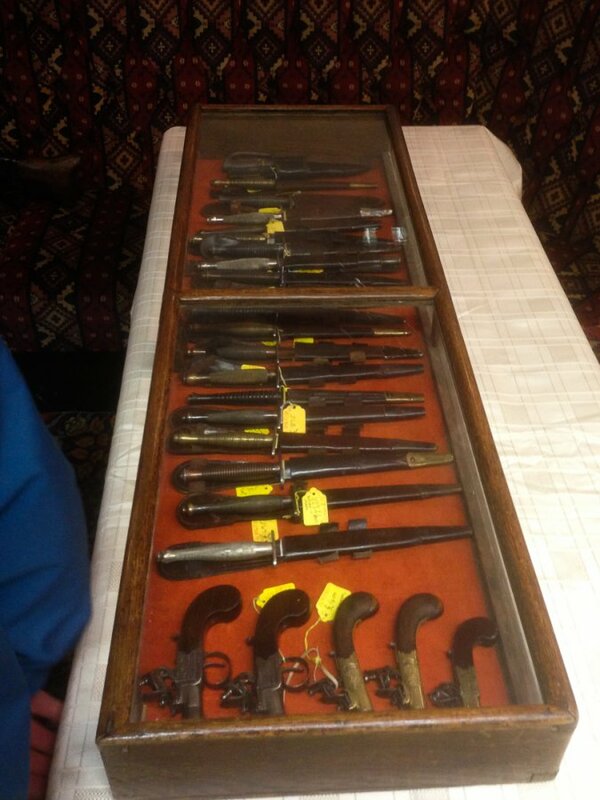 Costs etc.. ( This is to pay to have your item to be butchered !! ) 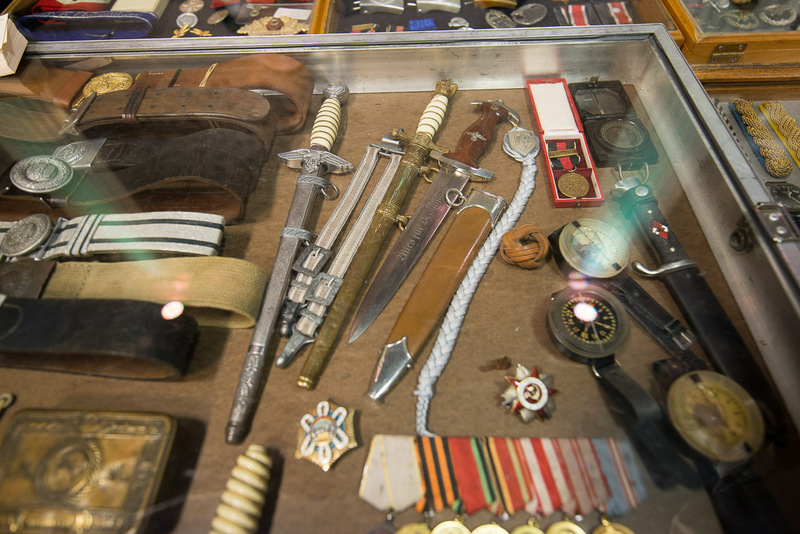 Would you ever see your item again?? 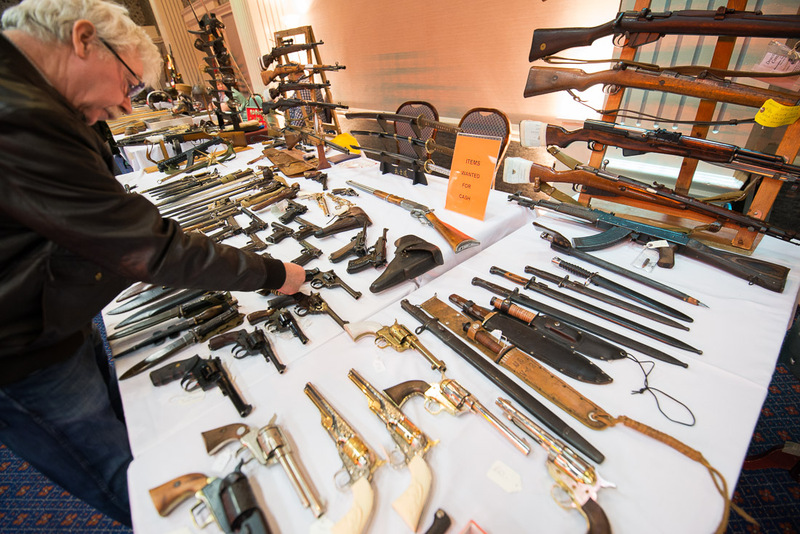 We hope many of us has contacted our MP’s and MEP’s to urge them to work against this new ruling, if we do not the authorities will feel that no one is interested and will pass unhindered regulations. 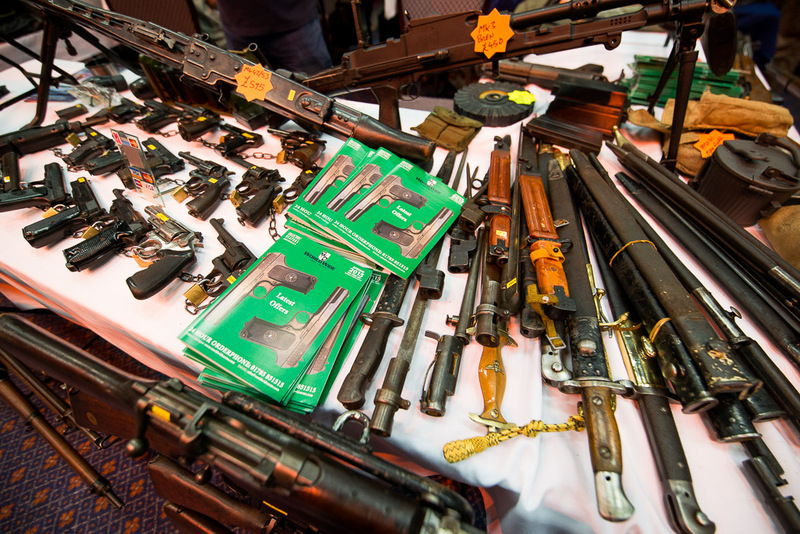 The existing regulations are more than enough to control collecting de-activated weapons ……..All that needs to happen is that European specifications are brought up to UK standards…Job Done !! 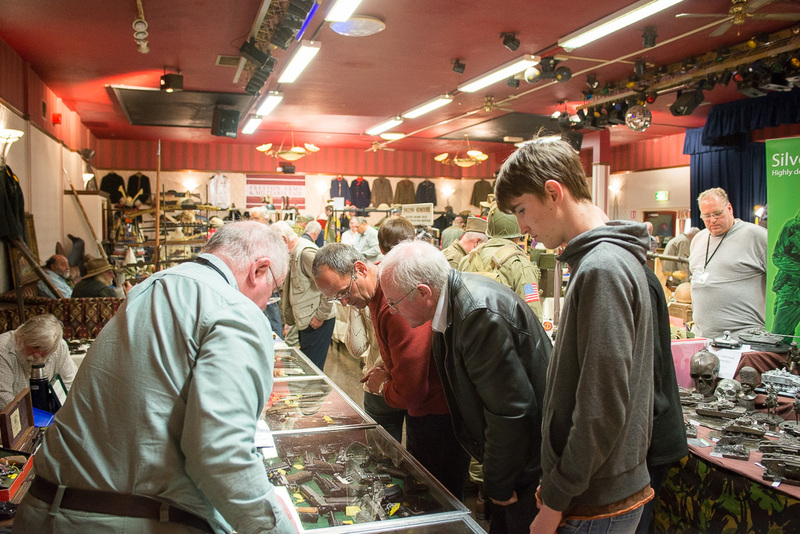 We wish you all an exciting 2016 in the collectors world and that you find those special items for your collection ! 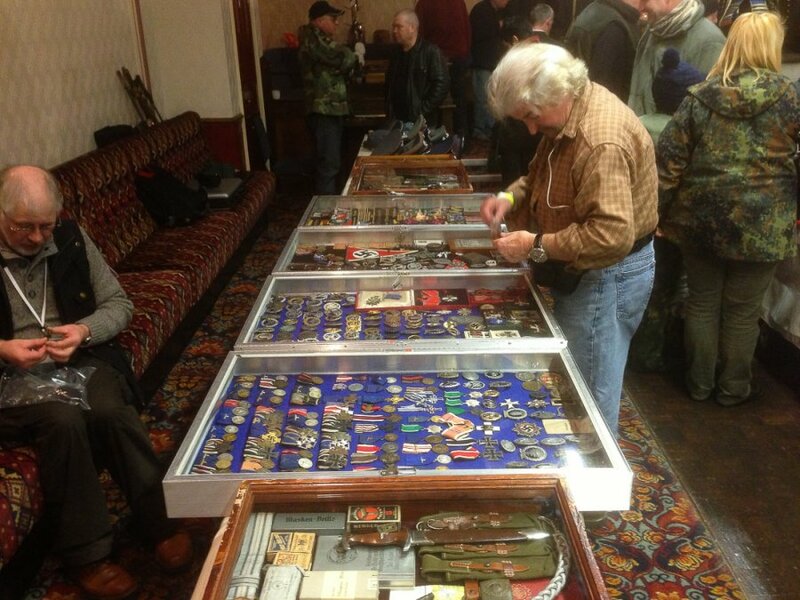 As usual the last Fair of the year fell on Remembrance Sunday . 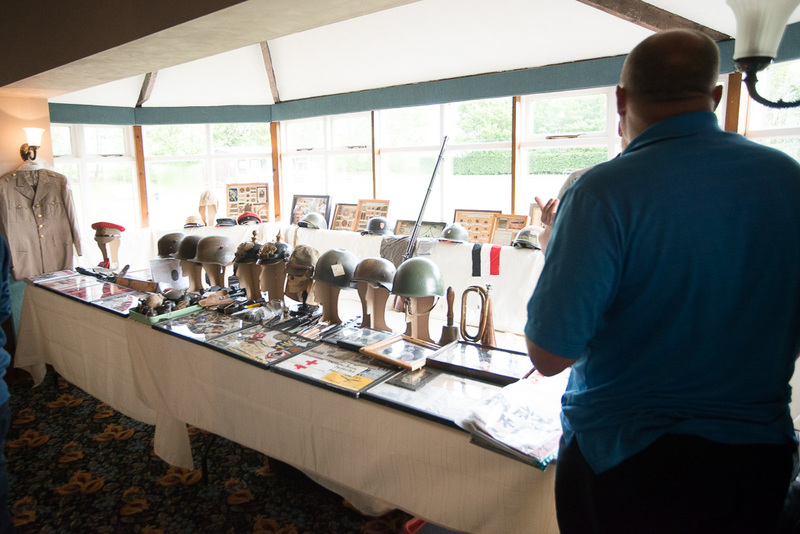 A two minute silence in memory of all of the British and Allied Soldiers both killed and wounded in the two World Wars and in all the conflicts that have followed, including the brave Soldiers confronting the present terror in Iraq and Afghanistan, we remember them all. 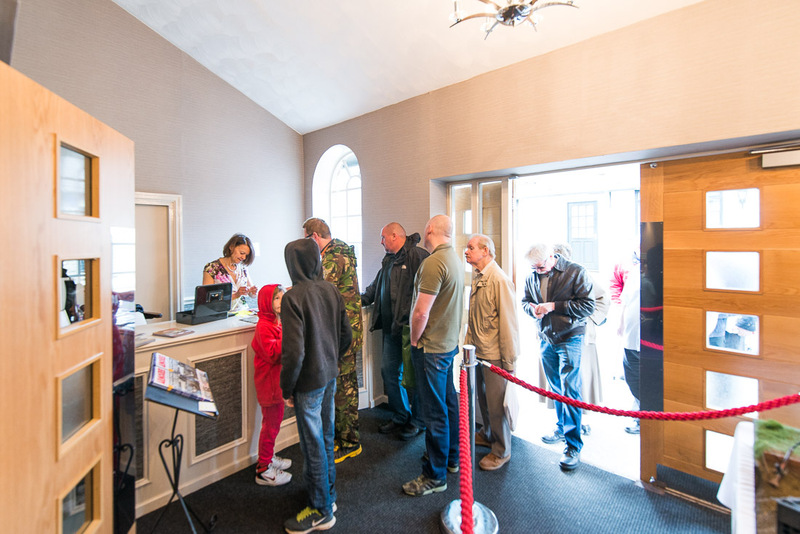 Poppies were for sale in the reception and a good amount of money was collected for the Royal British Legion. 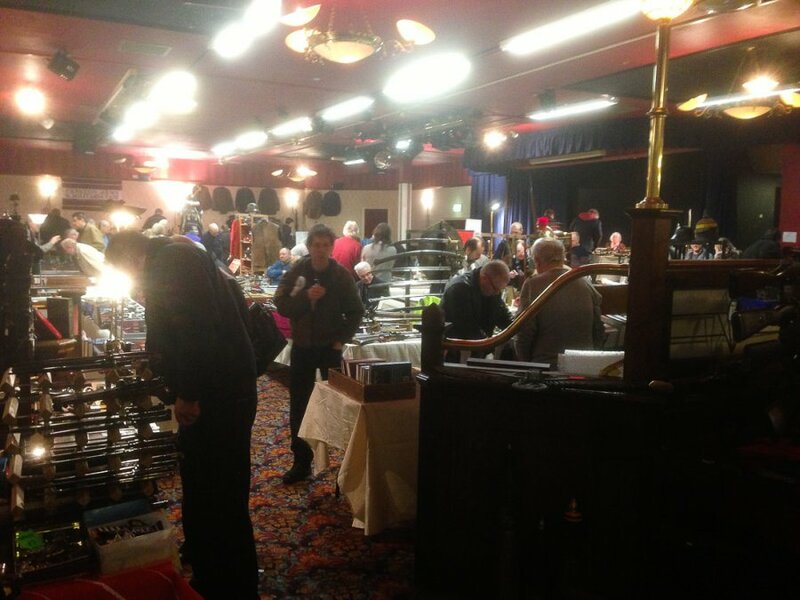 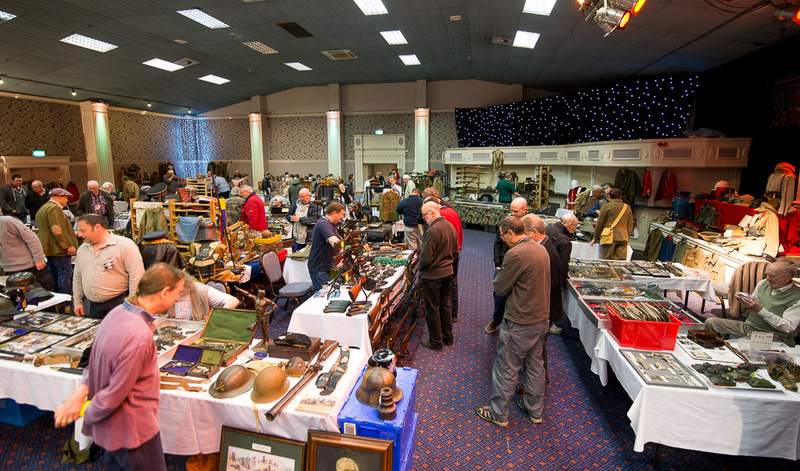 We are very pleased to report that this fair was probably the best ever, there was a very steady stream of visitors throughout the day and indeed people were still coming in at 2pm ( Free of charge at that time ) The atmosphere was very good and most dealers reported excellent sales , and purchases ! 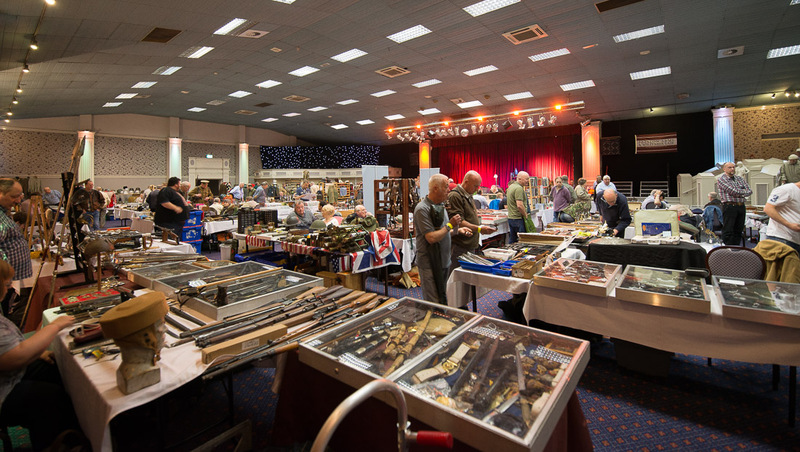 Despite moving to the much larger Park Hall Hotel, we are building up a substantial waiting list for tables from dealers in the North West and further afield, must be doing something right ! 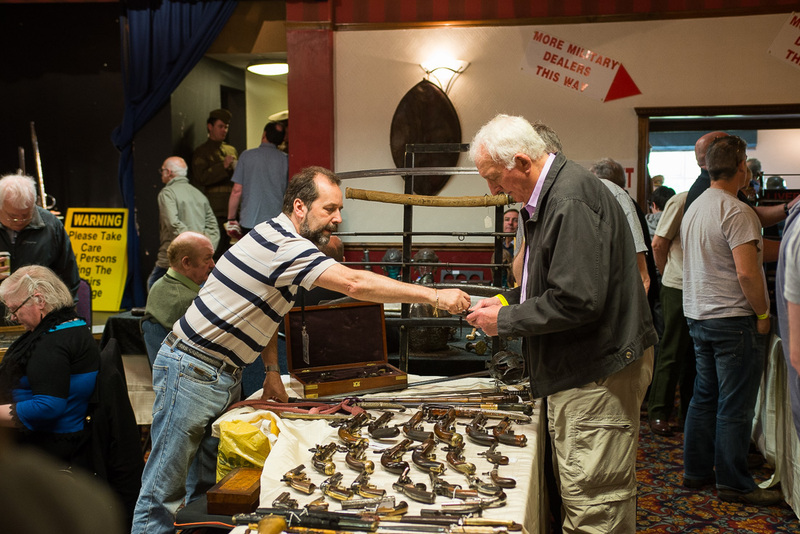 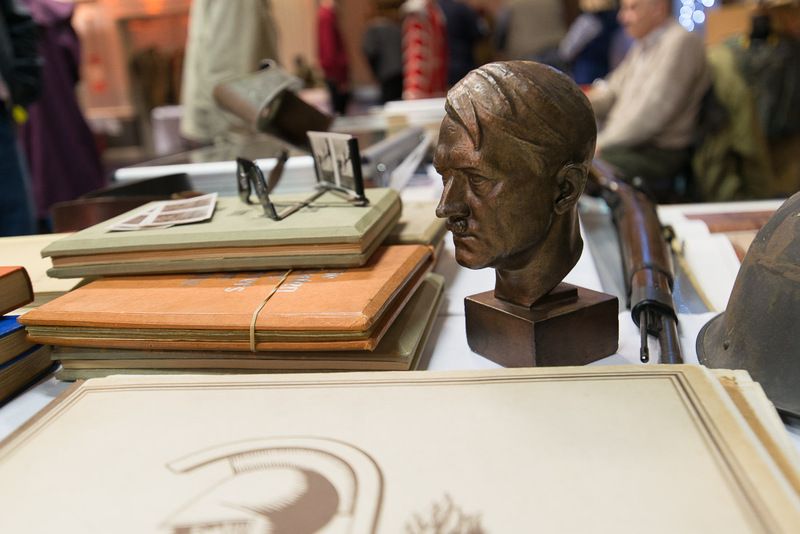 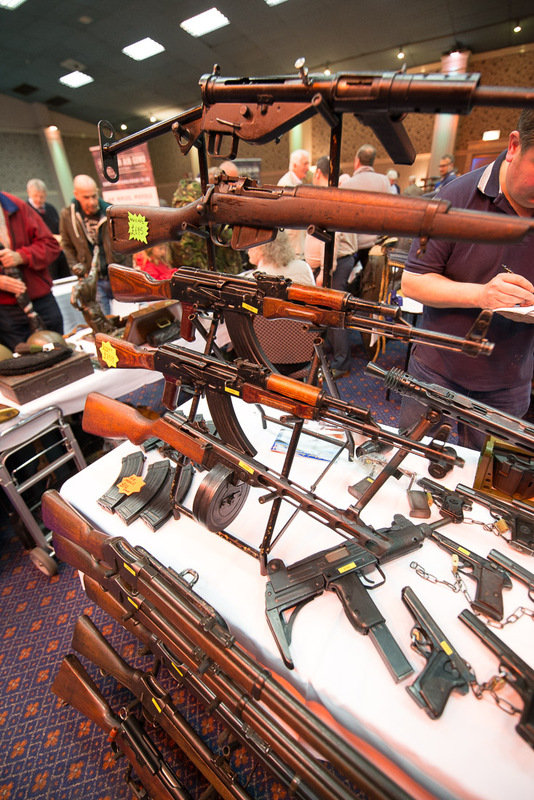 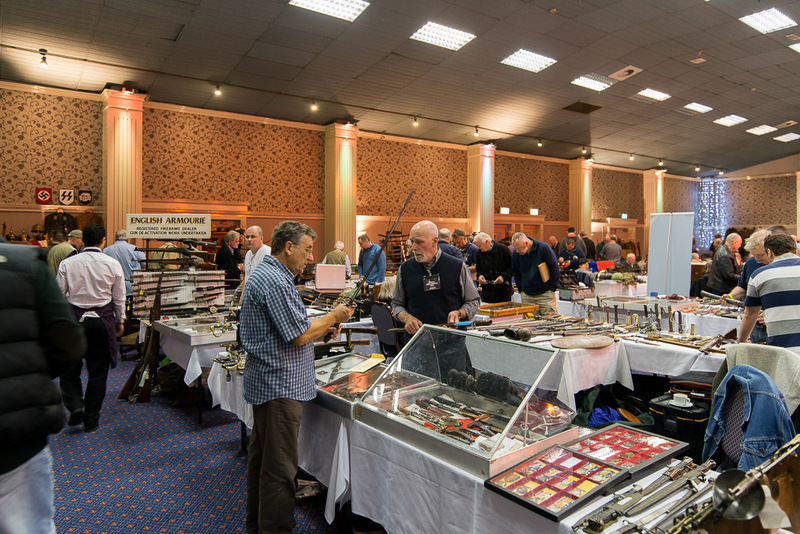 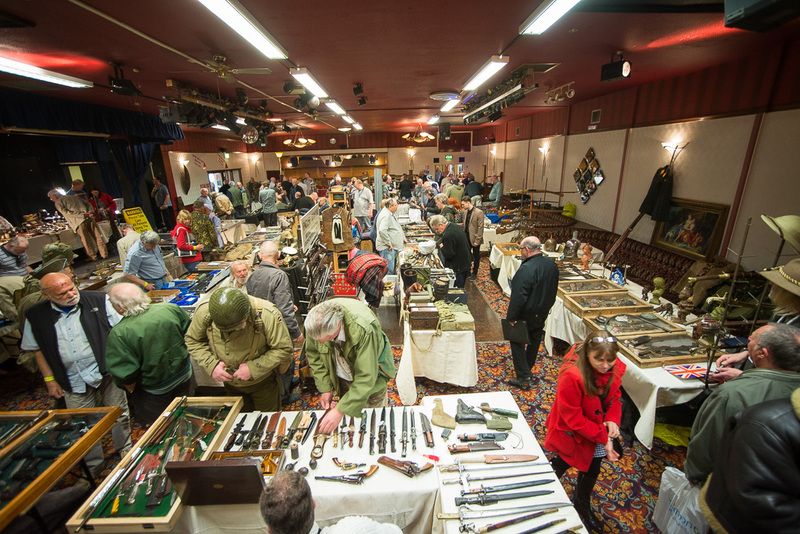 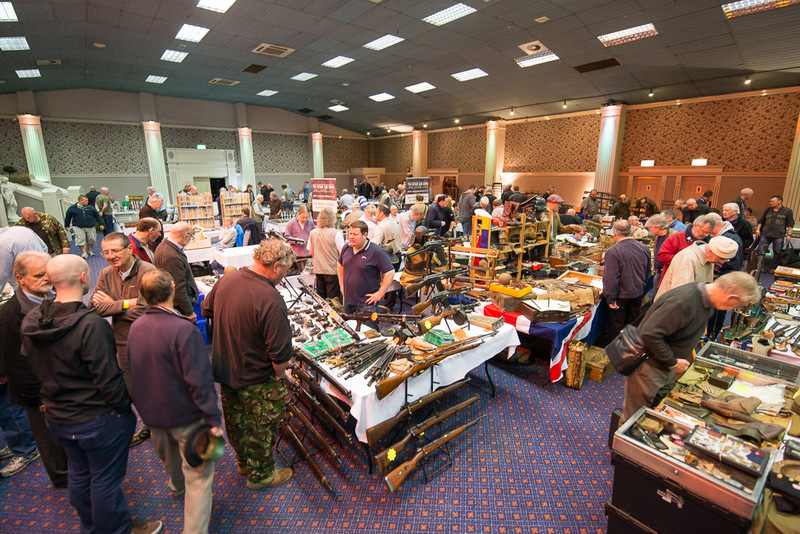 Our next Arms and Militaria Fair will be held on Sunday the 6th March 2016 and we hope to see many of you there, and as always drive carefully and enjoy your hobby. 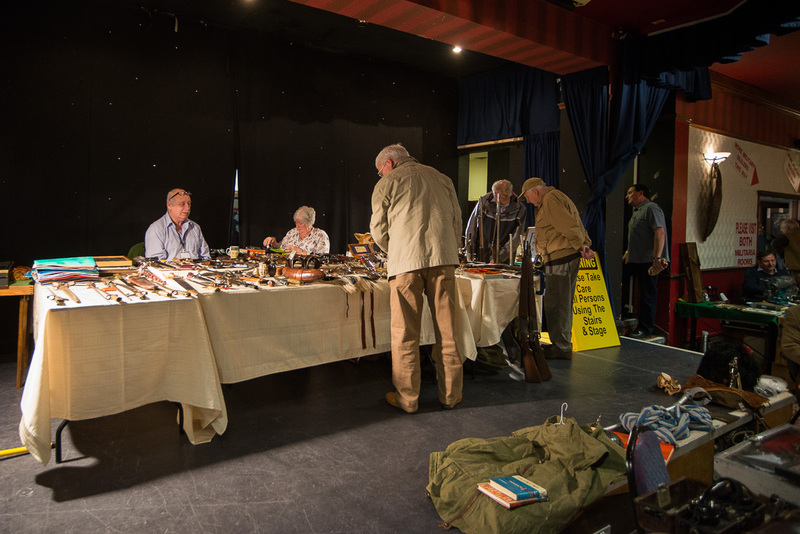 ” Our latest Fair held on the 9th August 2015 was well attended for a Summer venue, our visitor numbers down only by 30 on our previous fair. 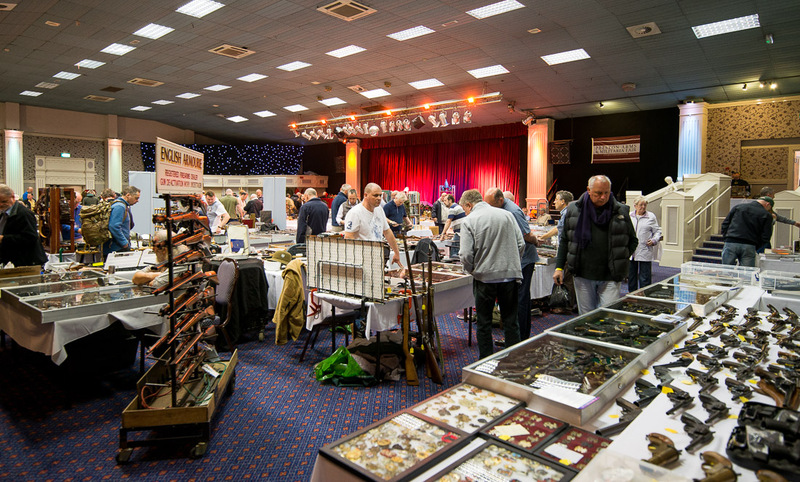 Since we moved to our new venue at Charnock Richard ( Park Hall Hotel ) we have been able to increase the numbers of dealers to circa 45 and climbing !! 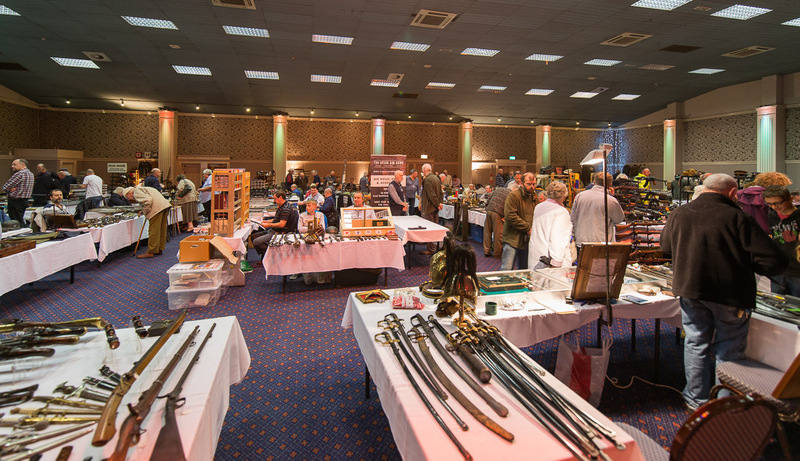 We are pleased that we are building up dealers who offer quality Antique Weapons and also Specialist Medals from many eras of history…..
With regards to the advertising for our Fair, we have always placed our adverts in leading magazines and for 2016 we have added the ” Military History Monthly” magazine to these, another top quality monthly magazine which specializes in detailed histories of famous battles and personalities from all ages. 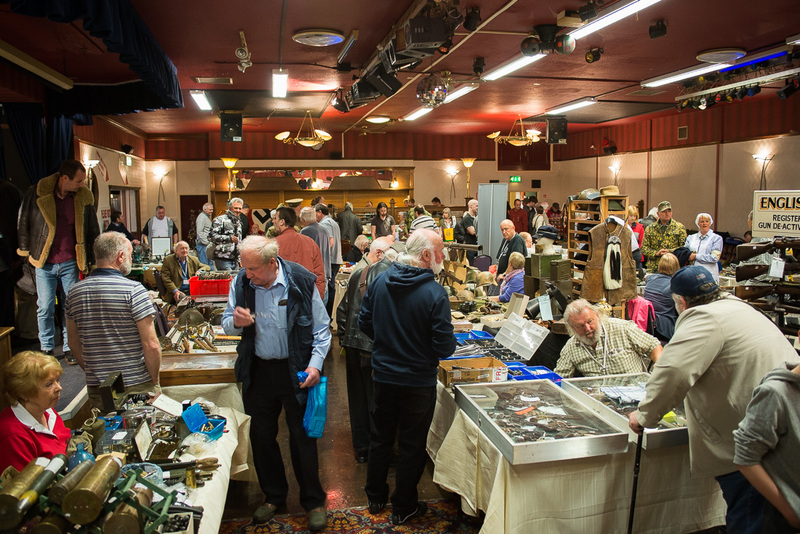 Our next Fair is on Sunday the 8th November ( Almost Christmas again !) 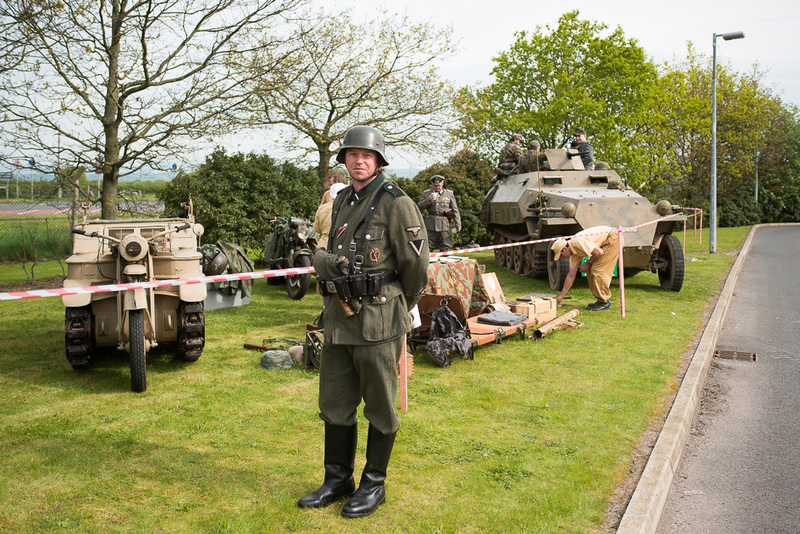 when we will have a very good representation of German and Allied Soldiers and Vehicles from WW2 1944 by the excellent ” North West Collectors Re-Enactment Group” for our visitors to see….. 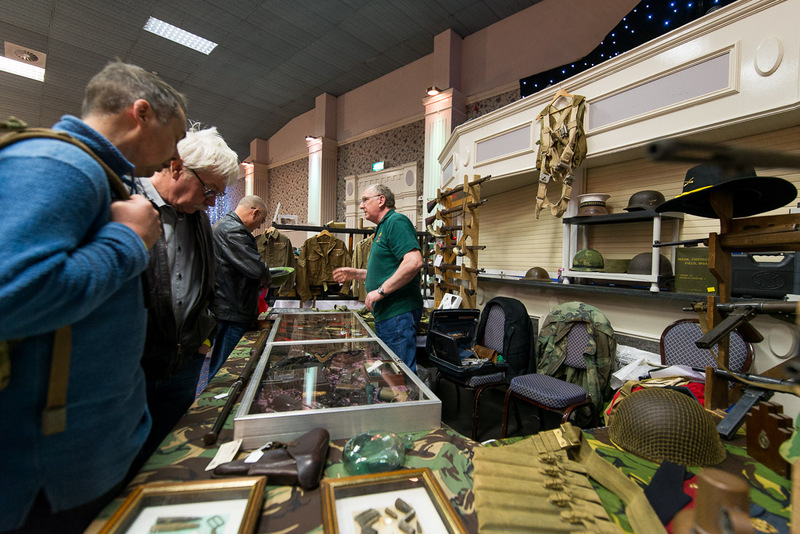 The Group is now attending large Military Shows such as the Yorkshire Military Show, Southport Air Show and the excellent Heywood Tank Weekend where the group demonstrated many WW2 Weapons for the visitors including am impressive Blank Firing session. 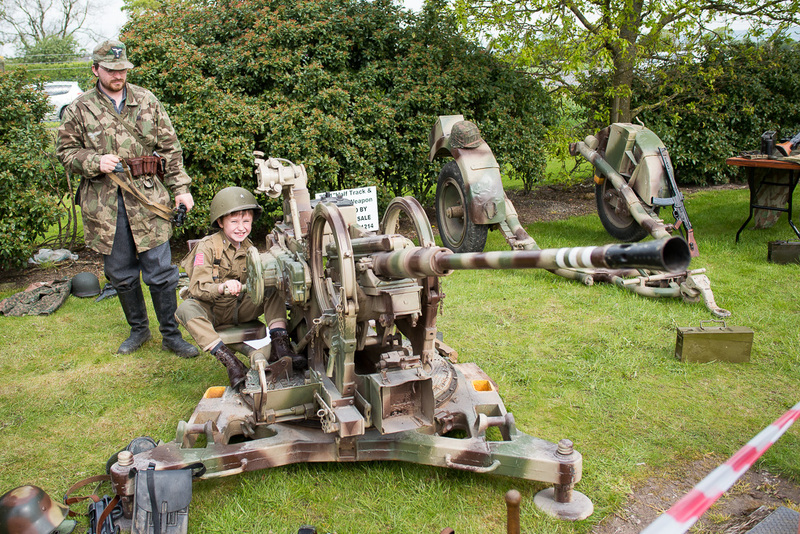 The group will play a leading role in the new Military Re-Enactment show now in the planning stages for mid Summer 2017 in Leicestershire, full details will be coming early next year with a Press Release…watch this space..the Battlefield Arena is superb ! 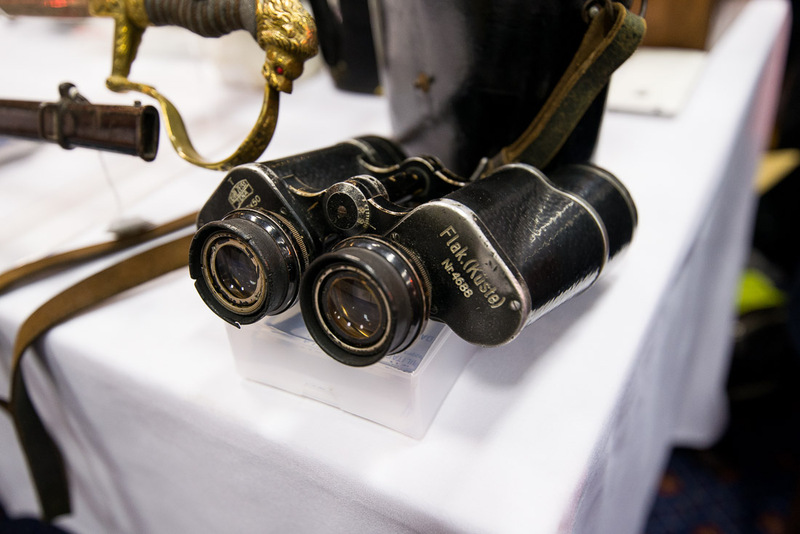 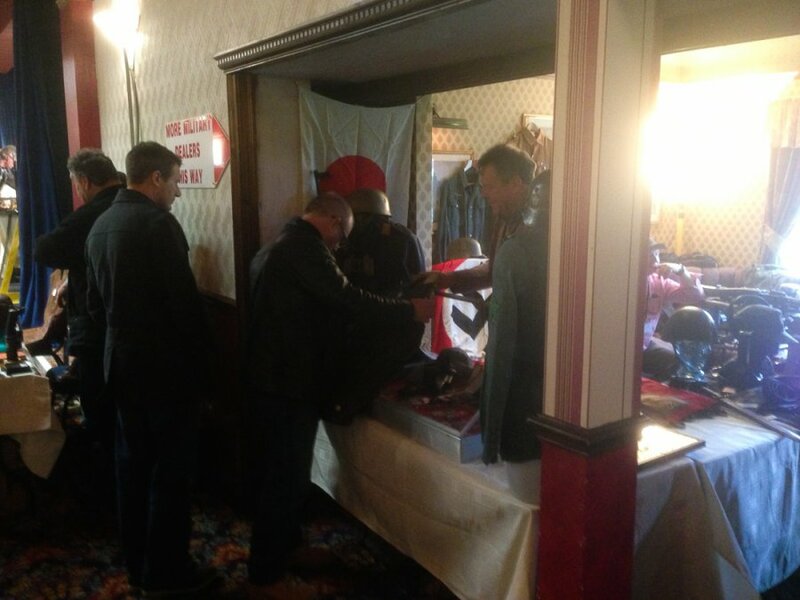 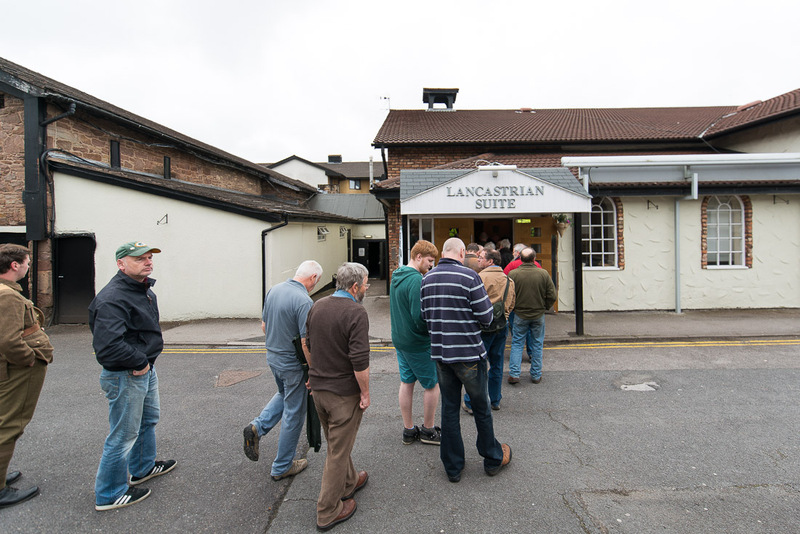 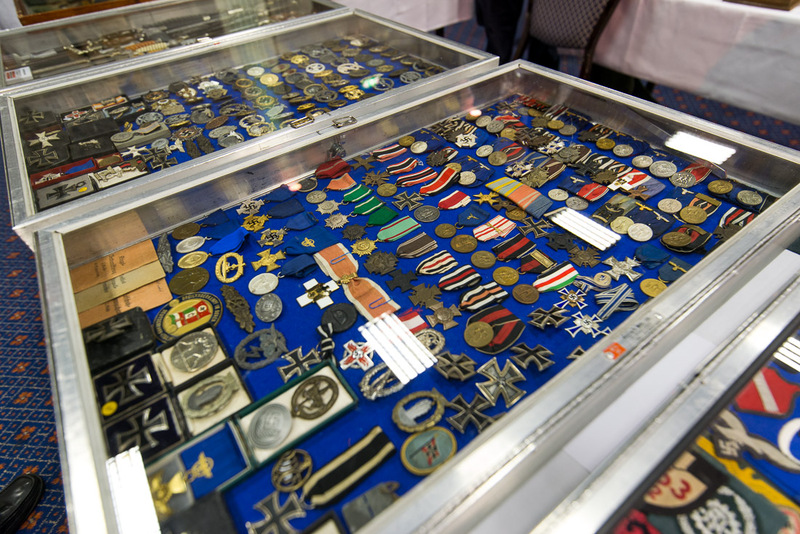 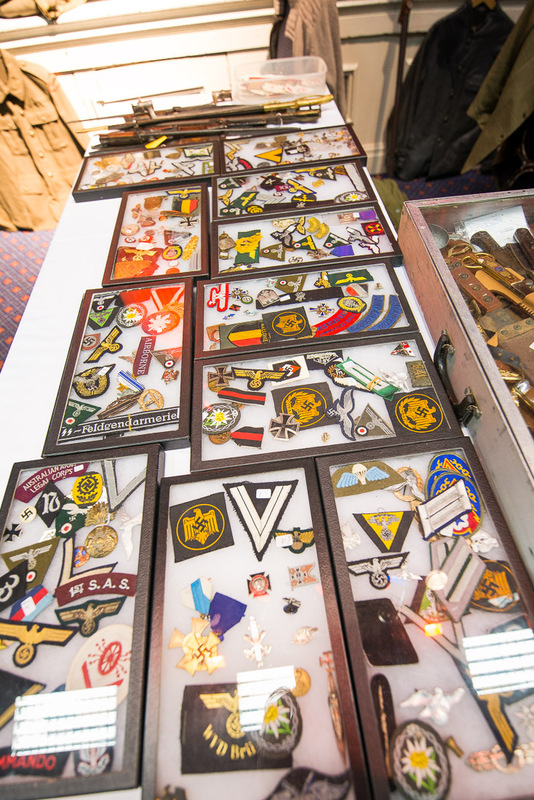 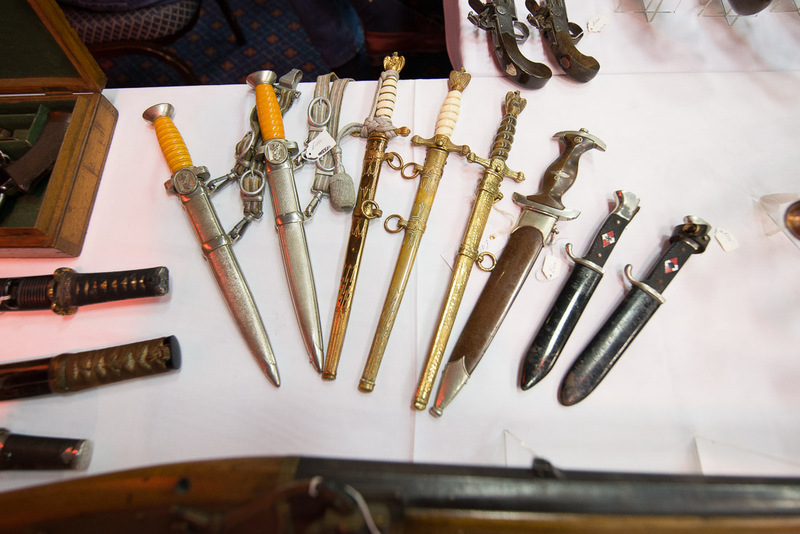 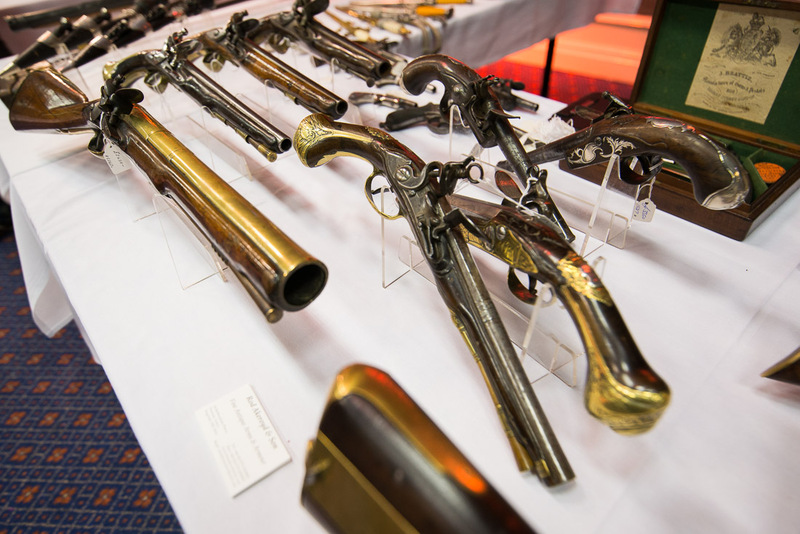 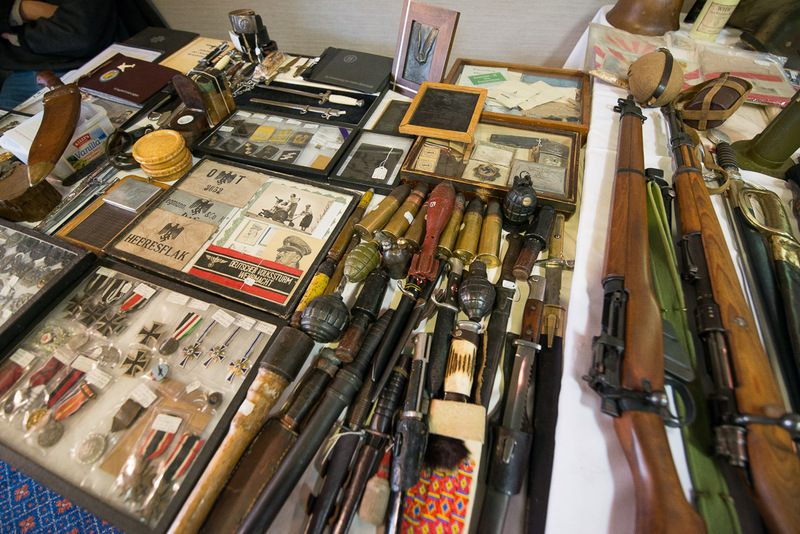 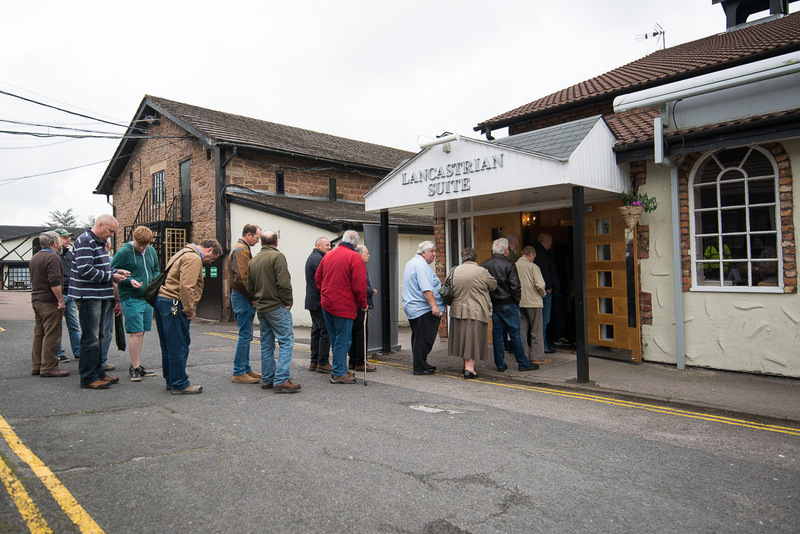 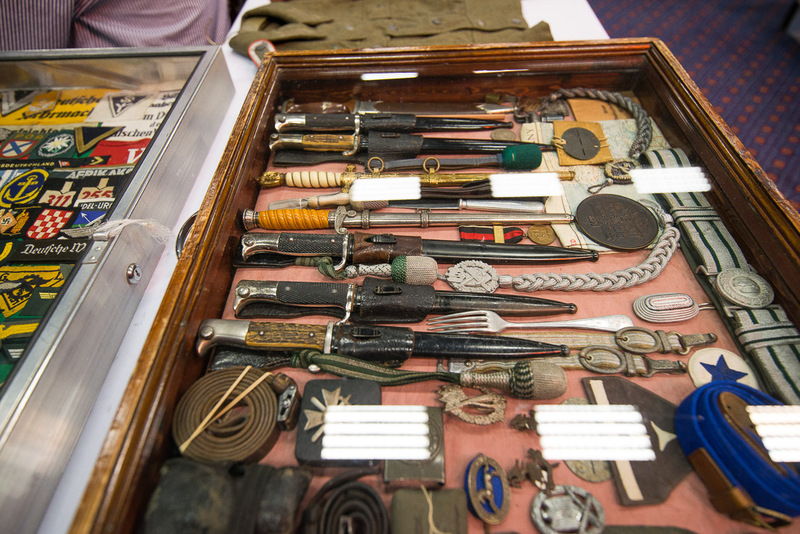 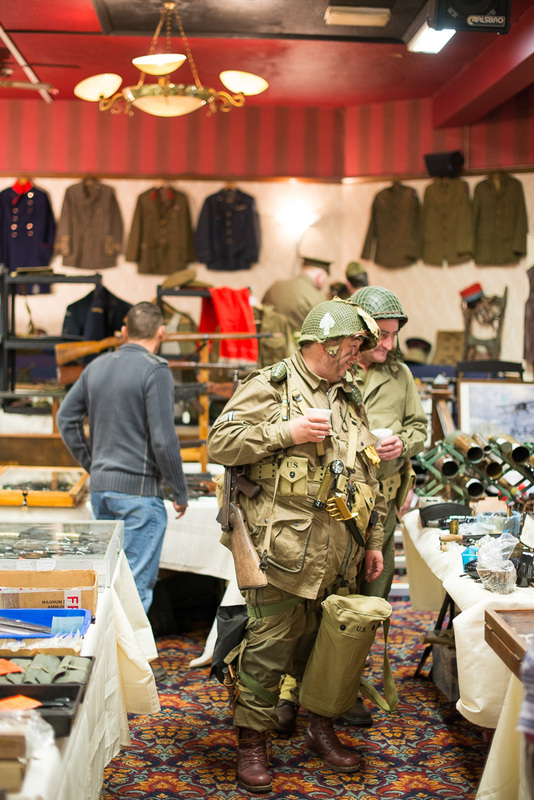 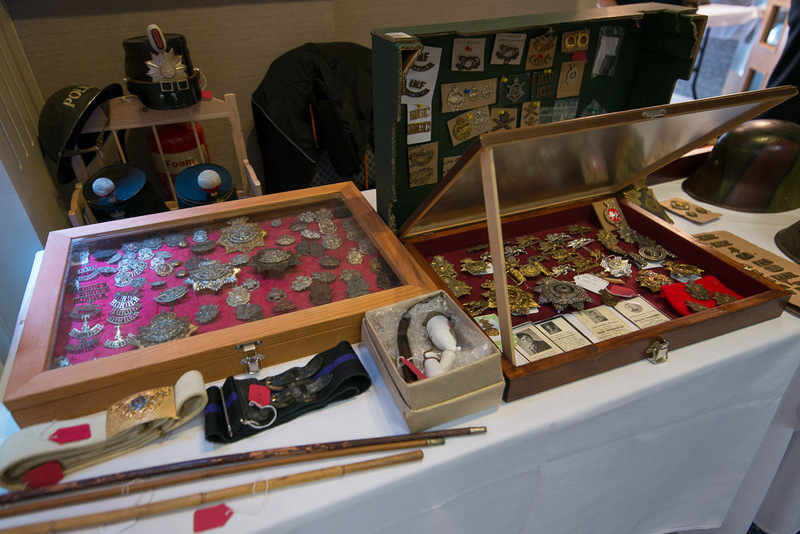 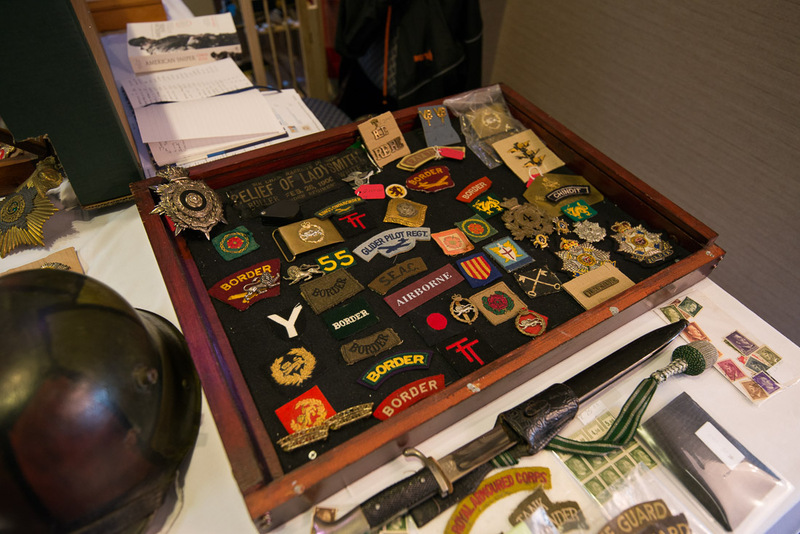 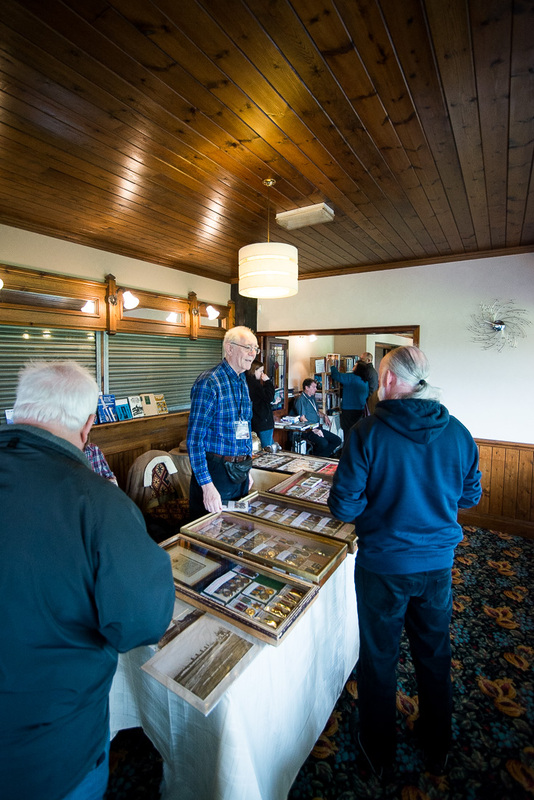 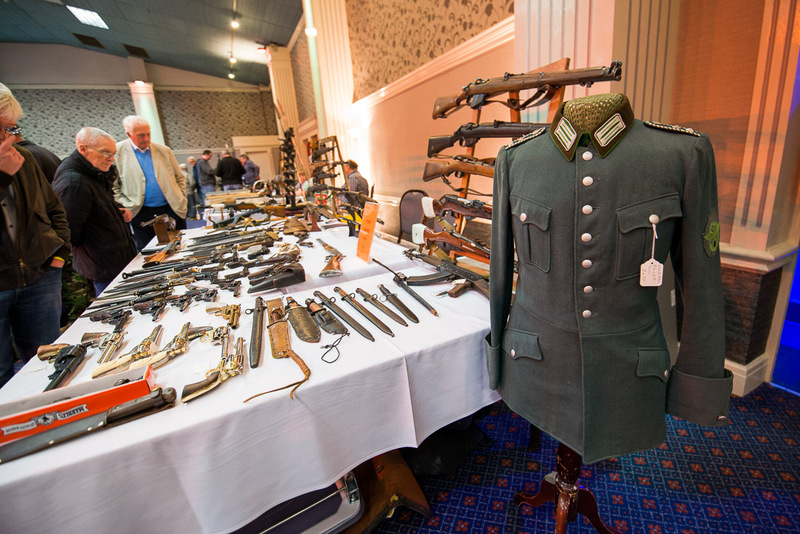 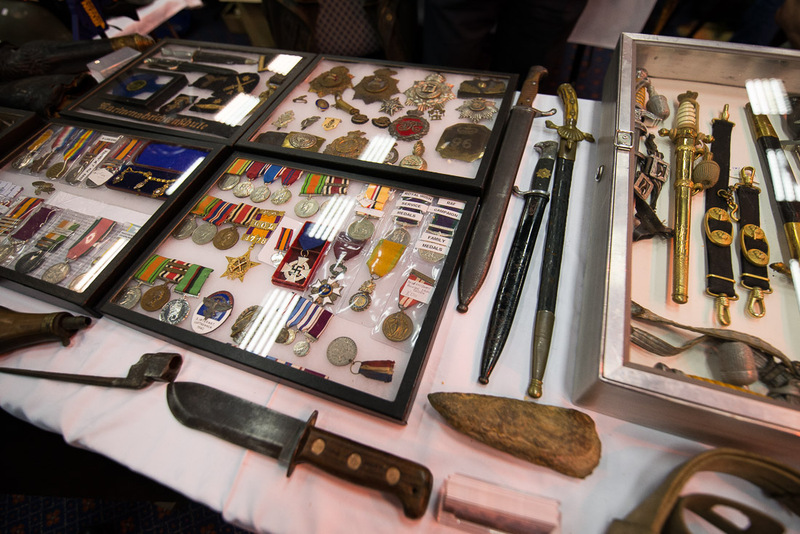 The second Arms and Militaria Fair held on the 25th May 2015 at our new venue at the Park Hall Hotel was very well attended and the weather stayed fine for us ! 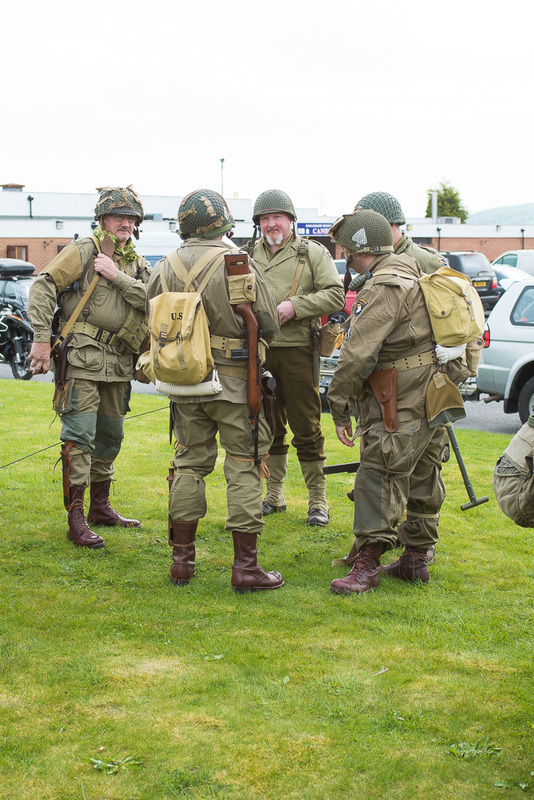 The venue is very easy to get to and the excellent car park facilities for 1000 cars is very well appreciated by all ! 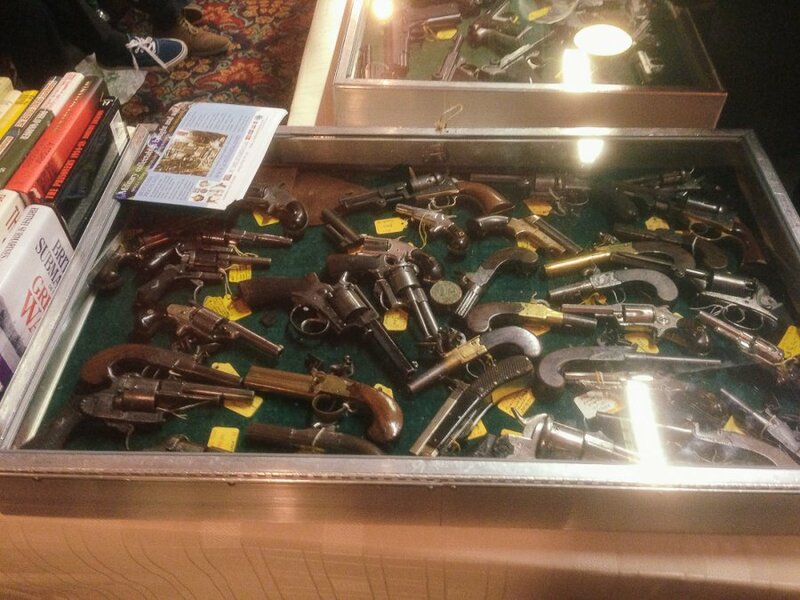 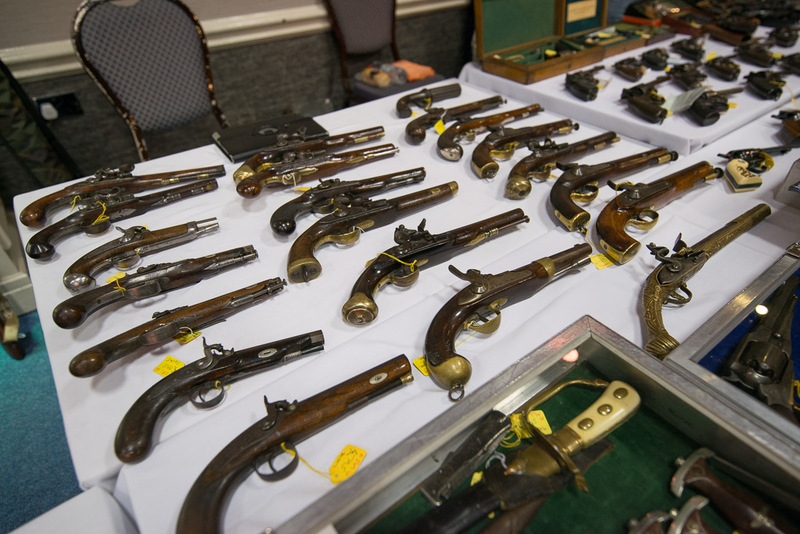 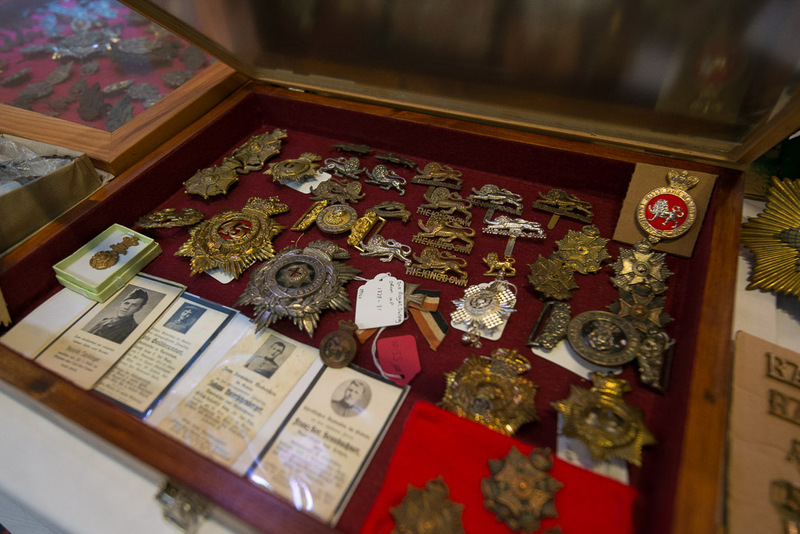 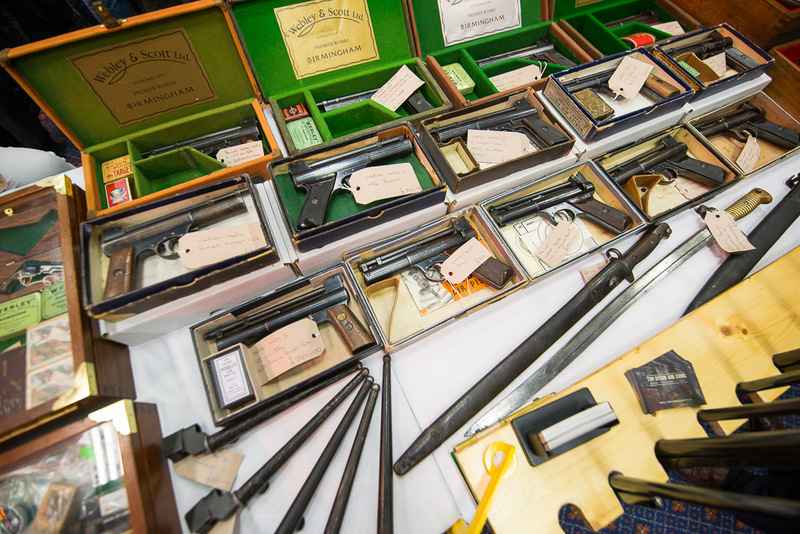 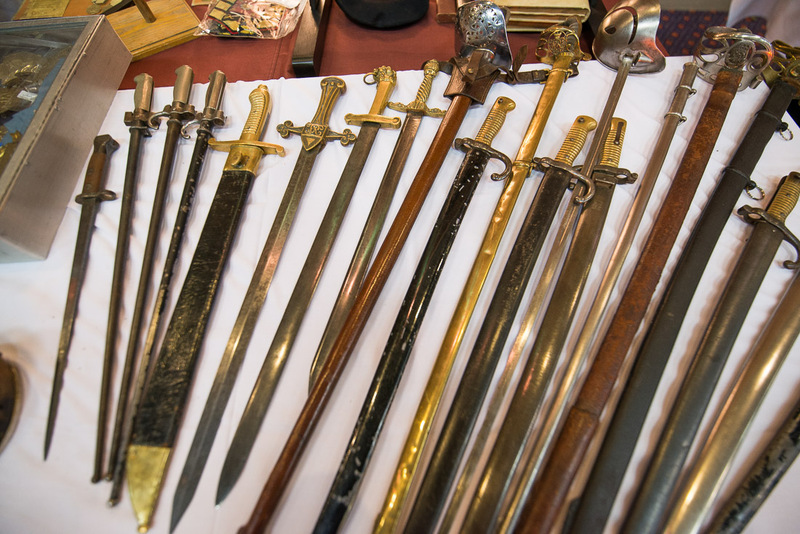 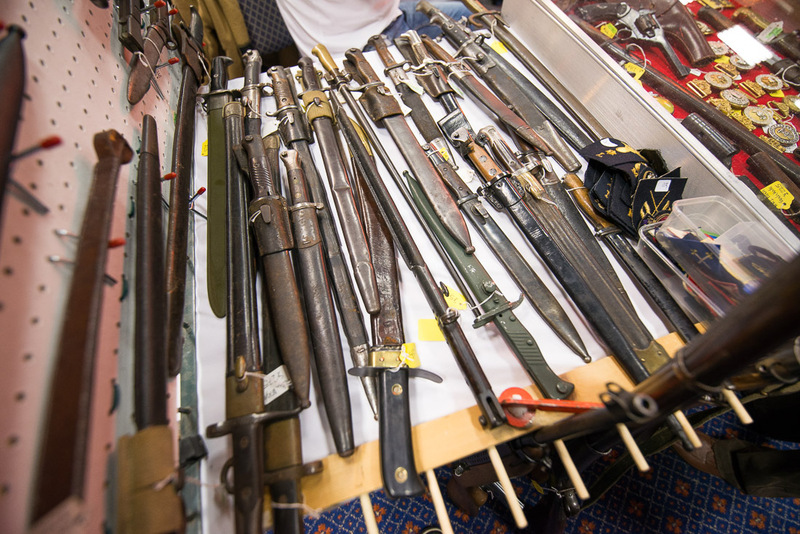 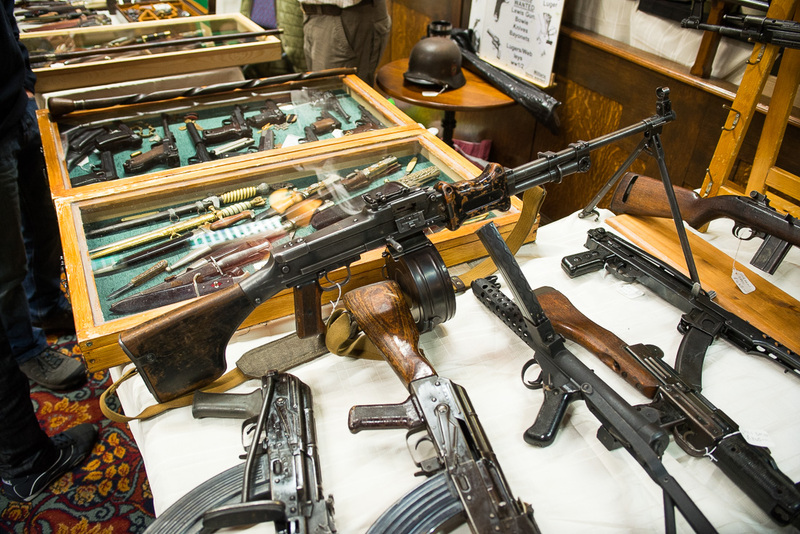 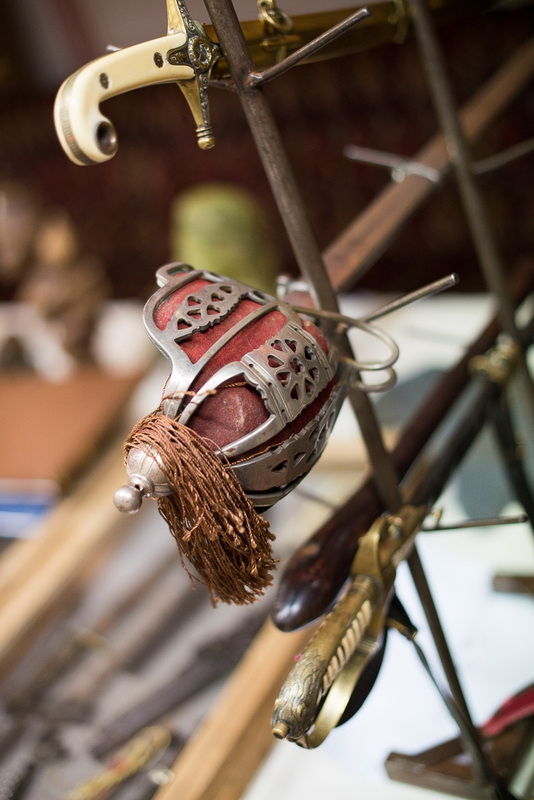 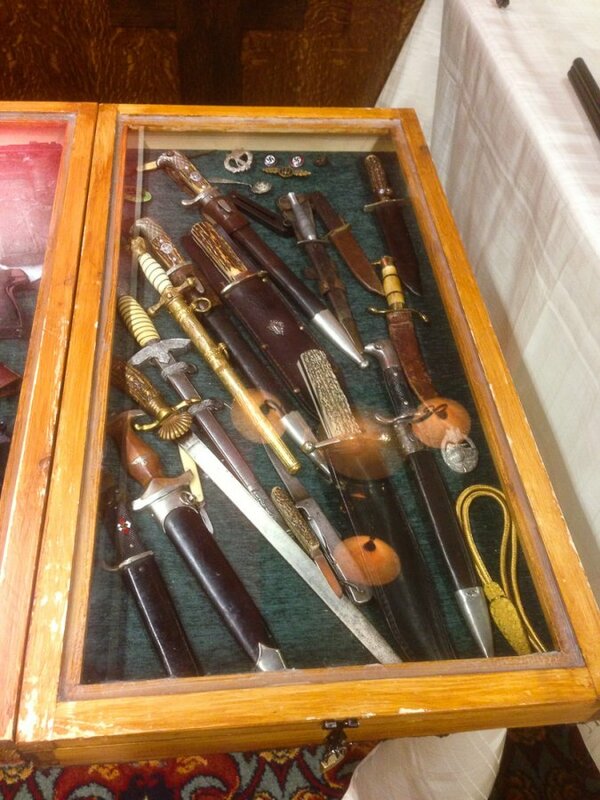 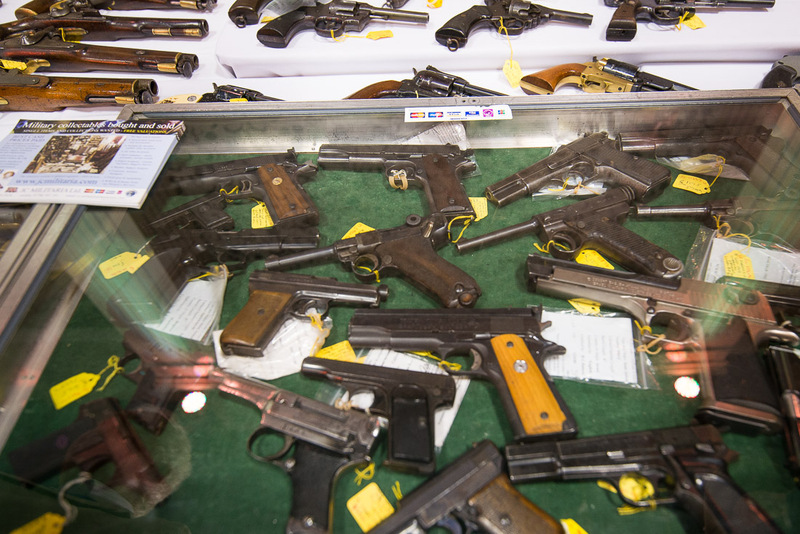 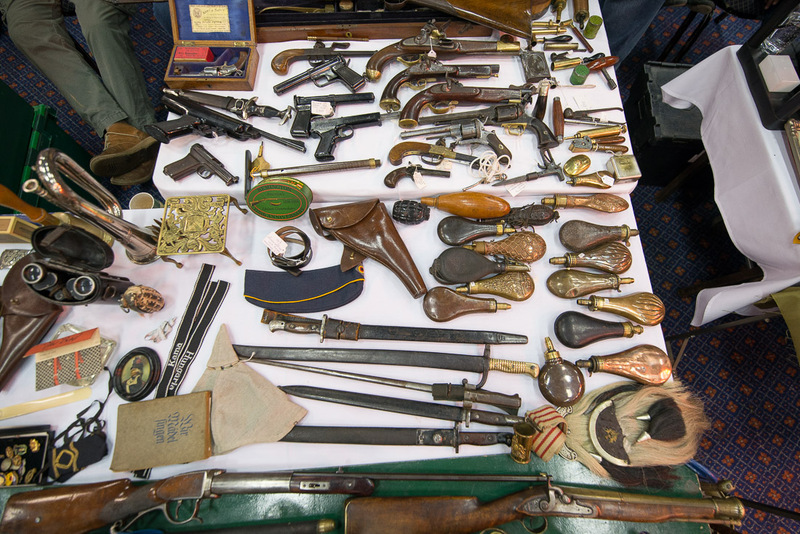 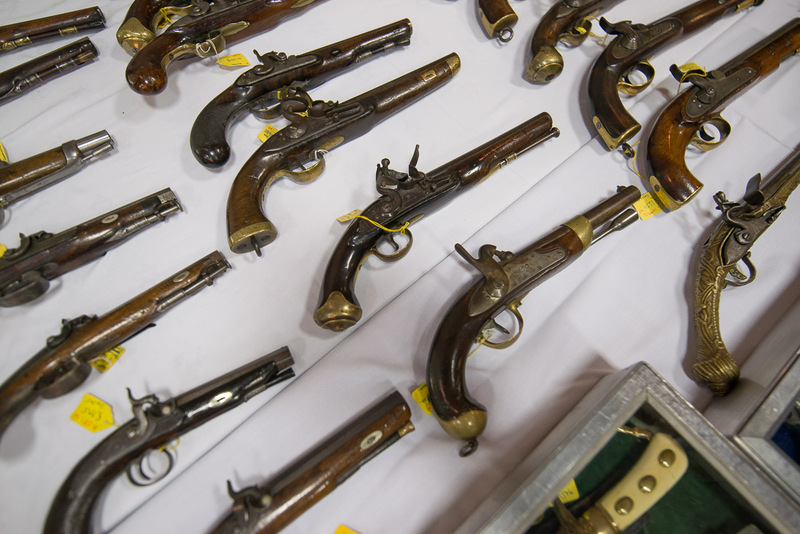 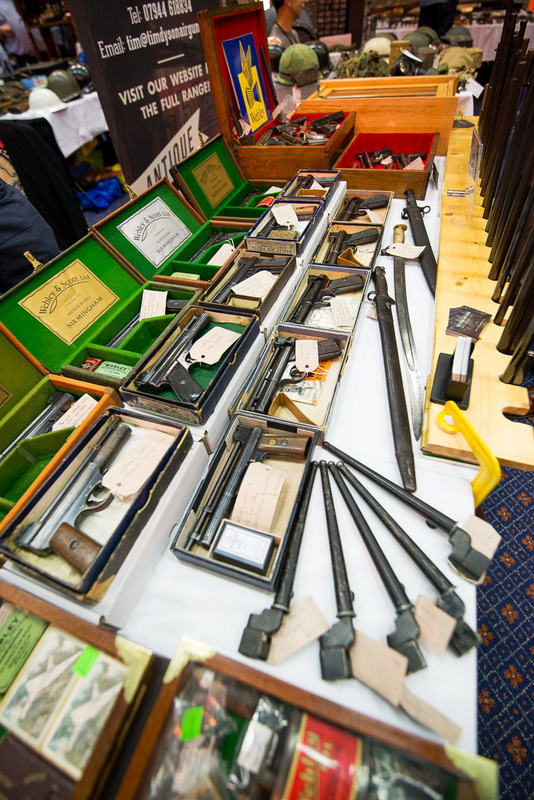 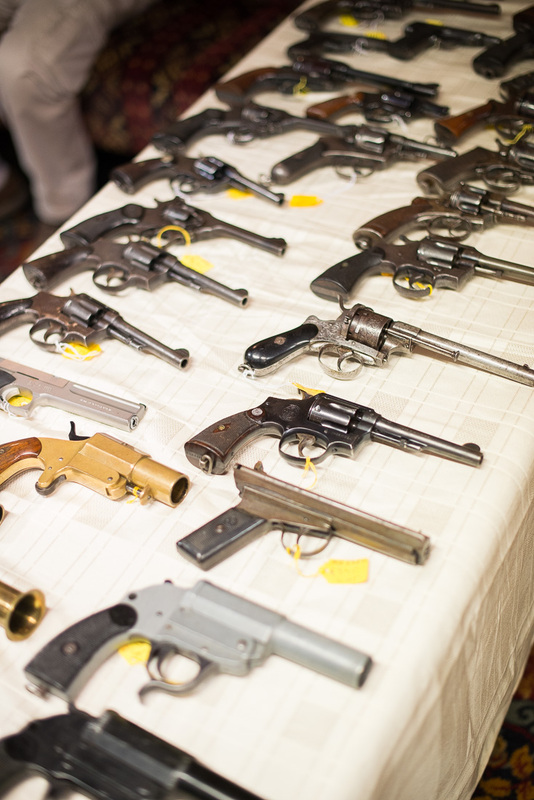 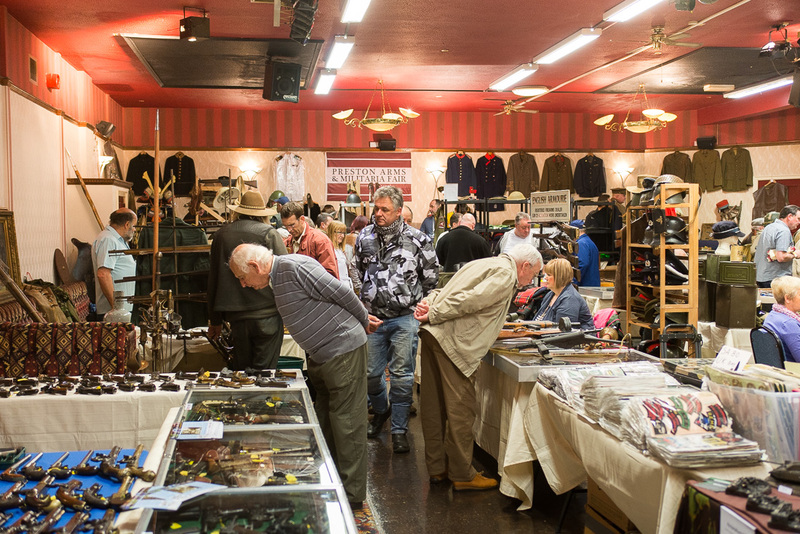 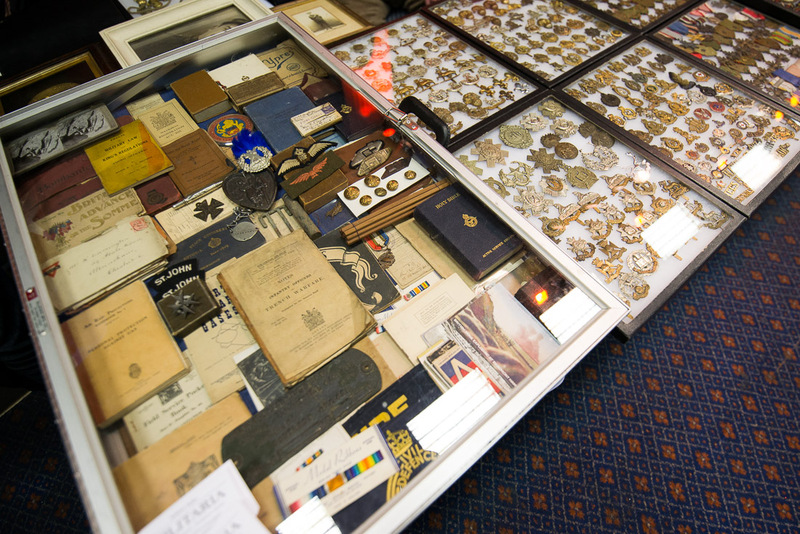 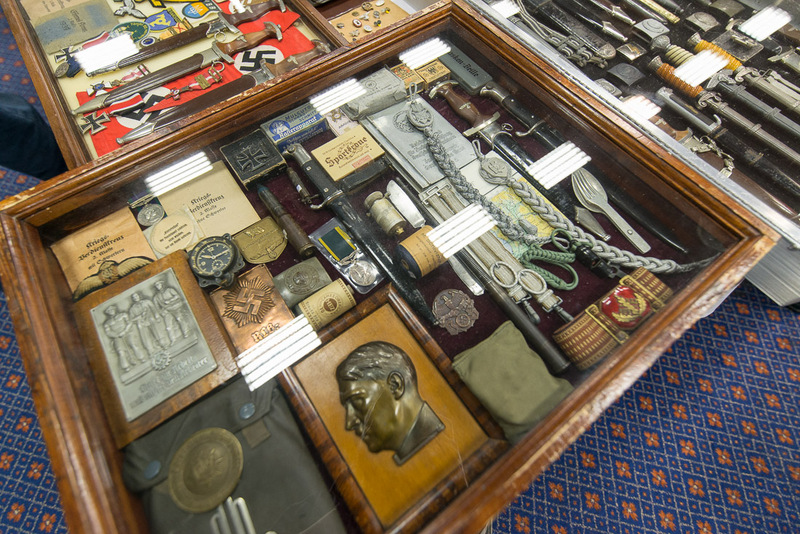 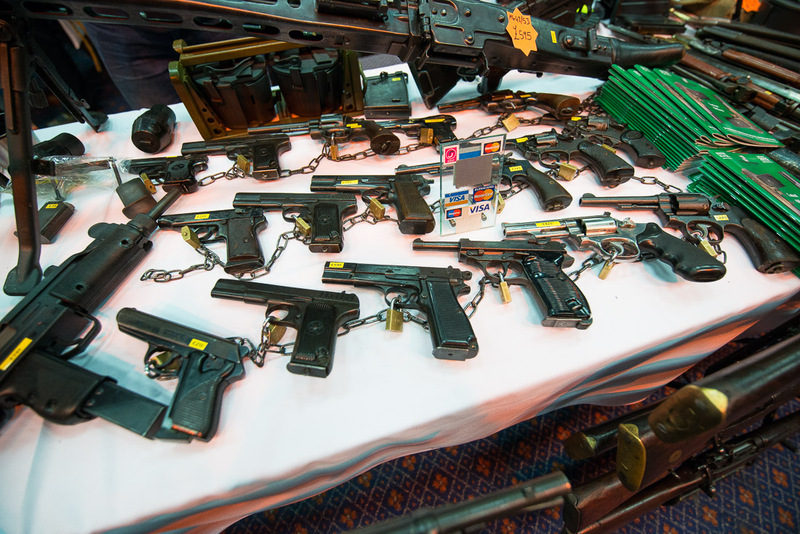 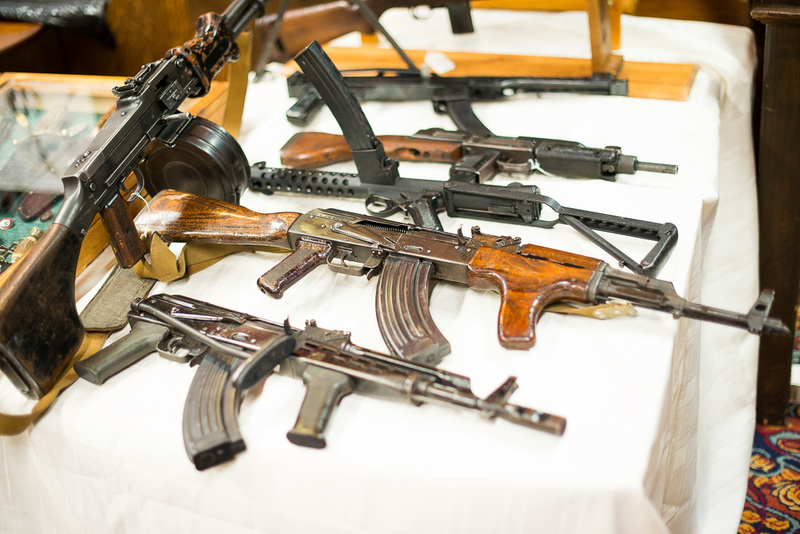 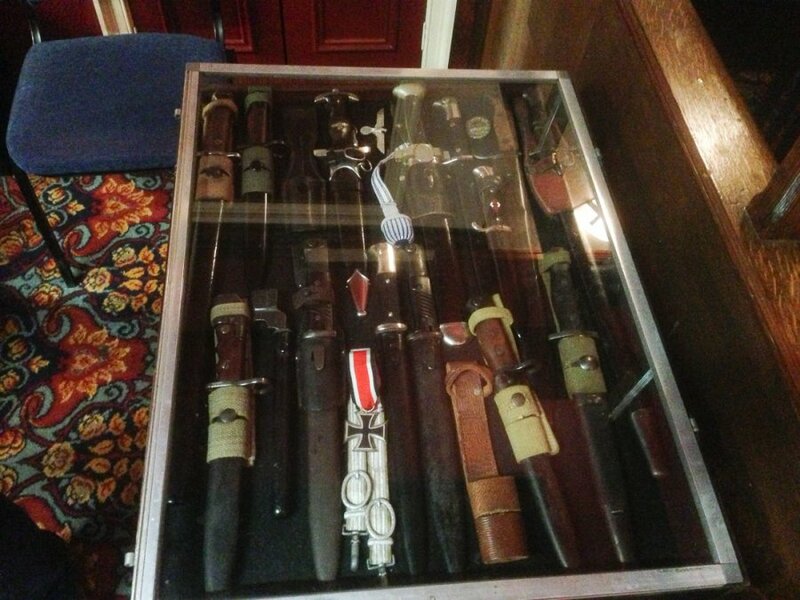 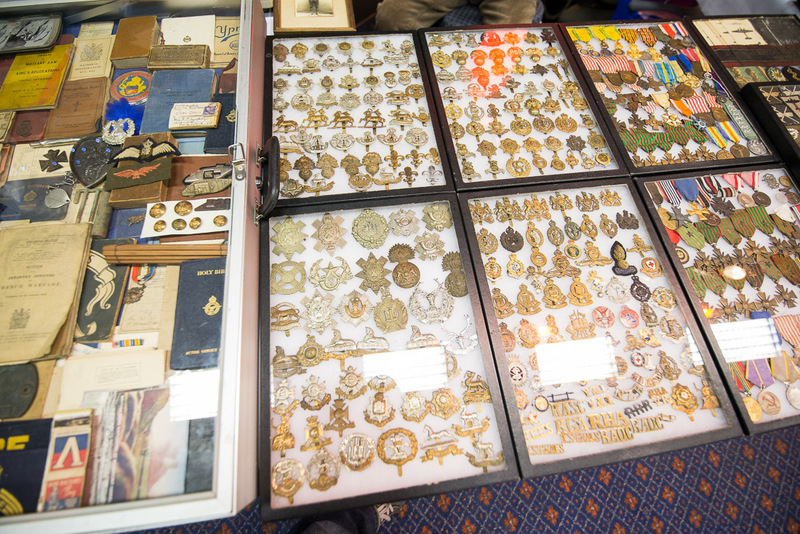 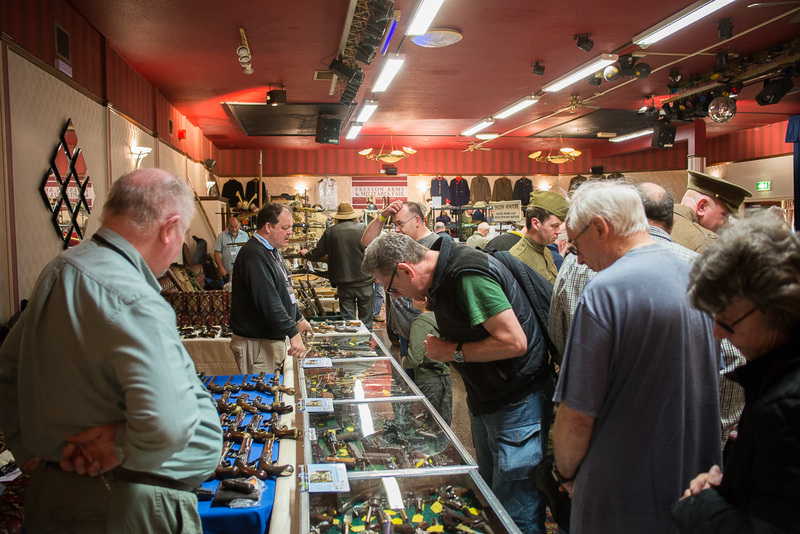 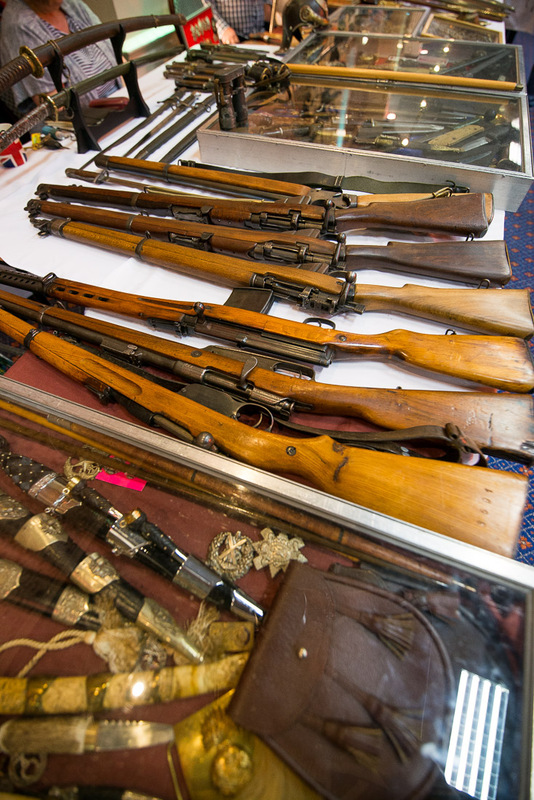 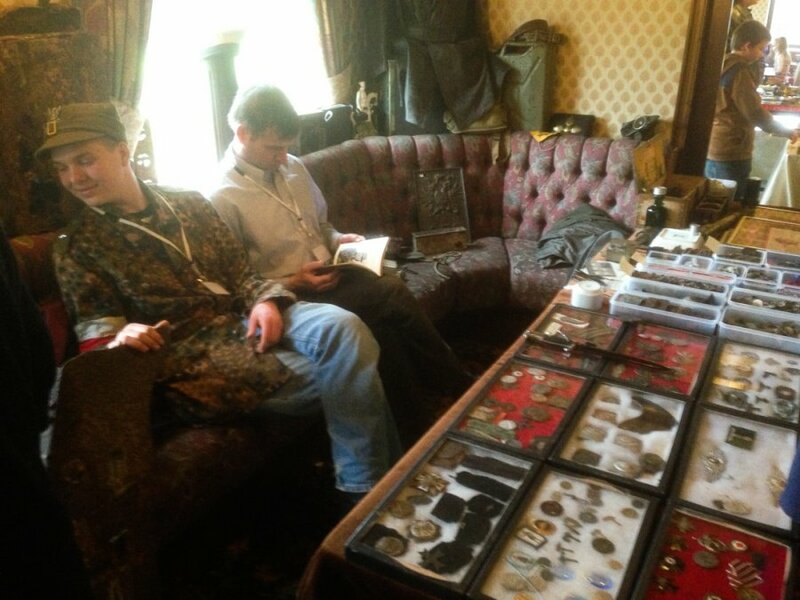 We had several new dealers specializing in Air weapons, Edged Weapons and medals in addition to our very regular stalwart dealers, whose professionalism has made the fair one of the best Arms and Militaria Fairs in the UK. 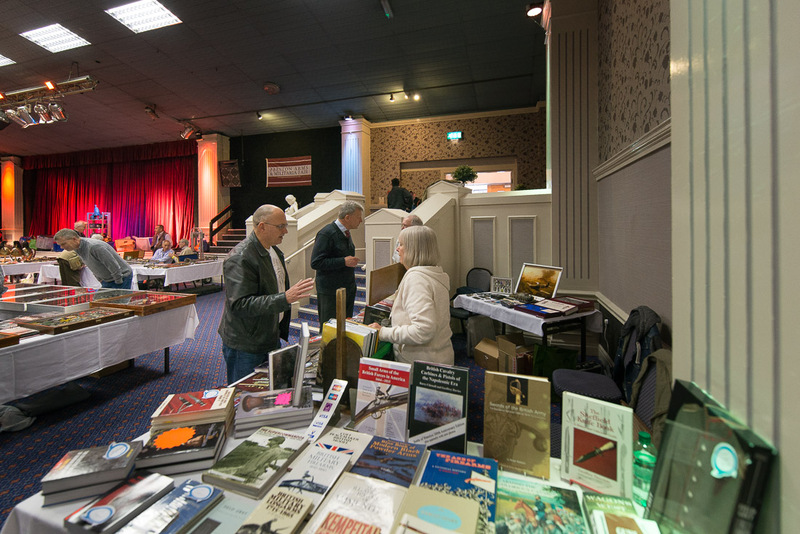 We thank the super efforts of the staff of the Hotel who erected over 100 tables to make the fair, and also the catering staff who supplied the refreshments….. 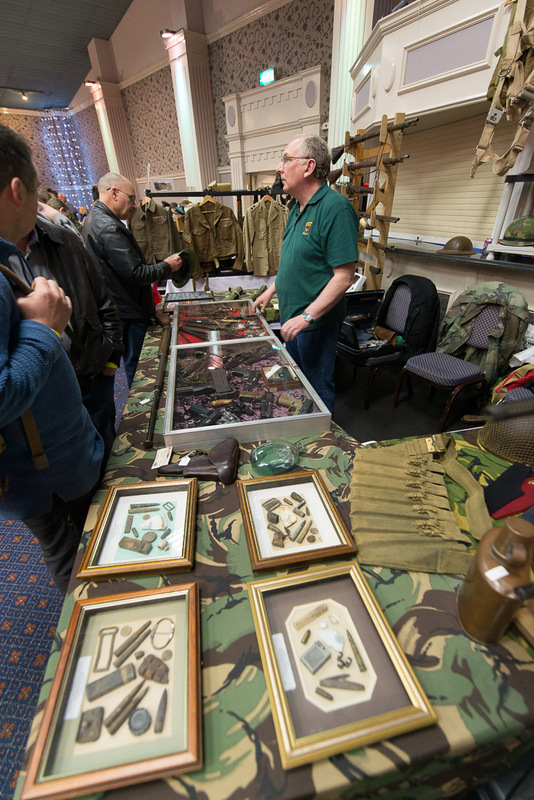 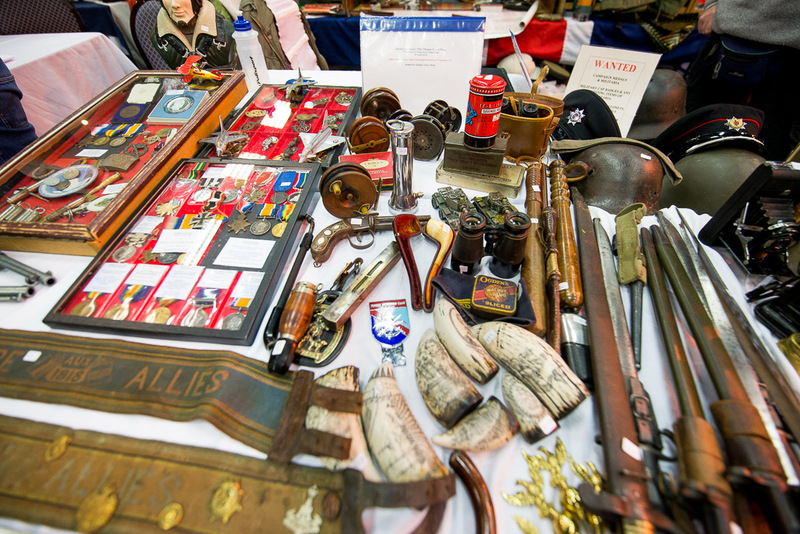 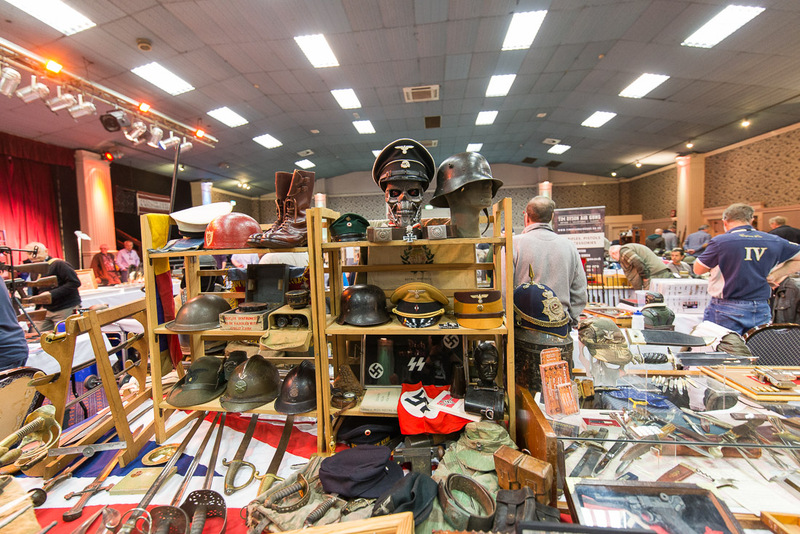 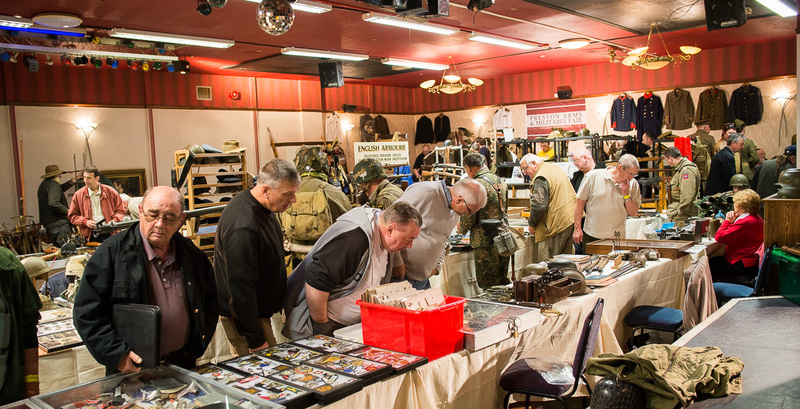 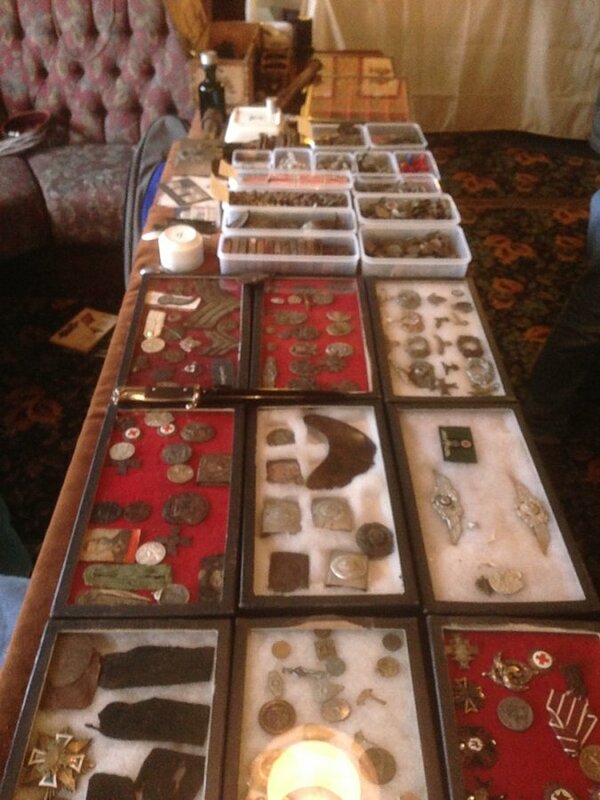 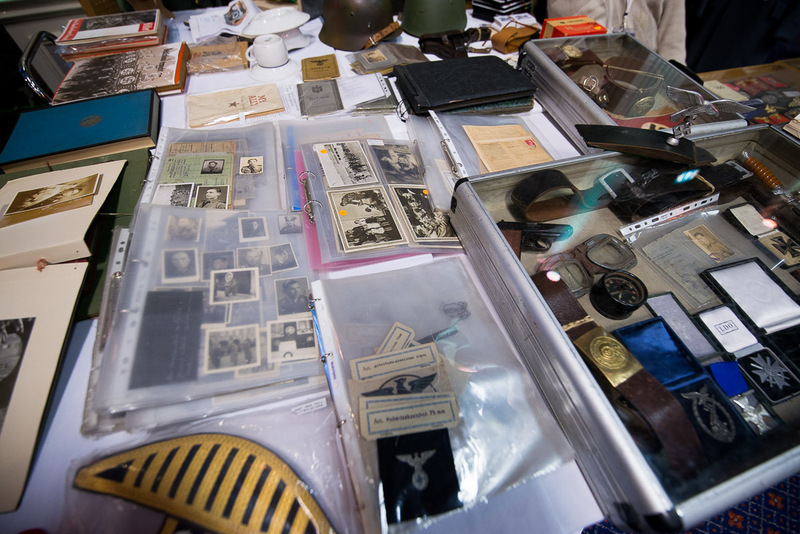 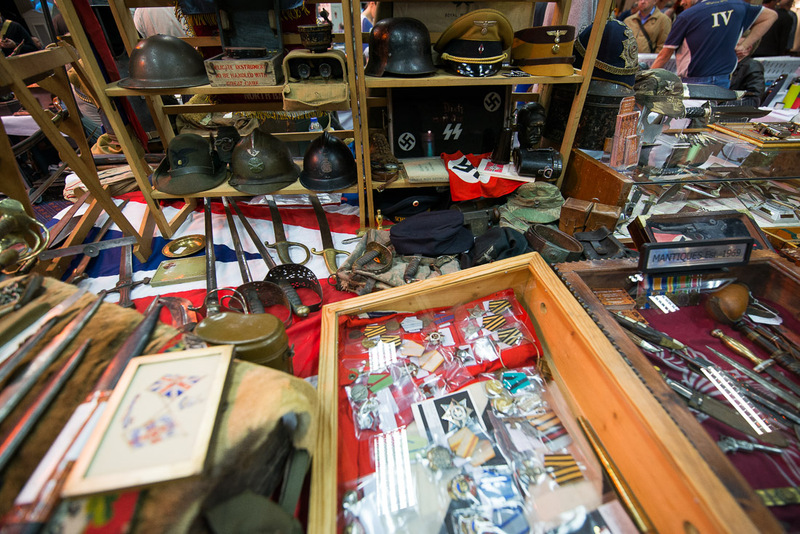 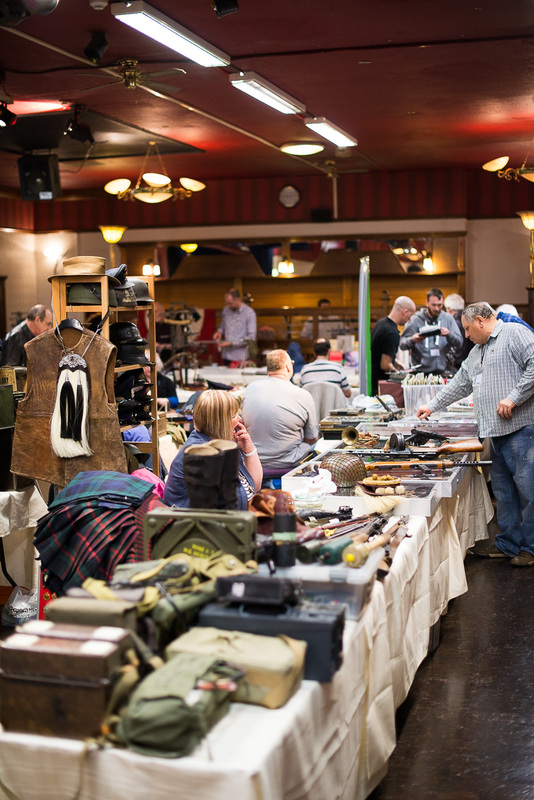 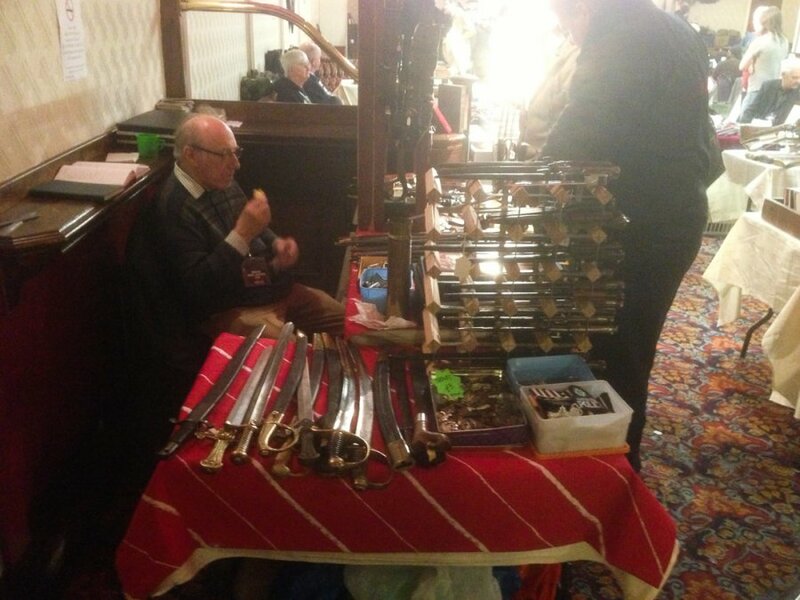 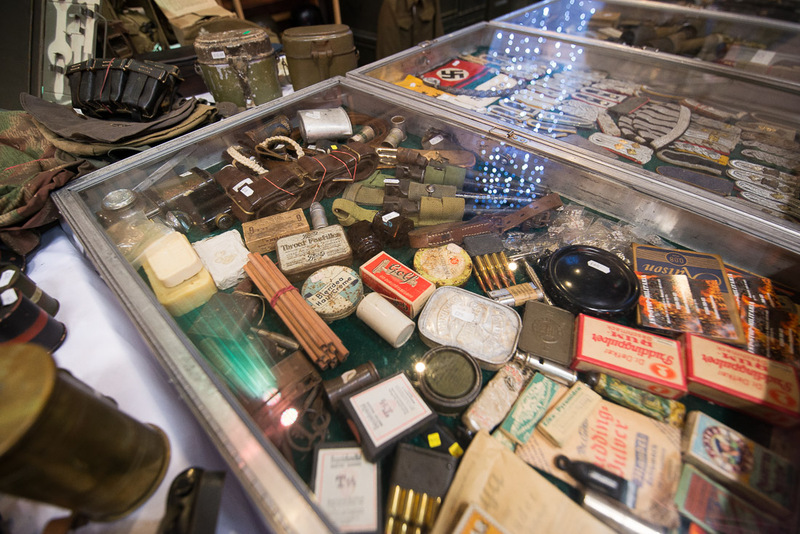 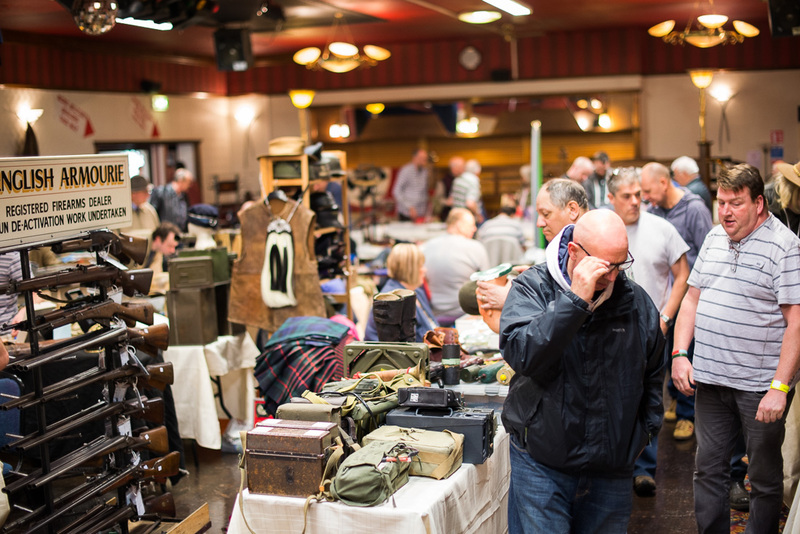 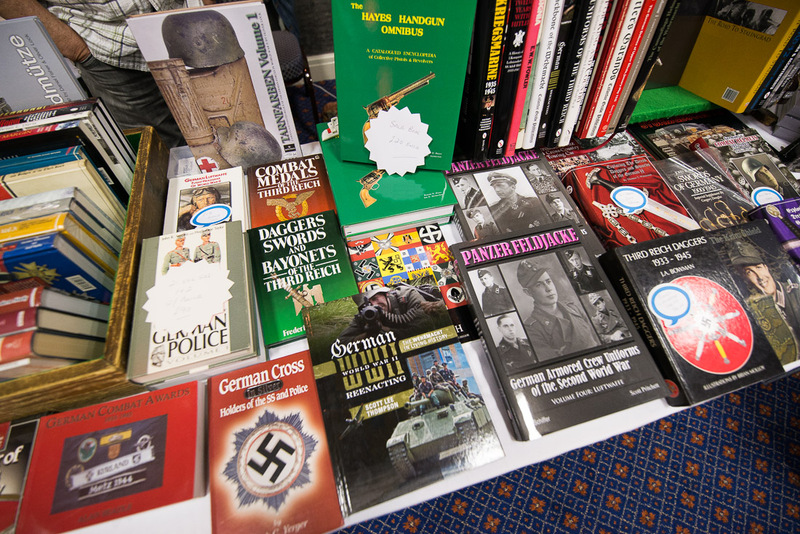 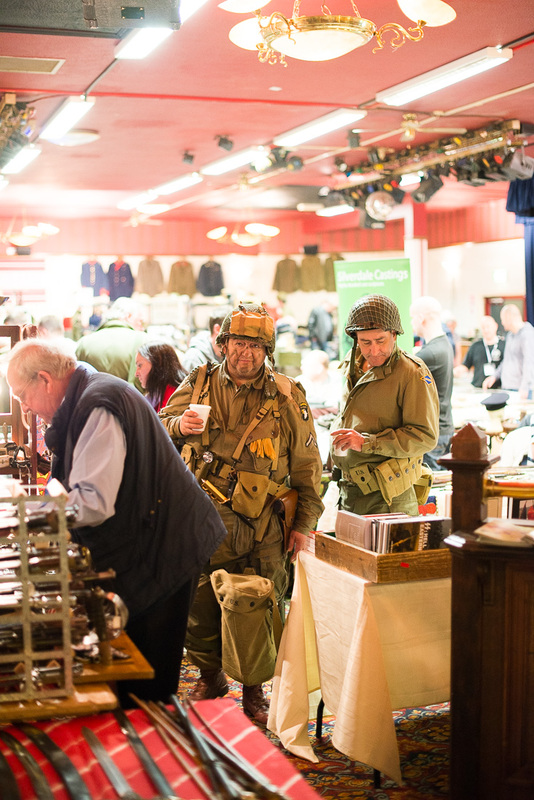 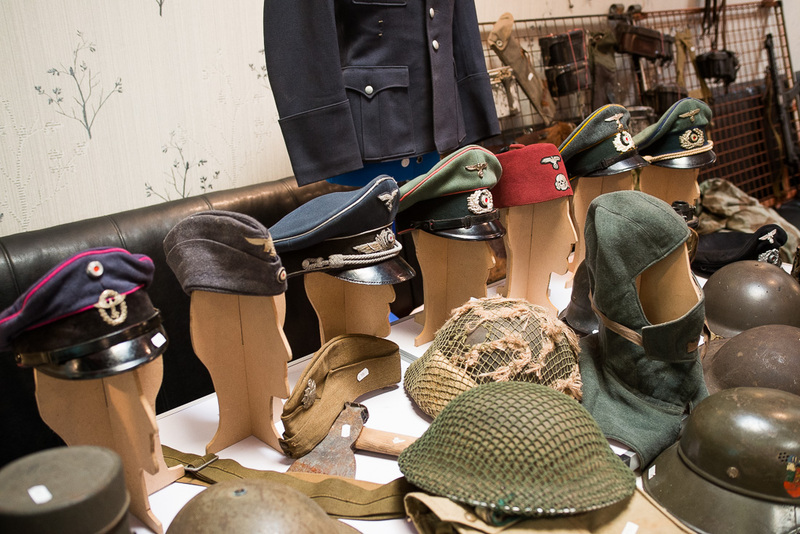 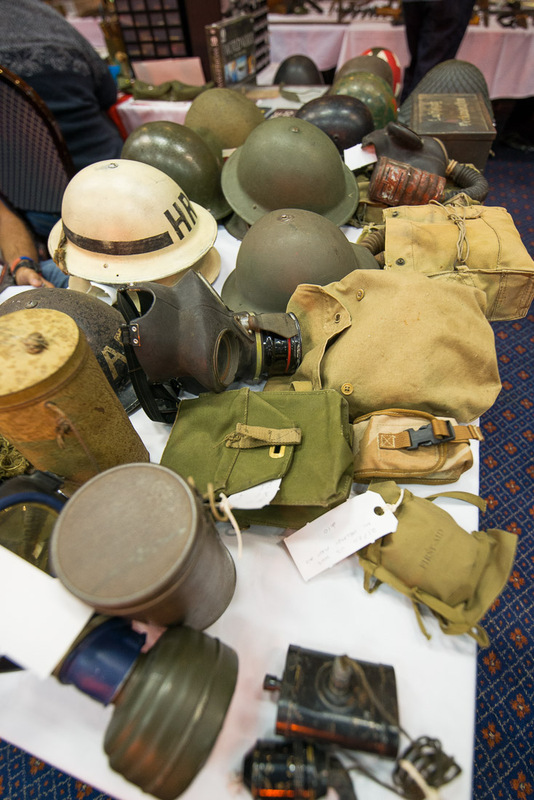 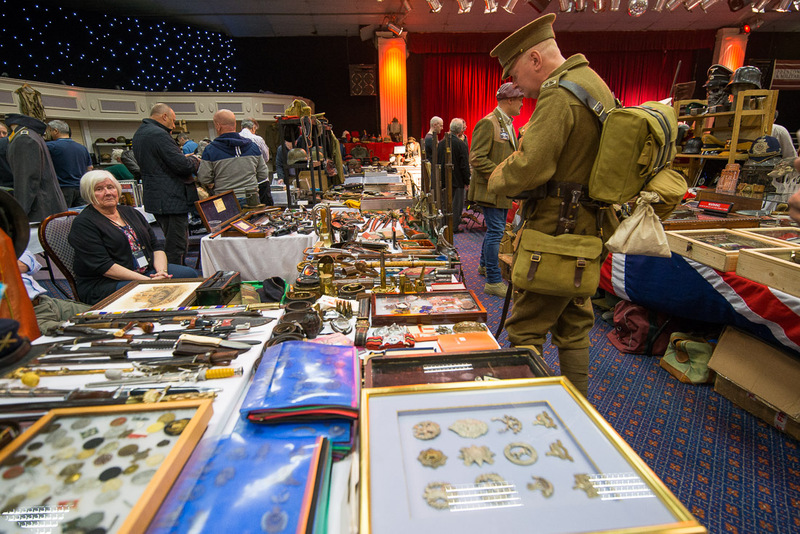 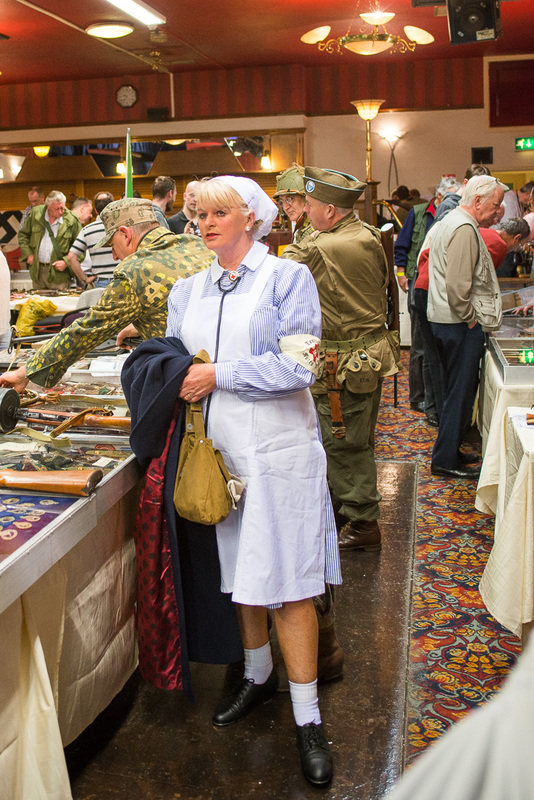 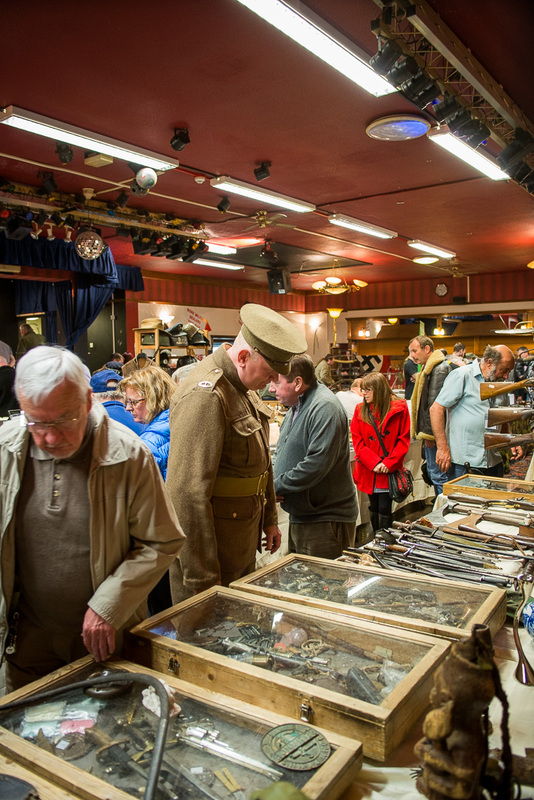 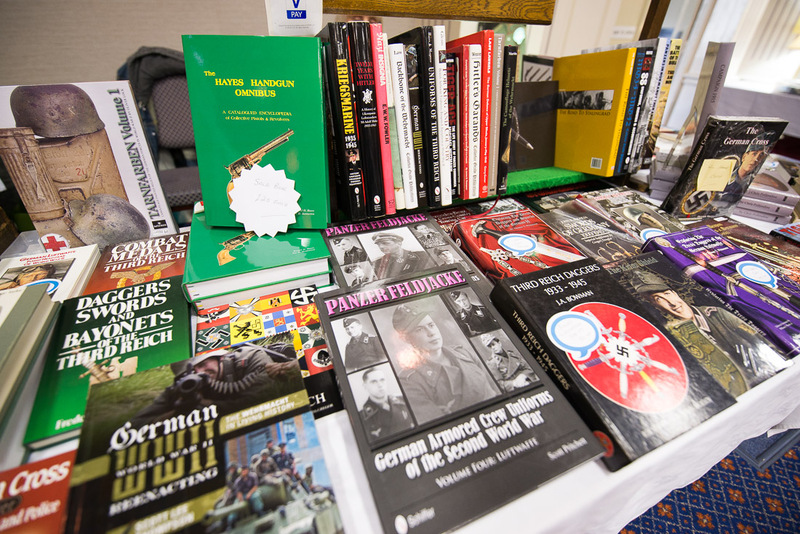 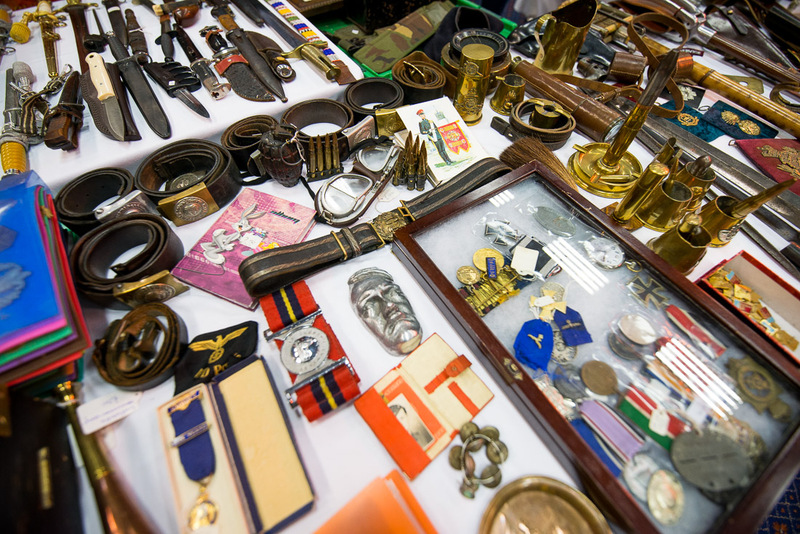 The Dealers Prize Draw for £50 was won by Dave Redfern from Dad’s Militaria…Well done Dave ! 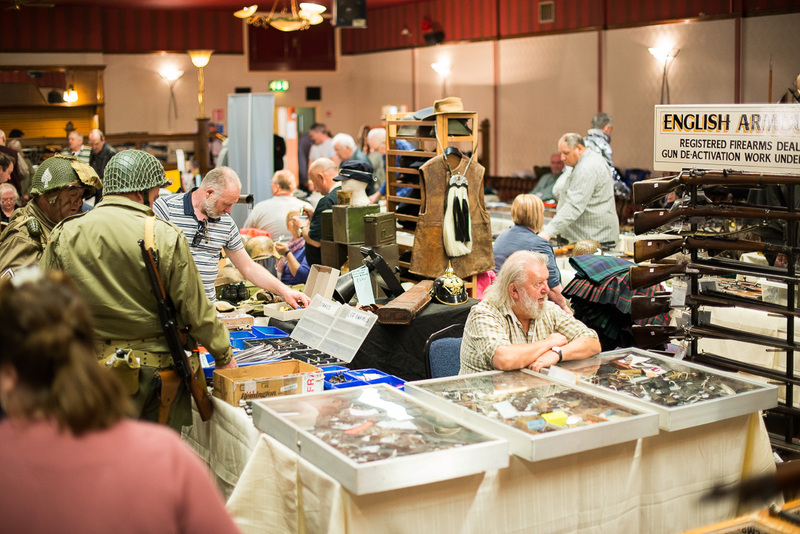 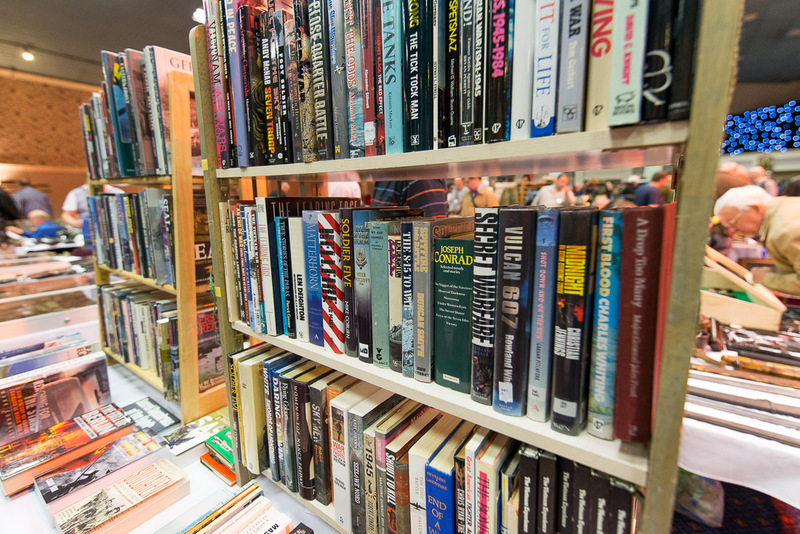 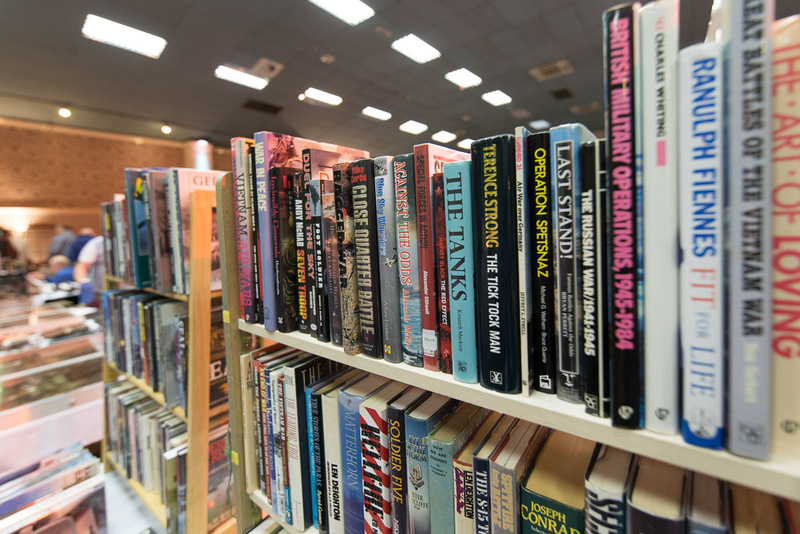 Our next fair is to be held on Sunday the 9th August 2015 and we hope to see you there and we hope you continue to enhance your collection with that special item !! 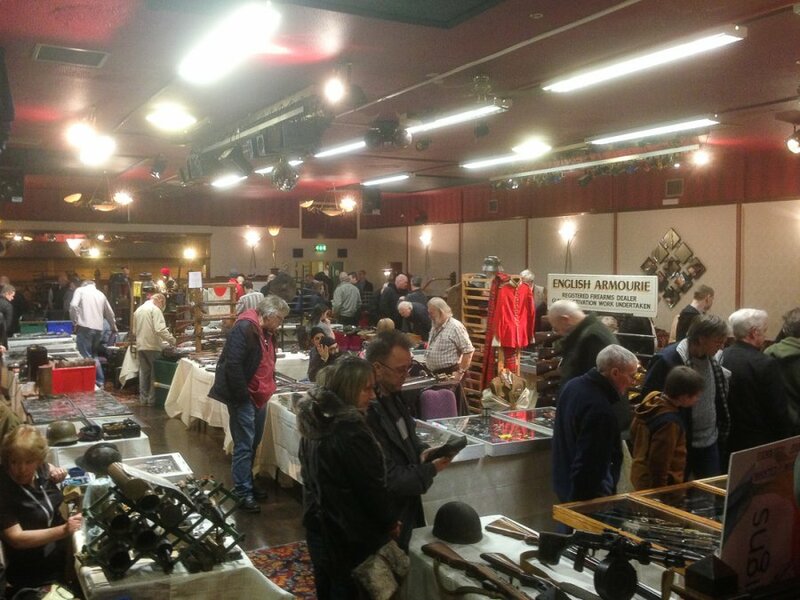 The new venue for our 22nd fair at the Park Hall Hotel, Charnock Richard, M6 was by far the best yet. 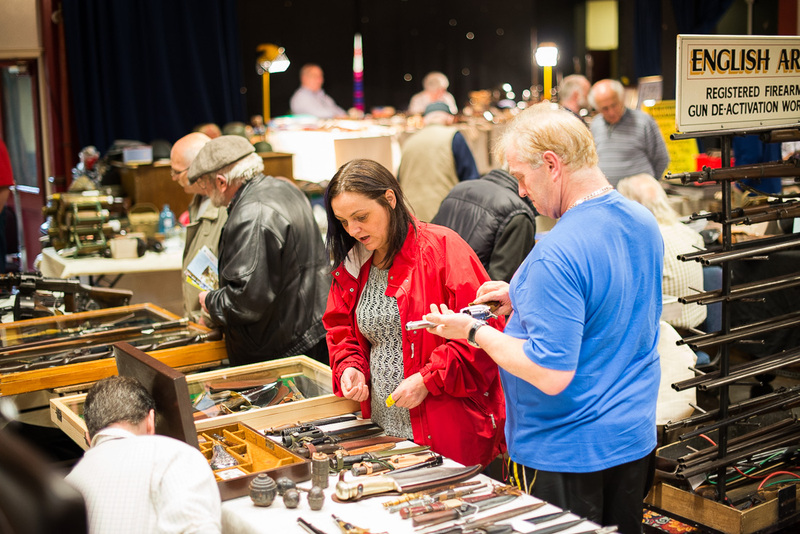 As with all new venues we have some improvements to make for our next fair on the 25th May ( Bank Holiday Monday ) and in fact we make every effort to make both the dealers and collectors experience better than the previous fair. 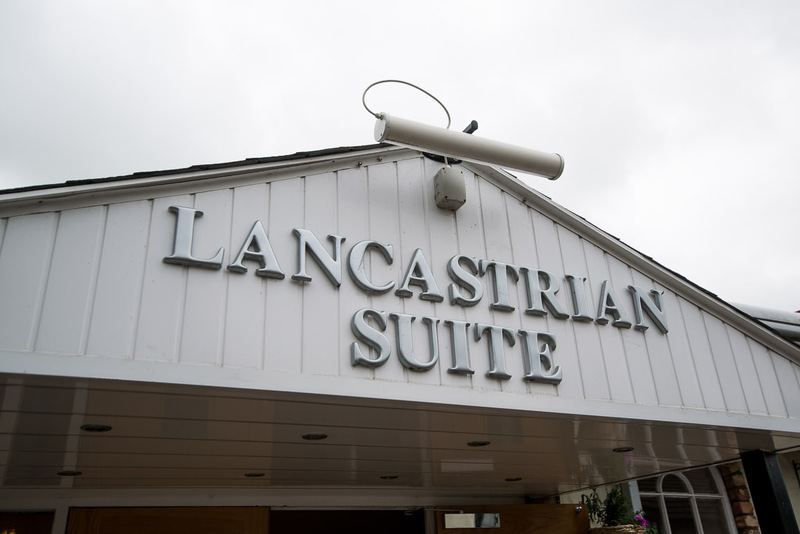 The Lancastrian Suite is very spacious and has a great atmosphere and everyone who attended reported that they had very much enjoyed the day and the majority of tables were rebooked for May. 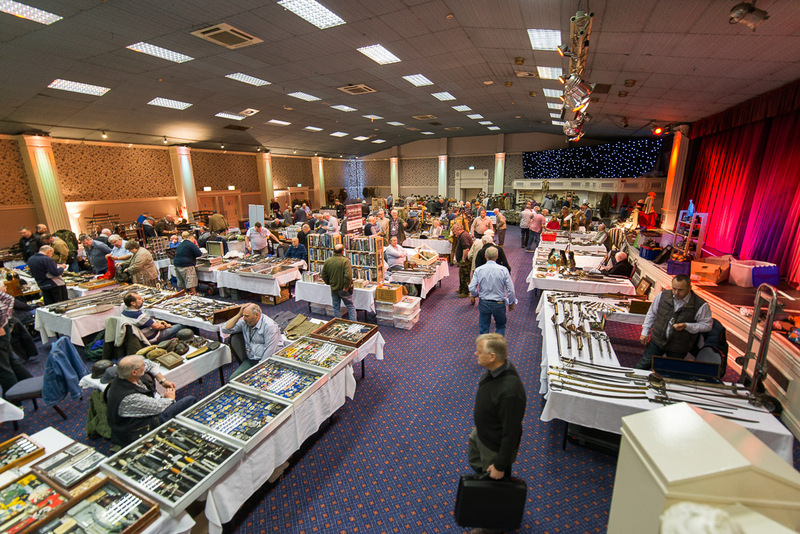 At the next fair we will have several new dealers who have been on our waiting list and this new spacious venue now allows them to attend, plus the very loyal dealers who have been instrumental in making our fair the success it has become, most of whom have never missed a fair. 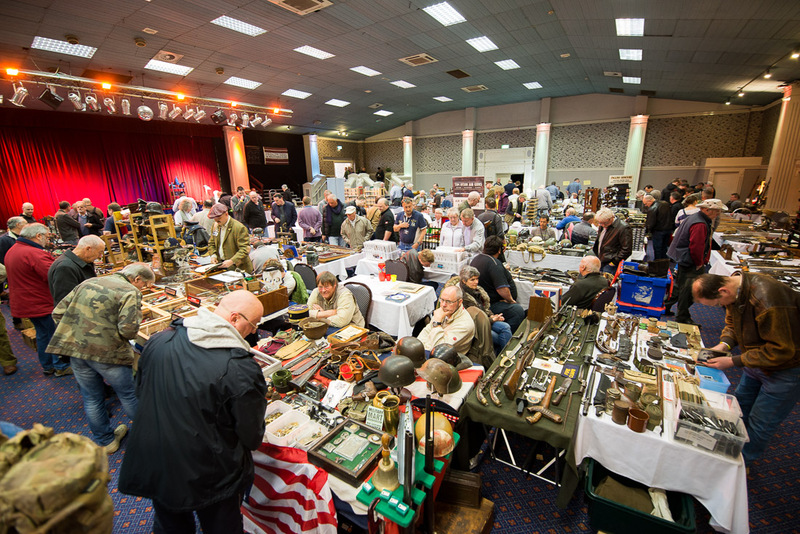 For those collectors who have not as yet had the Preston Arms Fair Experience, you are missing not only the friendliest of fairs but a fair committed to making your visit a truly memorable experience…Please see the pictures of our new venue in our Gallery section..
Until we see you again take care and best wishes to you all in finding that special item for your collection! 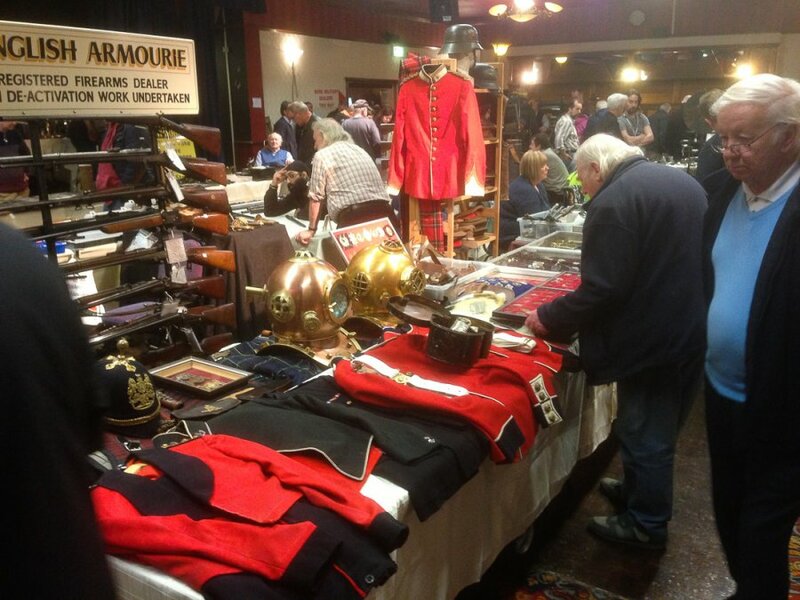 Our 9th November Fair was the last to be held at the Canberra Club, our new home from the 1st March 2015 will be in the Lancastrian Suite at the prestigious Park Hall Hotel, Charnock Richard, Chorley, Near Preston, Lancashire PR7 5LP. 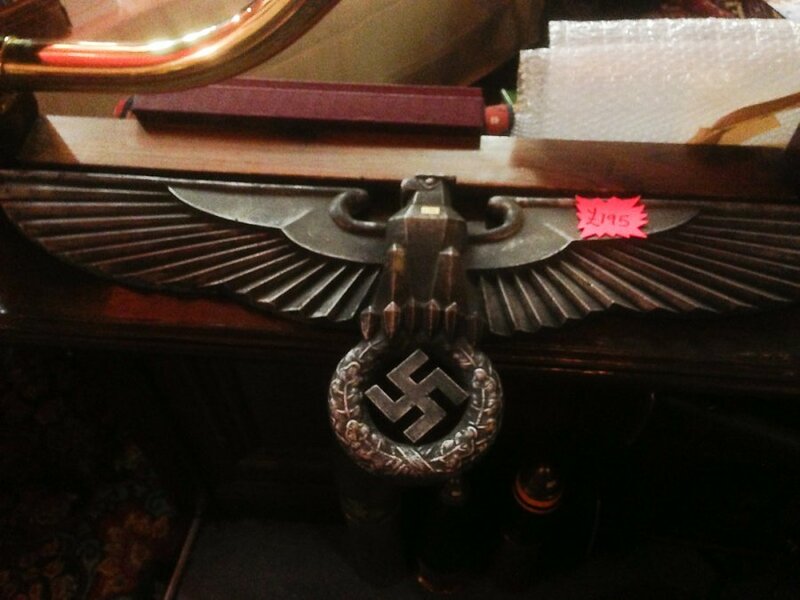 The move was considered very carefully. 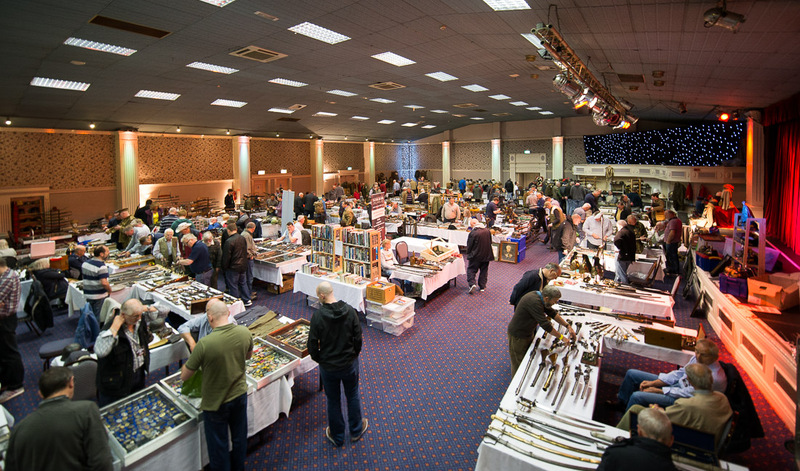 For some time now we have been turning down applications for tables from Dealers due to lack of space. 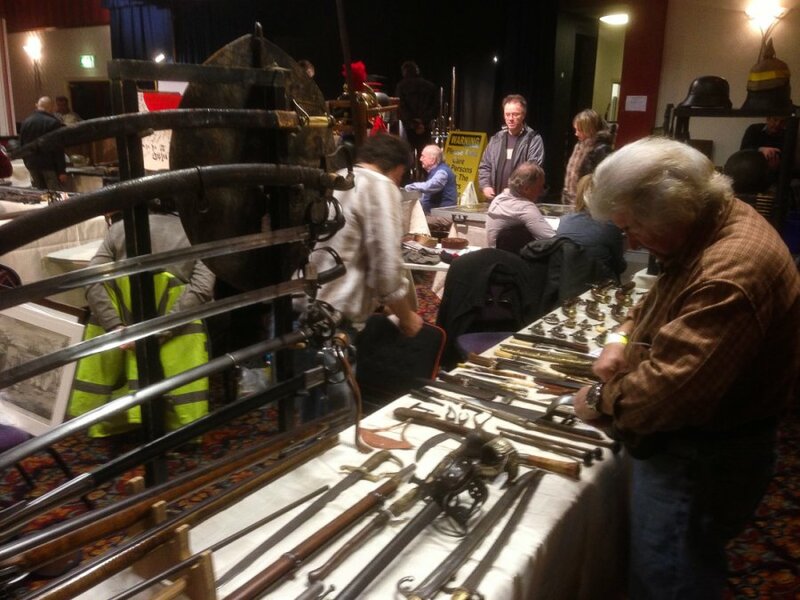 The Canberra Club is a superb venue but did not have the space we need to increase the size of the fair. 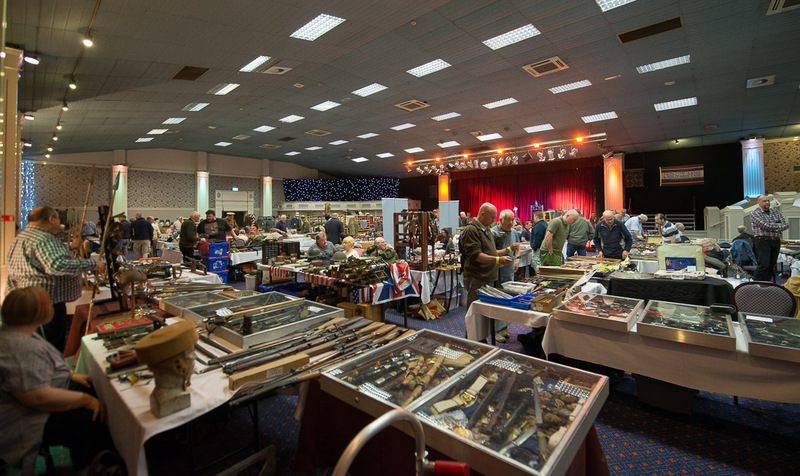 The Lancastrian Suite at Park Hall Hotel is an excellent venue that will give our Fair the space it needs, and has excellent access to the M6 motorway. 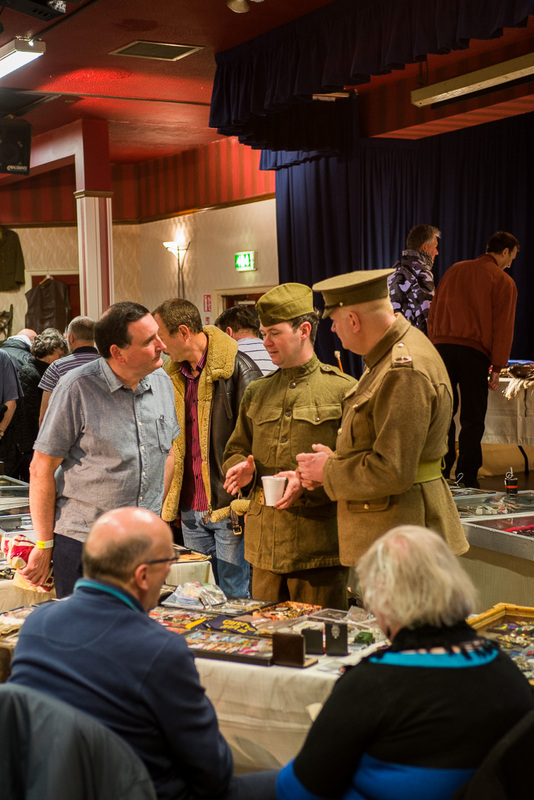 Naturally we are increasing the advertising substantially for the Fair, to now include the Manchester Evening News, the recent addition of our advert in the superb ” Britain at War” magazine has proved a success so we will continue with this. 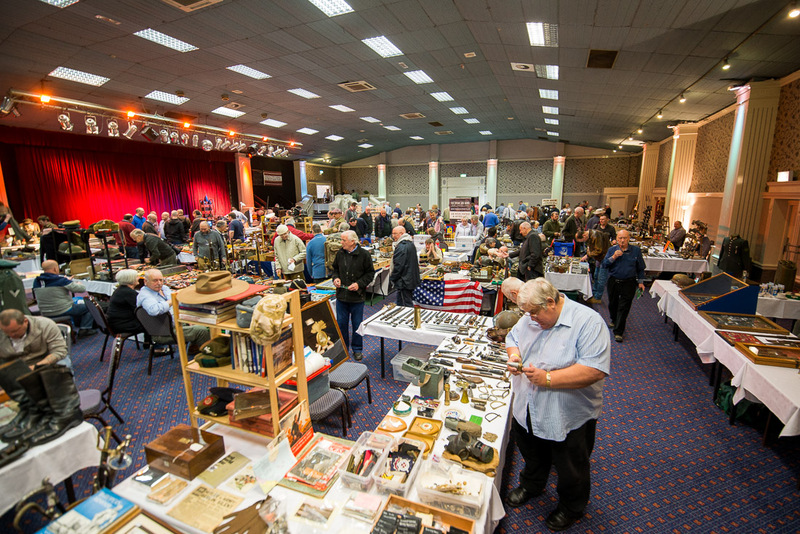 Our last Fair at the Canberra Club was very well attended and the day went well with very many satisfied collectors and dealers, we had some excellent military vehicles from “Tanks for Sale” on show and a superb group of WW2 Re-enactors from the North West Collectors re-enactment group gave a great atmosphere to the event….Well done Lads !! 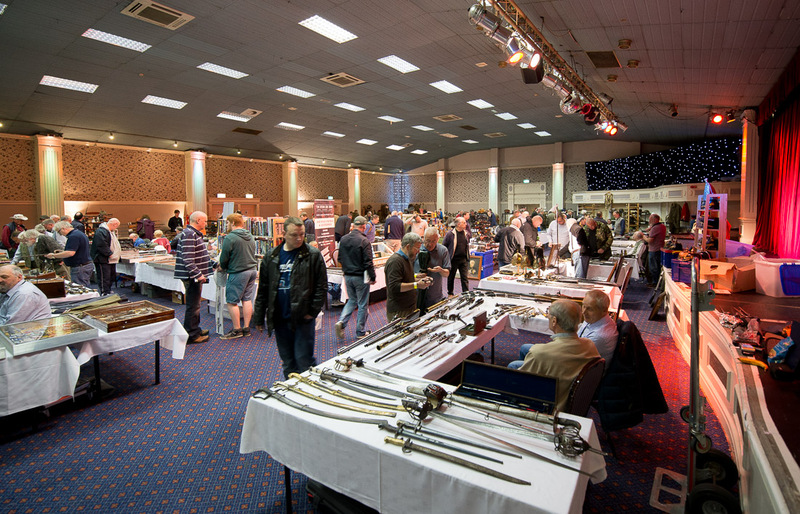 We look forward to 2015 and our new venue, and we hope to see all our regular and new collectors on the 1st March for what is shaping up to be a really superb event, and of course, new dealers are very welcome. 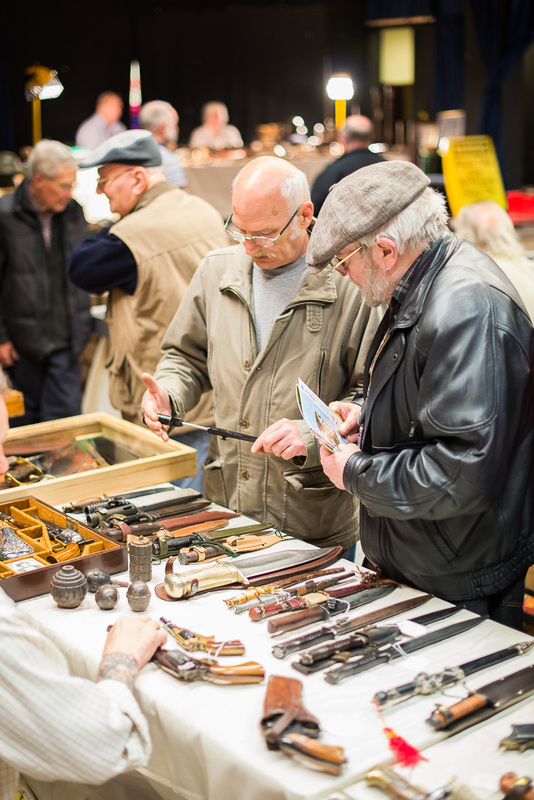 Take care and enjoy your hobby ! 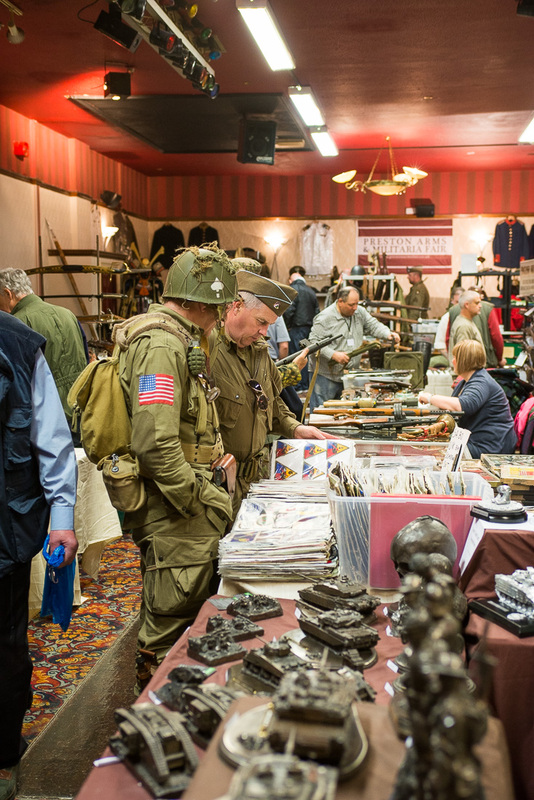 This was one of our best fairs yet! 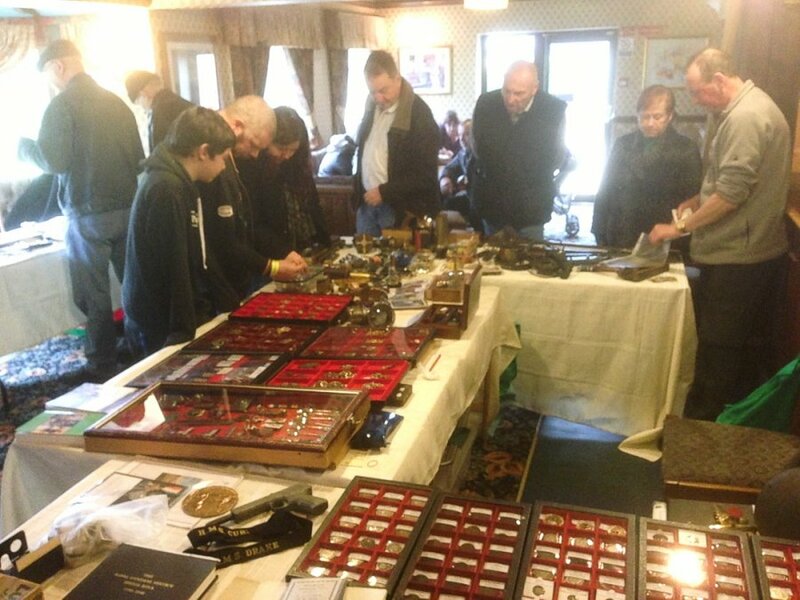 Although the weather turned rainy in the early afternoon, the attendance was excellent and many collectable items changed hands !! 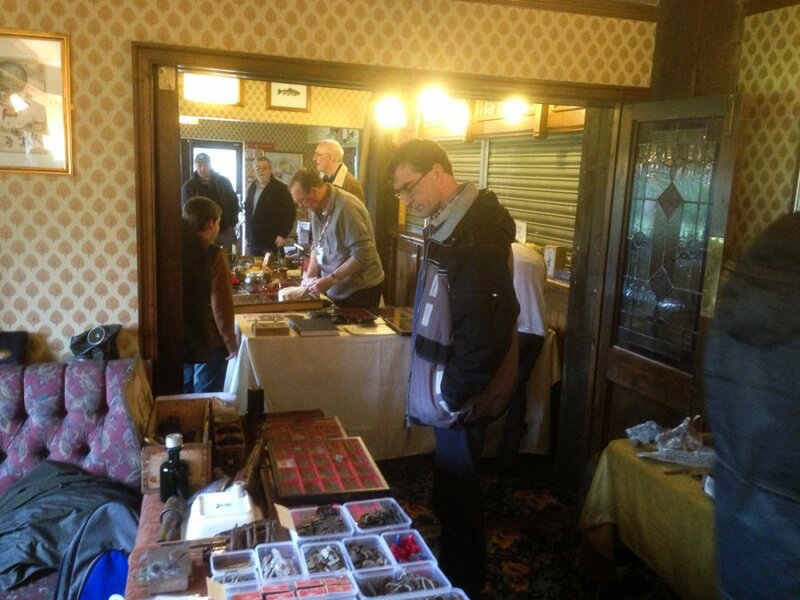 A great day was had by all ! 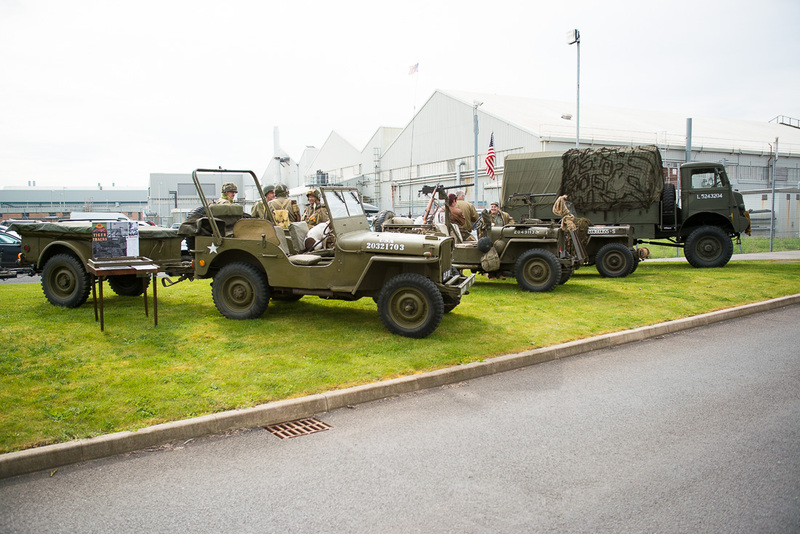 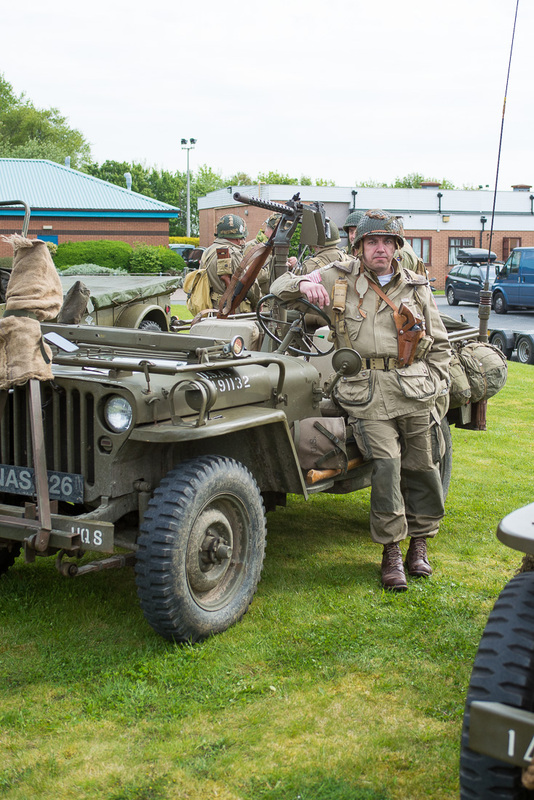 The Preston Arms Fair is very pleased to be associated with the North West Collectors Re-Enactment Group and we had excellent examples of both American and German Troops together with an original PAK ’40 German Anti Tank weapon and a 1943 Opel “Blitz” Lorry plus American “Jeeps”. 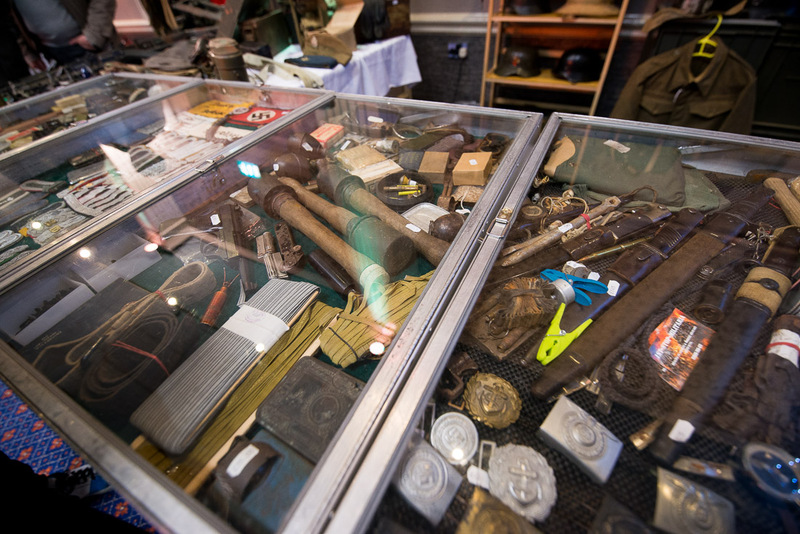 These German vehicles were supplied by the excellent Military Vehicle Dealers ” Tanks for Sale ” run by the enigmatic Duncan Nicholson who can be contacted on telephone number 07794 630476 for both sales and rental…. 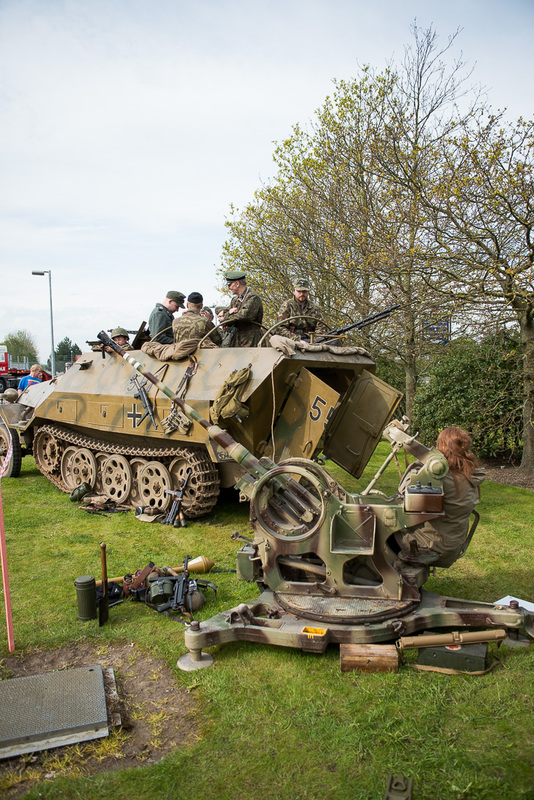 Duncan not only specializes in German vehicles and Artillery but also Allied and Russian too…….Many Pictures of the re-enactors and vehicles can be found on the link on this website…. 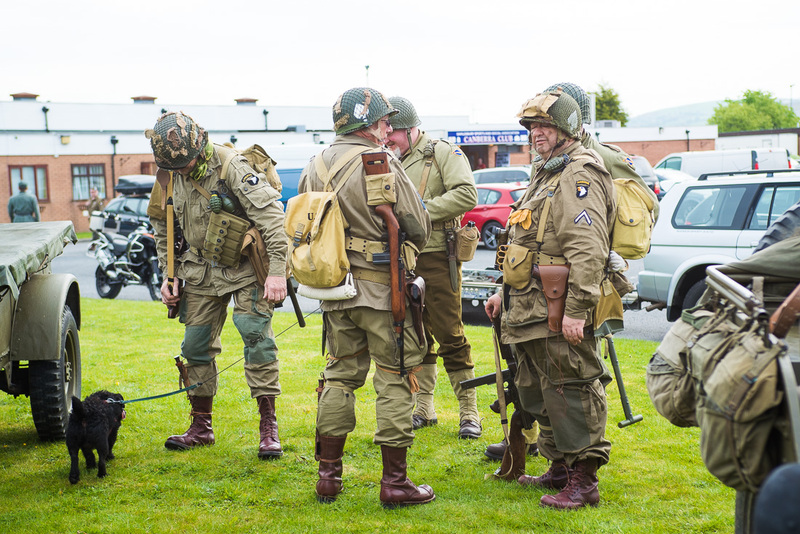 and they are available for Military Events with full battle enactments and film work…..
At our November Fair ( 9th November 2014 ) we will have more Rare Vehicles and some hardy troops to give authentic images of W.W.2 Soldiers and equipment……We are recruiting now so please ask if you would like to join us! 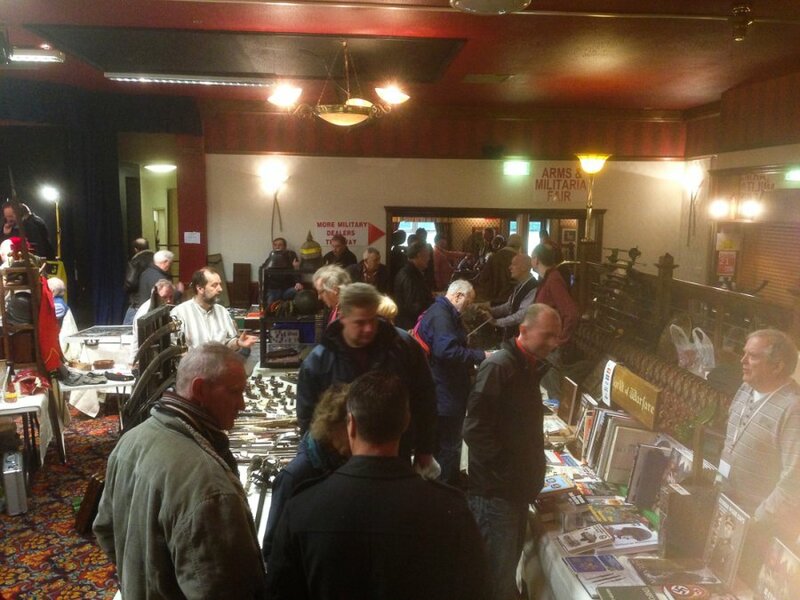 We hope to see you all again at Preston, and as always drive carefully and enjoy your hobby !! 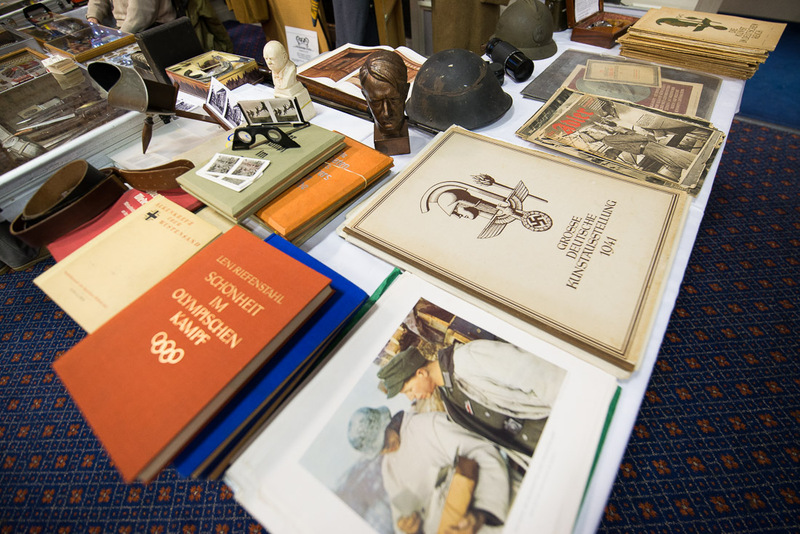 The weather was with us for our latest Arms and Militaria Fair and all the people who arrived enjoyed seeing the Allied and German vehicles including motor-cycle combinations, the “251″ German Halftrack from the new film “Fury” with Brad Pitt ( Due out in November this year ) the rare “Kettenkrad”, a Kubelwagon, a 2cm German Flak 38, superb American and British vehicles and an excellent turnout of Re-enactors from the excellent “North West Collectors Re-Enactment Group” (This group provides the Battle Groups/Vehicles for the East Lancs Railways 1940′s War Weekend at Ramsbottom, Rawtenstall and Heywood). 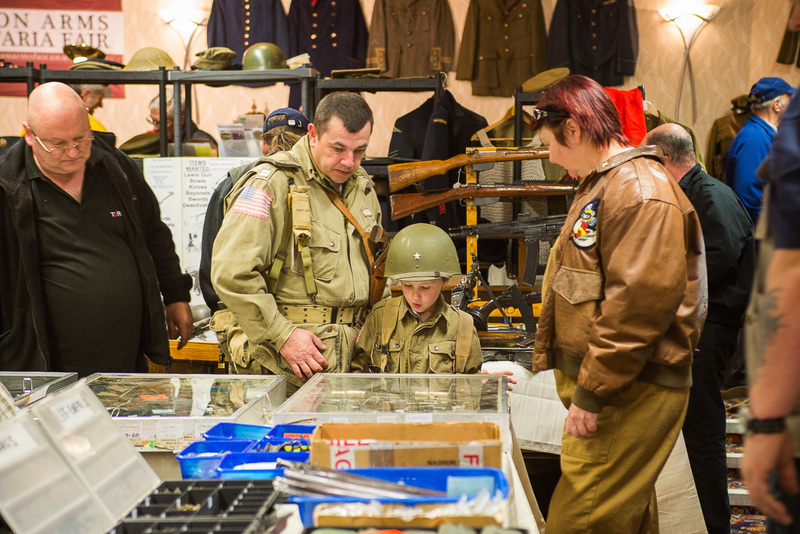 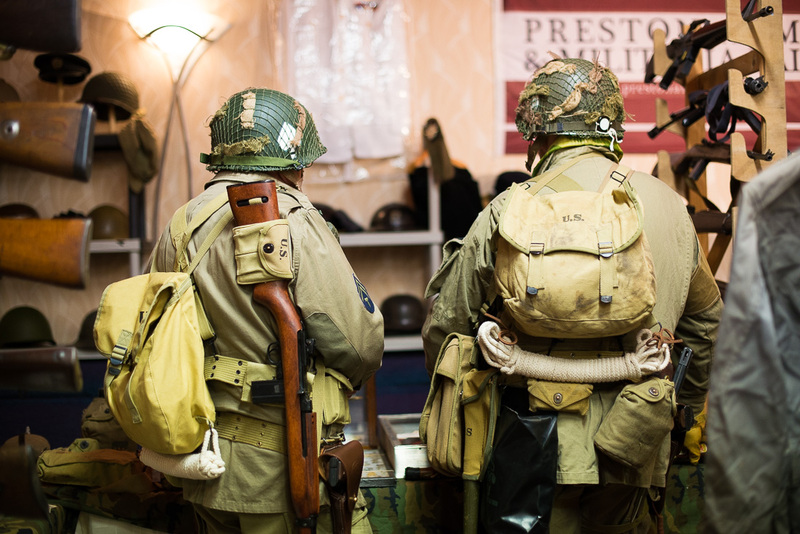 Visitors were able to see just what the soldiers of WW2 looked like and also what equipment and weapons they carried…….several new members were recruited to the ranks ! 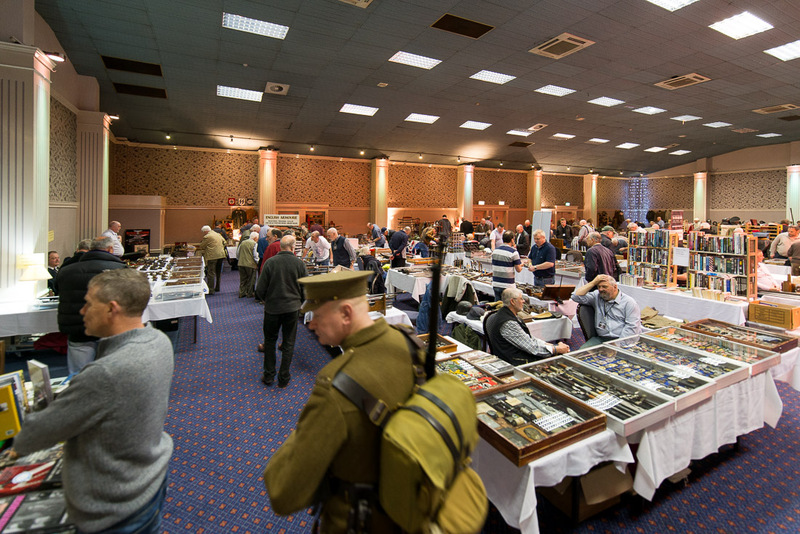 The fair itself was very well attended and many dealers attended from various parts of the country, our advertising reaching a large numbers of collectors in the UK interested in the collectables from the many era’s of history that are available at the Fair. 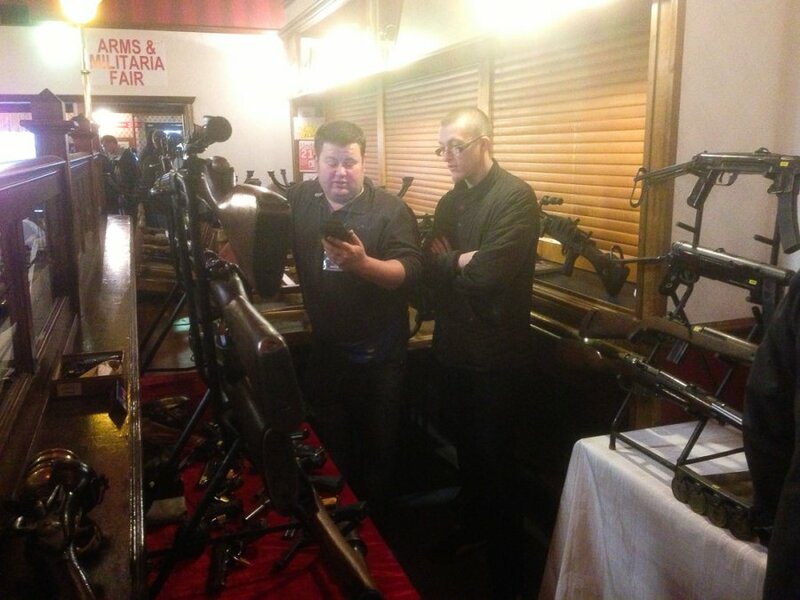 As always, Steven and his team from the Canberra Club made everyone very welcome. 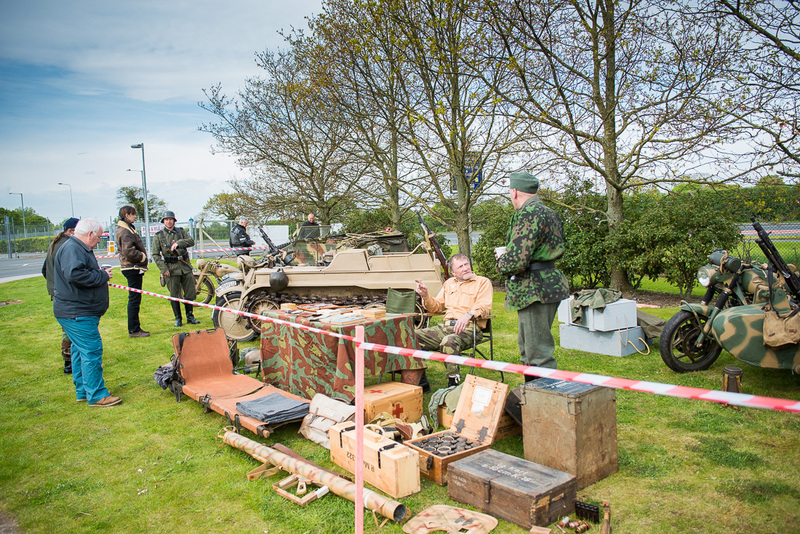 We are hoping to repeat the “Living History” event on August the 10th 2014, our next Fair, with British and American and German vehicles ,a German PAK 40 Anti-Tank weapon and 2cm Flak 38 Cannon and the Battle Groups of course plus some surprises! 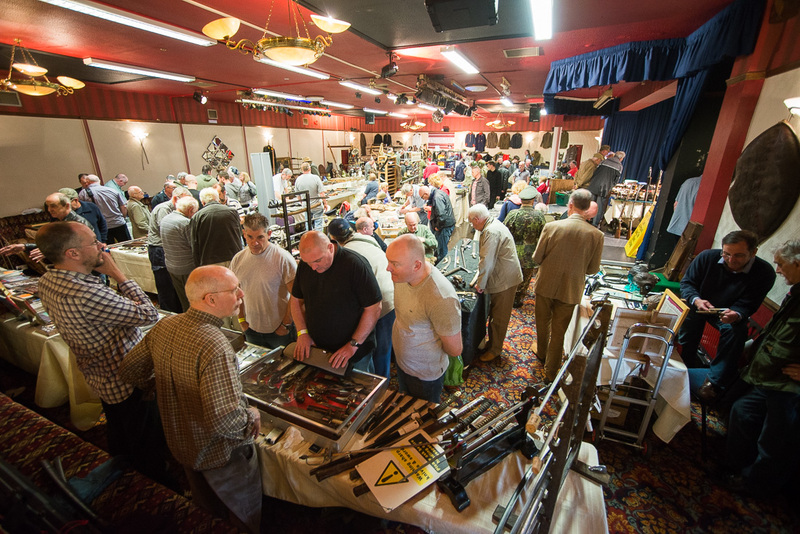 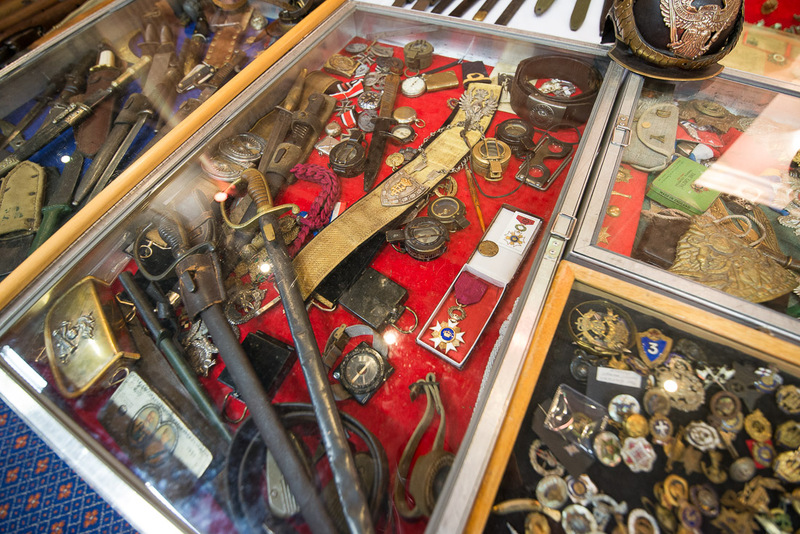 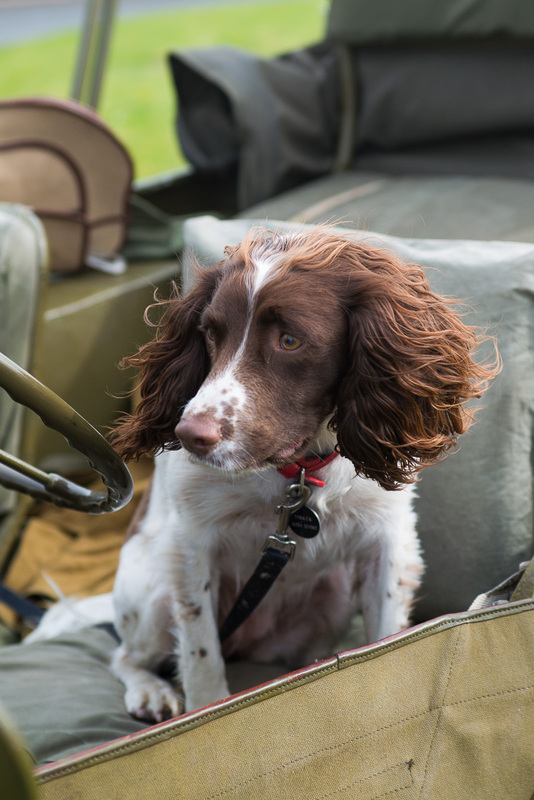 We hope to see you all at Preston Arms and Militaria fair in August and as always we wish you all happy collecting and safe motoring of course! 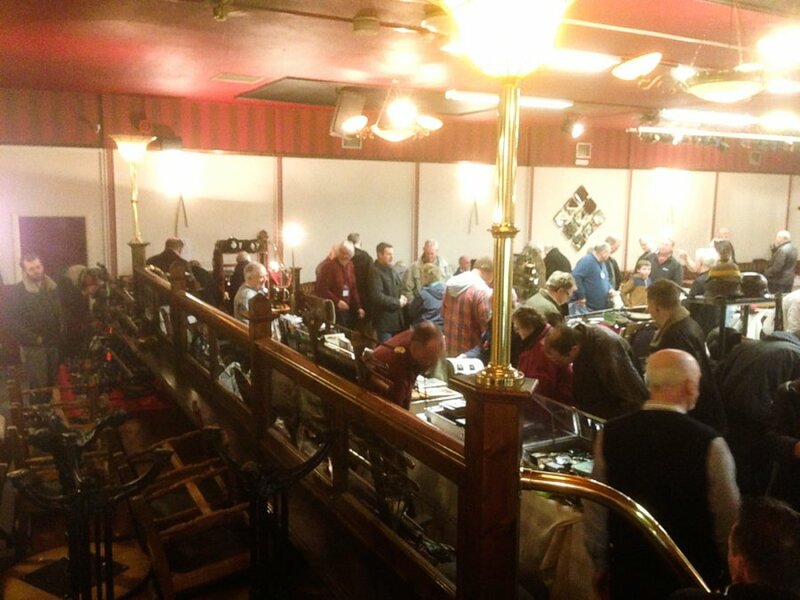 The first venue of the New Year did not disappoint ! 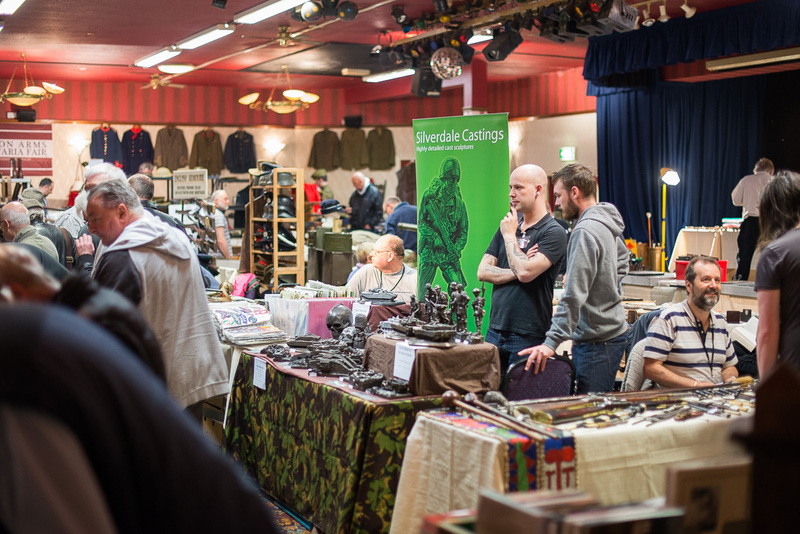 The best ever footfall and excellent, if windy weather, produced a great day for all. 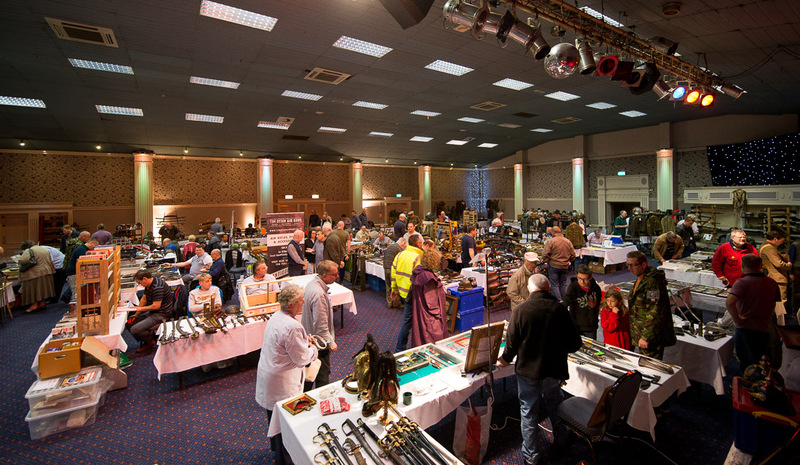 We had several new dealers and we have enlarged the venue to 38 Dealers who have tables ranging from 6ft to 24 ft. 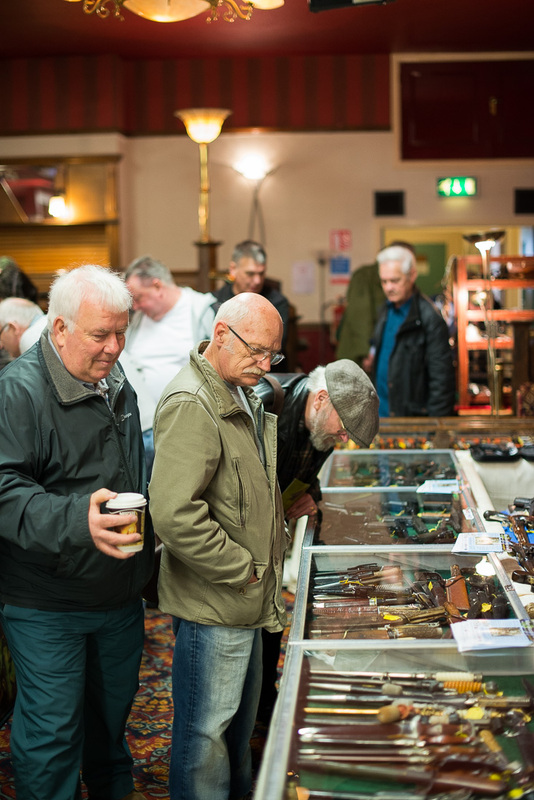 Very many of our dealers told us they had excellent sales, and the visitors also were in good spirits and enjoyed their visit. 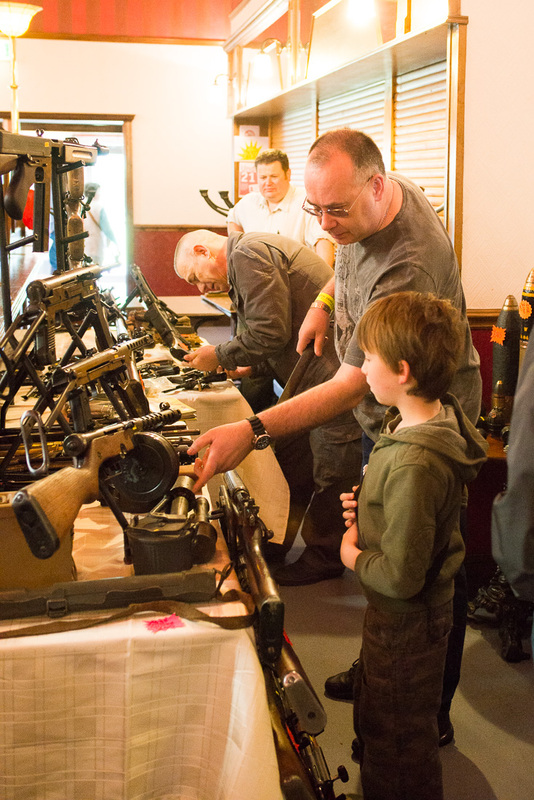 The decision to reduce the number of Arms Fairs each year from five to four certainly was the right thing to do, it gives our visitors time to save up for one thing and the event is a good thing to look forward to, sometimes less is more !! 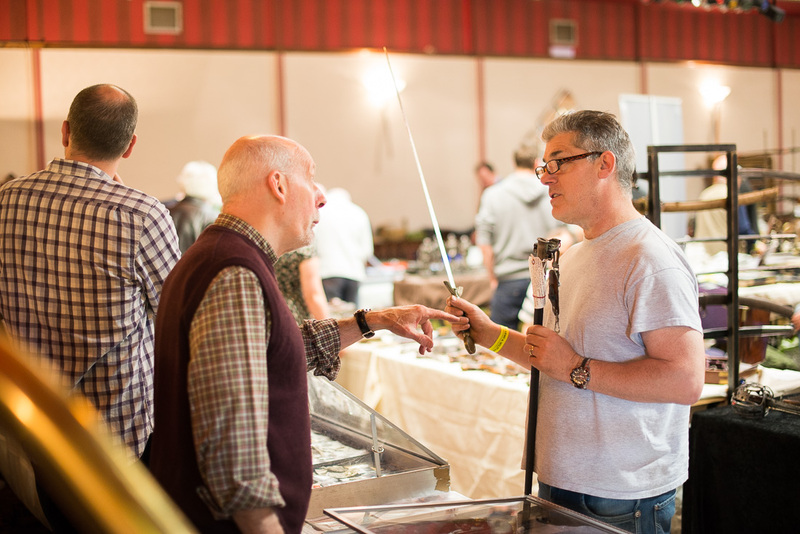 The catering was up to its usual excellent standards with Stephen Hill and his staff helping to make the event a great experience and of course the licensed bar was open from 11-30 am onwards. 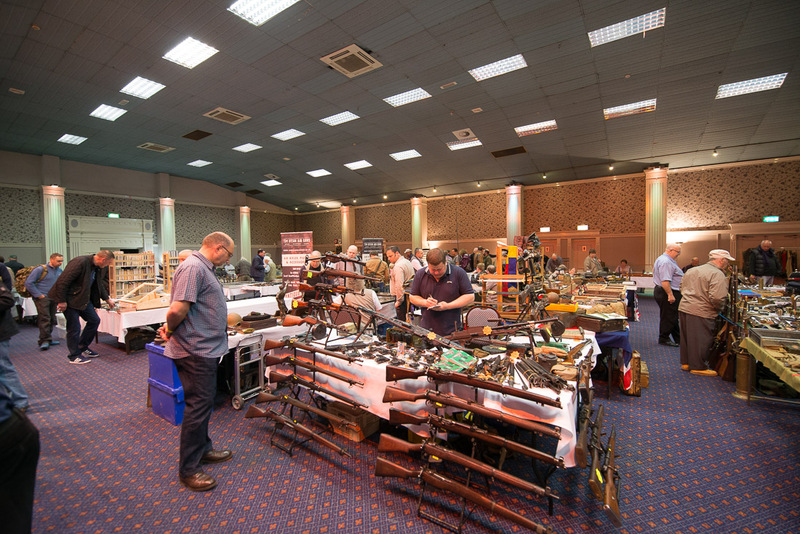 The dealers Raffle was won this time by Adam from Worldwide Arms Company..well done ! 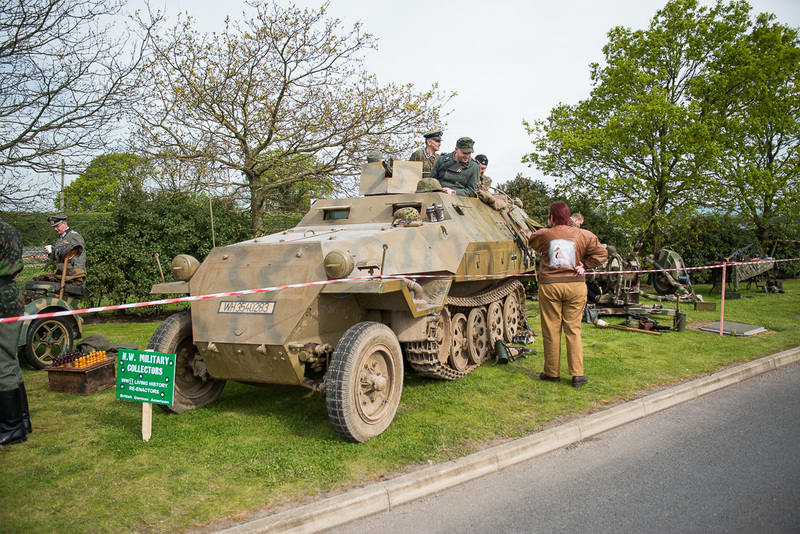 Our next fair is to be held on the 5th May 2014 ( Bank Holiday Monday ) where we will have the German 251 Halftrack that was seen in the new film “Fury” with Brad Pitt on show together with an original 20mm German Flak Gun. 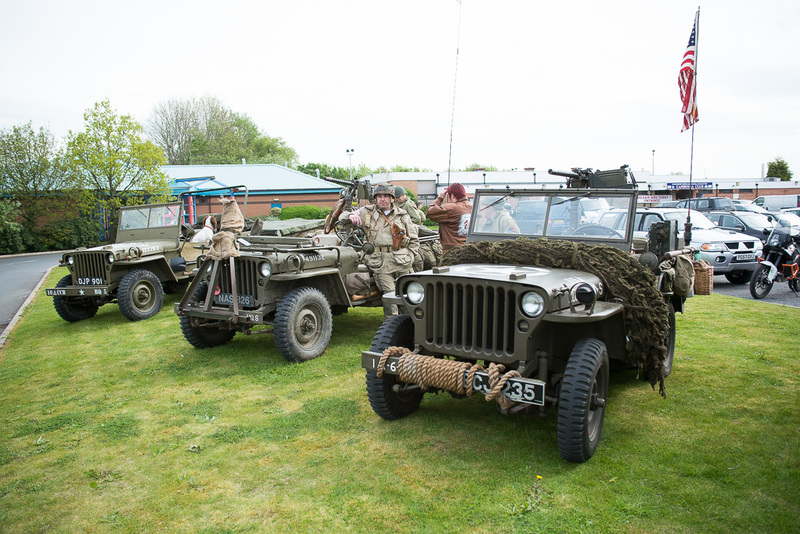 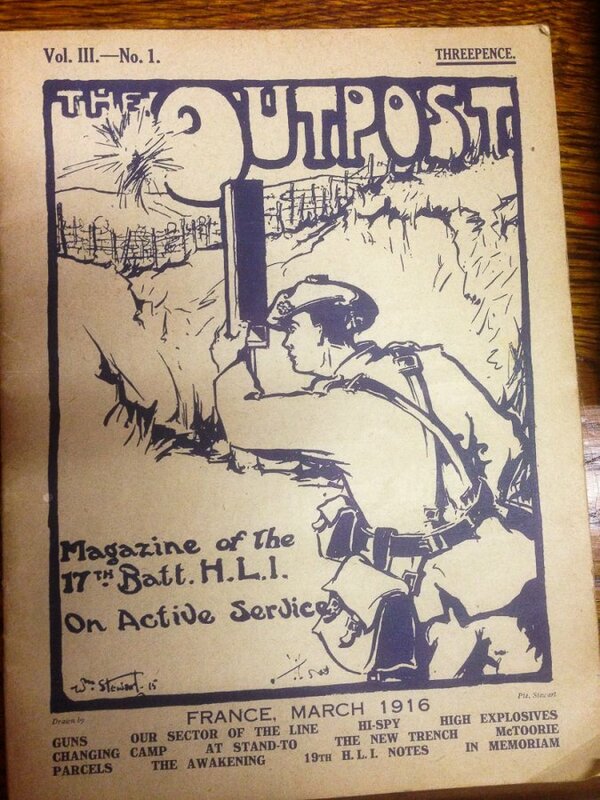 In addition we will have a 1942 British Army Lorry in mint condition. 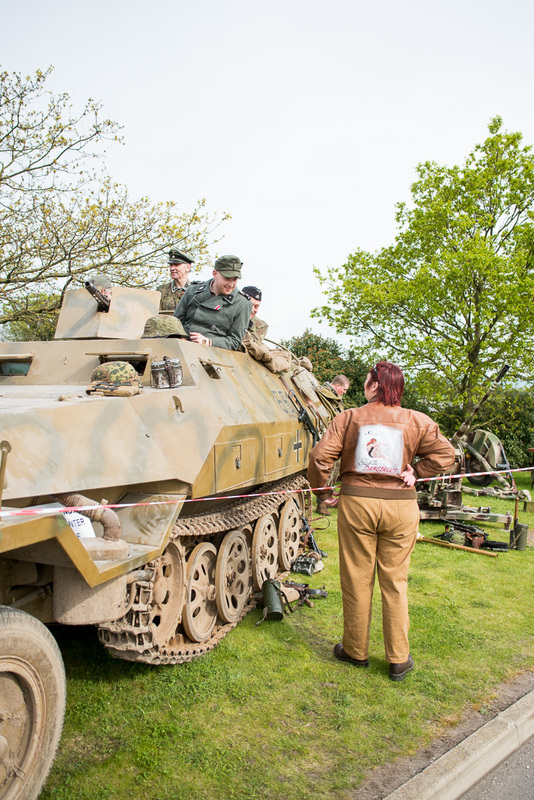 We are also very pleased that we will have Paul Marshall’s superb original Kettenkrad ( The German Tracked Motocycle ) and also we hope to have some other excellent American and German vehicles too to complete the event. 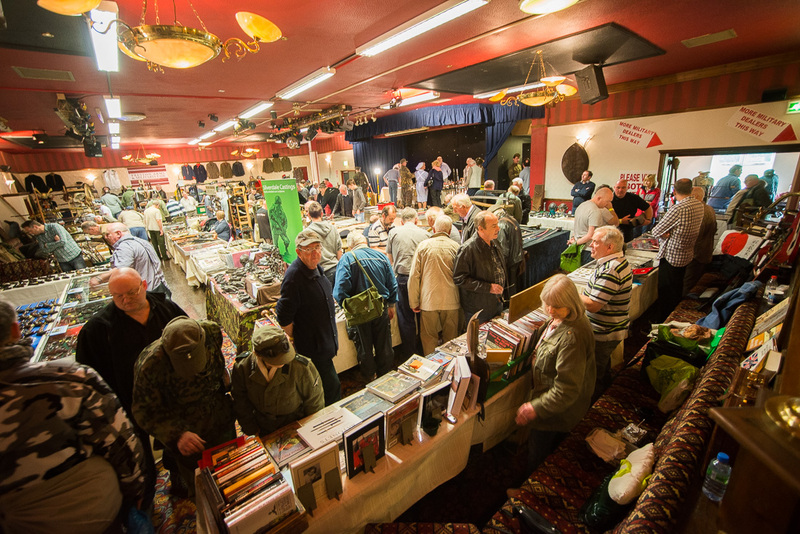 There will also be members of the N.W. 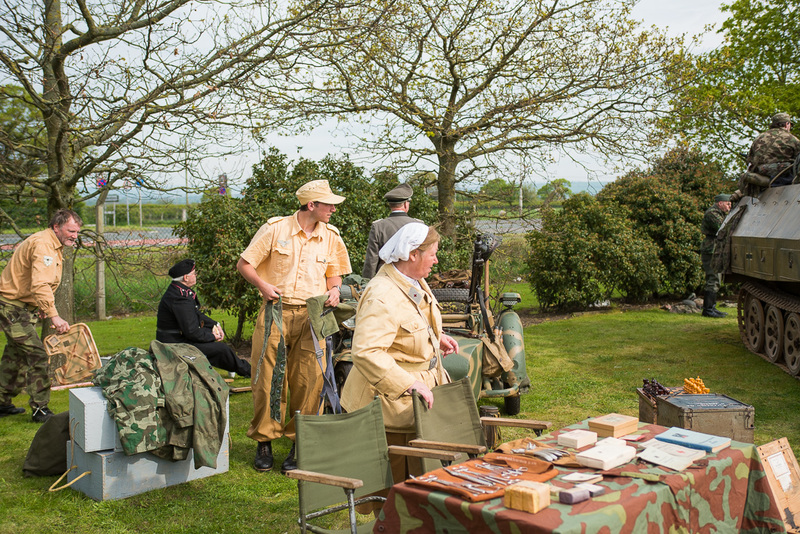 Collectors reenactment group present to add excellent realism to the event. 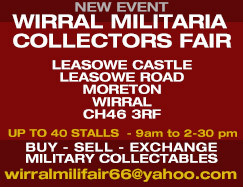 We hope to see you there, enjoy your hobby and take care all!